It’s amazing how something as pedestrian as an old-house website can turn out to be such a catalyst for multitudinous blessings. Through this website (and its accompanying page on Facebook), I have met so many people. With few exceptions, old house people are the finest people around. Two years ago, after the Bad Thing, I decided to shut down this website - as soon as I had the emotional wherewithal to do so. I put my Sears House ephemera in cardboard boxes and told my friend to give all of it to the local college library. I was done. I never wanted to see another Sears House again. Ever. Fortunately, my friend didn’t listen to me, and stashed the boxes in a storage unit. In short order, he retrieved them from a nearby storage unit, and my ephemera and I were re-united. That’s something for which I’m also very grateful. 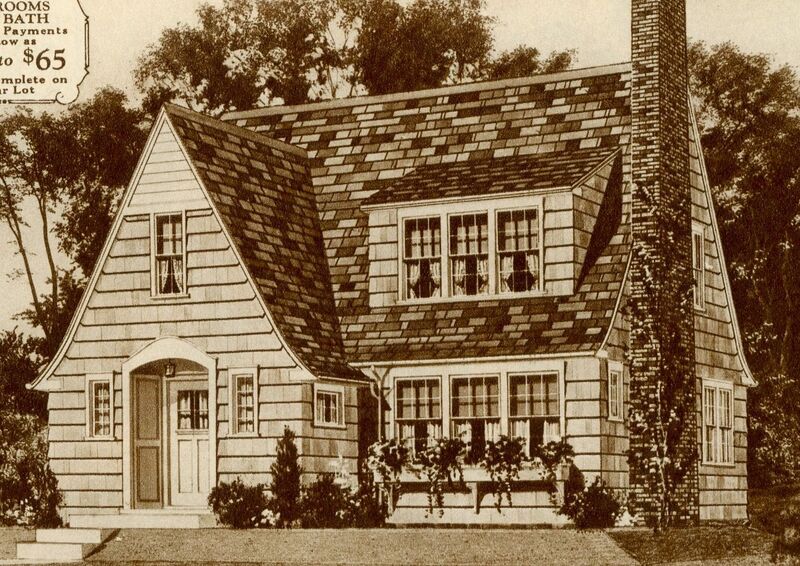 Rediscovering those almost lost catalogs stirred something in me, and gently pulled me back toward my first love: Old houses. And through writing blogs on a host of topics (including grief and pain), I was surprised (and delighted) to find that I felt nurtured and buoyed by the kind words of long-time readers. I still re-read those supportive comments again and again and again. When visitors to this site leave comments, openly sharing their own stories of tragedy and loss, I feel so very comforted. I feel less alone in my tragedy and pain. I feel less alone in the world. It’s as though those people - people struggling under the heavy weight of their own pain and suffering - have opened up the circle around their heart and invited me in. It’s a sacred sharing, and I treasure every insight, every kind word, and every loving thought. I will always remember how that made me feel, so thank you for that. And if you’ve been a faithful reader of this blog but have never left a comment, I hope you’ll do so now. And if you’re one of my faithful commenters, I hope you’ll leave a comment today! Learn how to identify Sears Homes by clicking here. 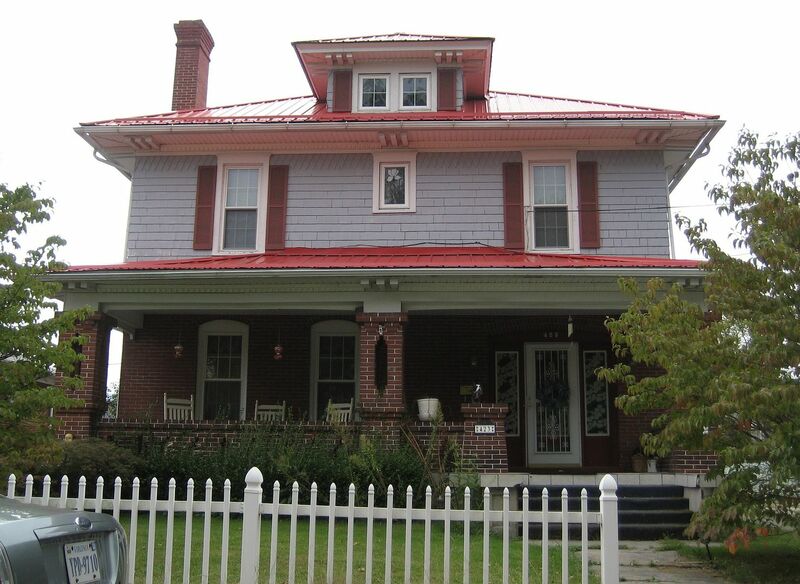 Read about one of my favorite Sears Homes in Hampton Roads here. My blog passed a milestone recently with 2.5 million visitors. Yesterday, I celebrated my 59th birthday with a group of faithful, loving and supportive friends. It truly was one of the loveliest events in my lifetime. Despite having such a wonderful day, I suffered from horrible nightmares last night (July 5th). By 6:00 am this morning, I was dressed and on my bike, pedaling as fast as I could to stave off the anxiety. I'm happy to say that it worked. On the ride home, I saw this image and captured it with my fancy phone. This is less than one mile from my home in a suburban area in Suffolk. Last week, a friend and I traveled to Douthat State Park in Clifton Forge, VA to visit my favorite old haunt, Cabin #1. 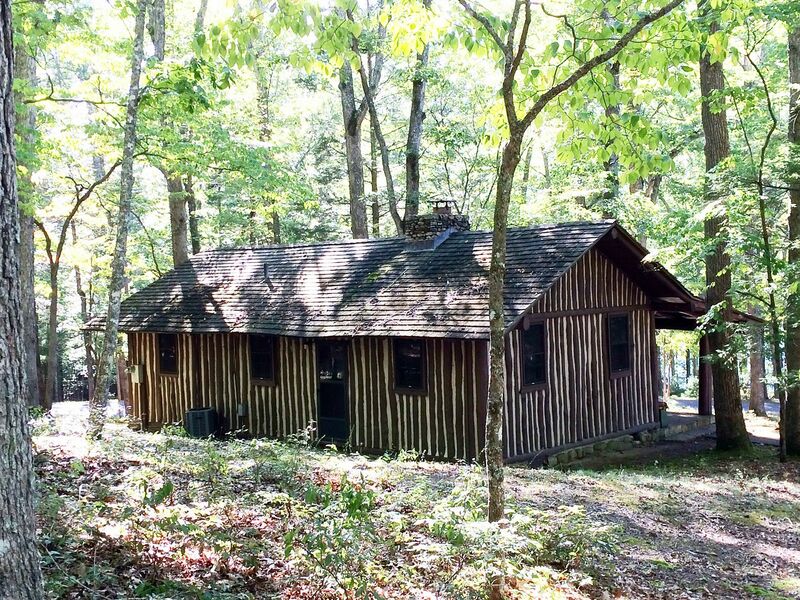 One of 38 cabins in the park, Cabin #1 is the only cabin with vertical logs. Douthat was built in the 1930s by the Civilian Conservation Corps and it underwent a massive restoration in the late 1990s. 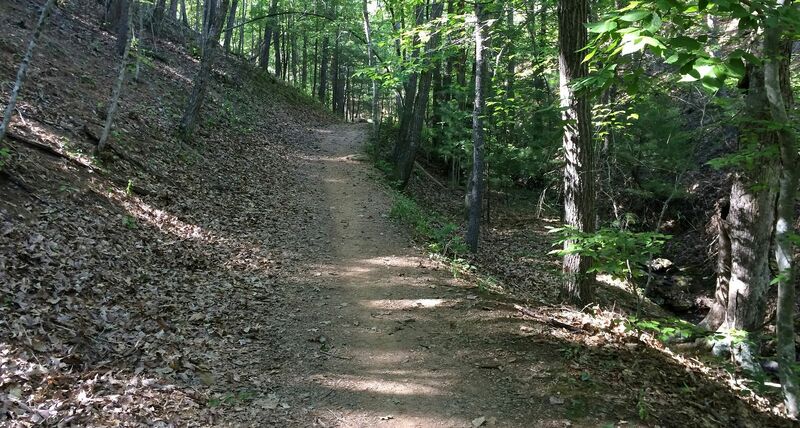 Douthat State Park is a beautiful place, nestled in the Blue Ridge Mountains. 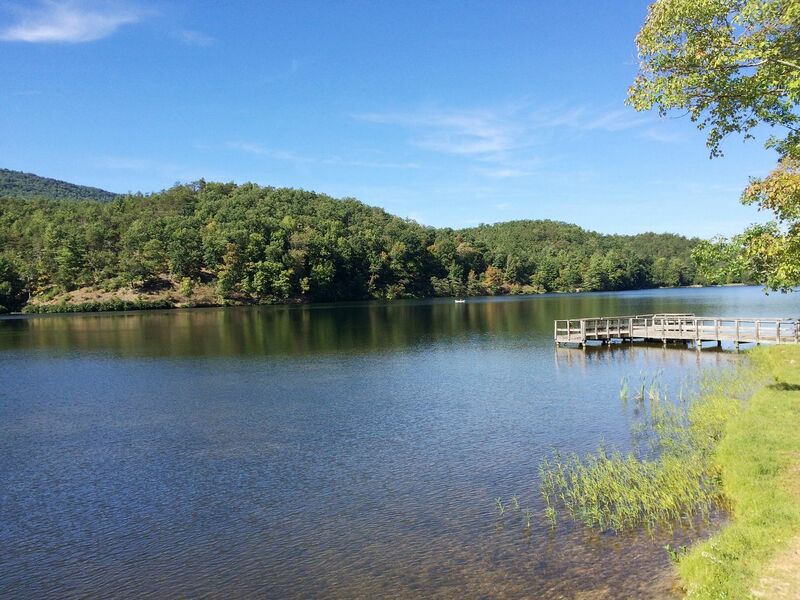 Lake Douthat offers fishing, boating and swimming. The lake is stocked with Rainbow Trout and other tasty fishies. There are bears throughout the 4,500+ acre park, but I didn't see any. Then again, I was too much of a wuss to hike but so far on these isolated mountain paths. One day during my stay in Douthat, I visited nearby Covington (which is not as pretty as Douthat). Covington certainly looks like it should have an abundance of kit homes. Much to my chagrin, I only found three. One of them was The Aladdin Plaza. Aladdin, like Sears, sold kit homes through their mail-order catalogs. 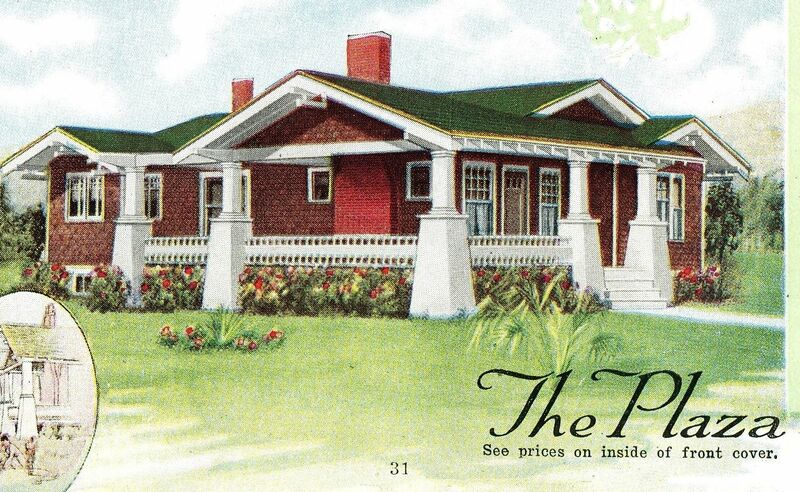 These houses were 12,000-piece kits and were shipped by train (1919 catalog shown). Despite a fairly intense search (my second in three years), I found only three kit homes. The Aladdin Plaza was one of them. It was about a block away from the city park. The other find was this Sears "Auburn," also known as model 264P176 (1914 catalog). 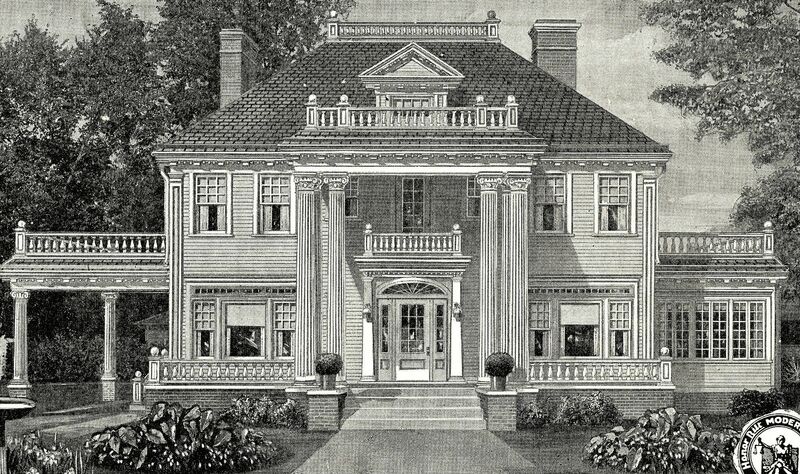 The Auburn was a spacious house with more than 2,500 square feet (not counting the porches). 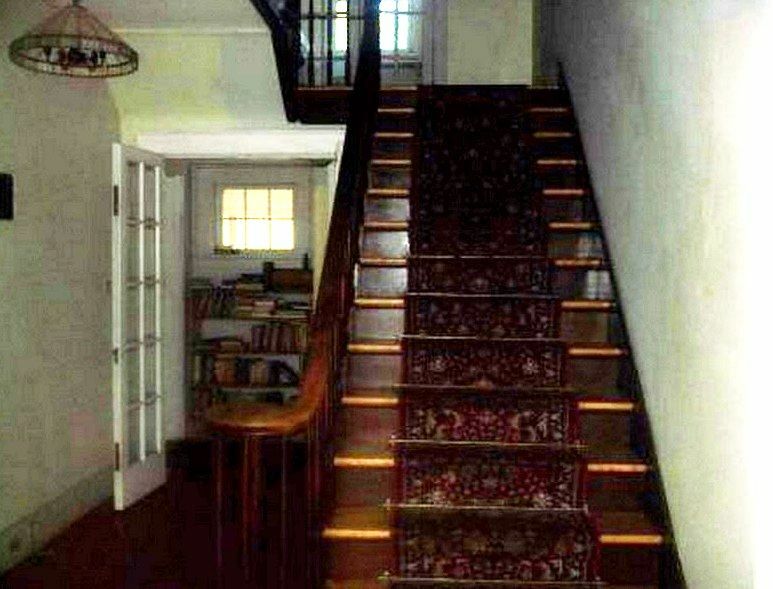 It has two parallel staircases (main staircase and servant's staircase), each with a small landing window. The many distinctive features make it easier to identify. 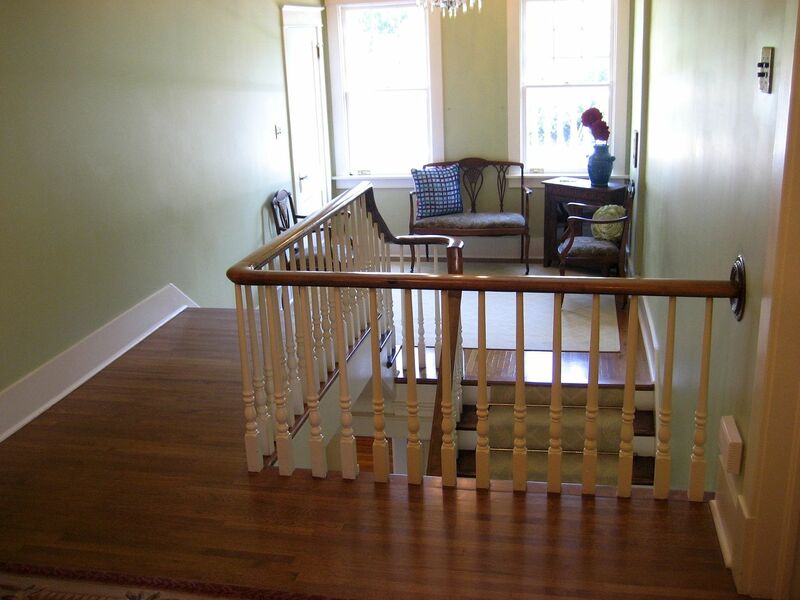 Upstairs, it has spacious bedrooms and a sleeping porch. All in all, it's quite a house. The house in Covington is a perfect match. Put the two images side-by-side and you've got something. And from this angle, you can see the two small stair-case landing windows. Towards the right rear, there was a double window which has been replaced. You can see the "repaired" brick. Along the second floor right-side wall, there are only two windows (at the front and rear of that long wall), which is as it should be. Also the distinctive bracketing is spot-on. 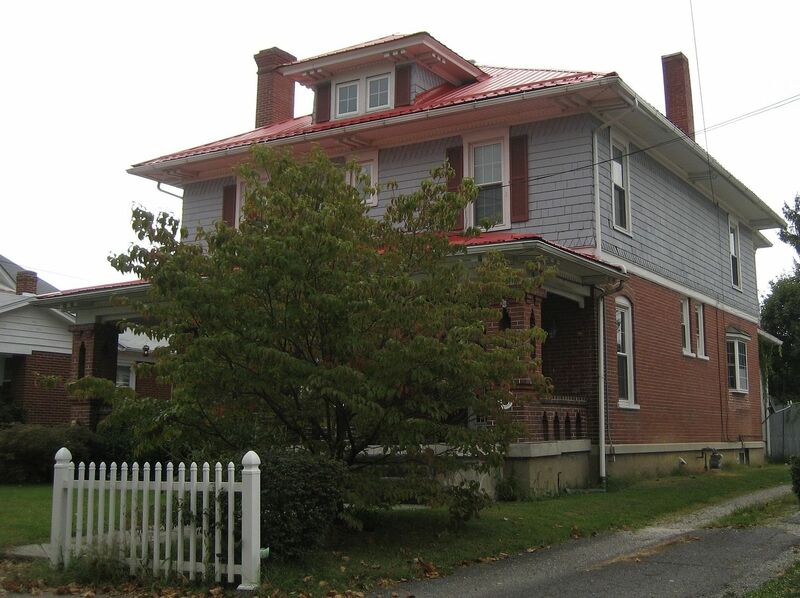 This view shows the detail on those brackets, and the porch columns. In another section of town, high above the neighborhood that houses the Aladdin Plaza and Sears Auburn, I found the fancy homes on the curvilinear streets (and with the beautiful views). It was up there that I found a single Sears kit home, "The Lynnhaven." All in all, I was very surprised to find only three kit homes in the entire city. This was my second visit, and between the two visits, I don't think I missed very much! 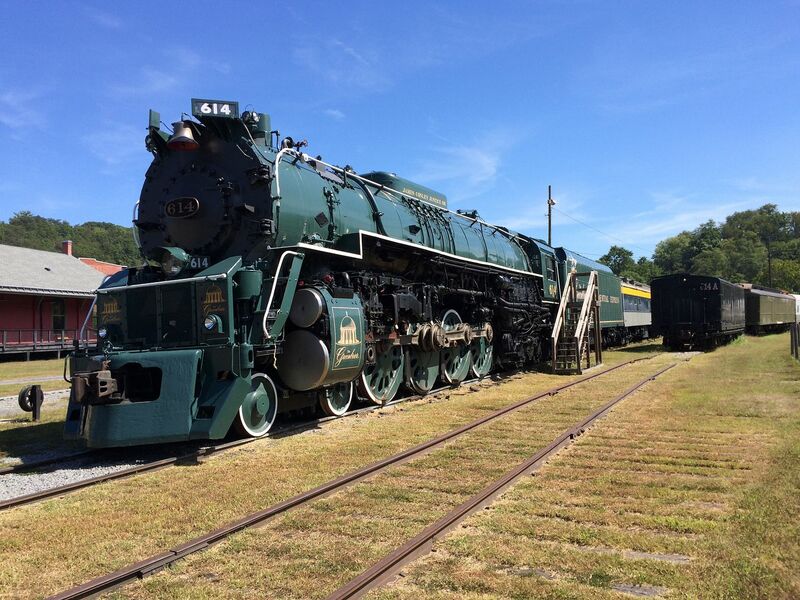 By the way, while you're in Clifton Forge, you should stop and see the train museum there. It's well worth the visit and the $8 admission supports a very worthy cause. I've been there four times, and I highly recommend it! By the way, if anyone knows what happened to "The Merry Widow" (shown above) please let me know? I couldn't find it on this most-recent trip. It's been sitting in this spot since 1952. If you know anything about Covington, please leave a comment. I’d love to know where you’re hiding the kit homes! 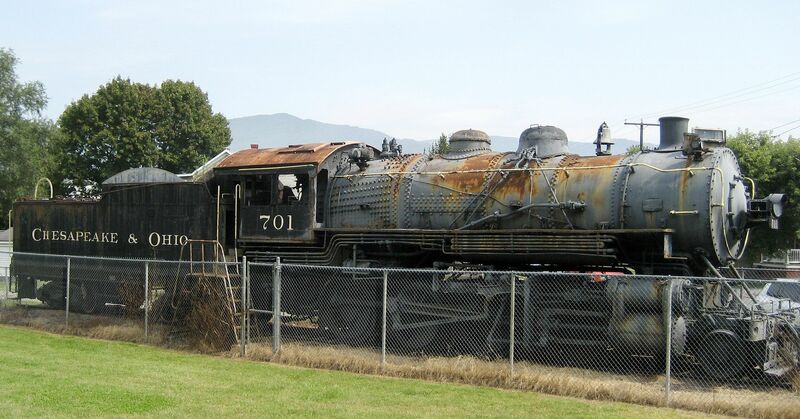 And I’d also love to know more about the status of the Merry Widow (steam engine). 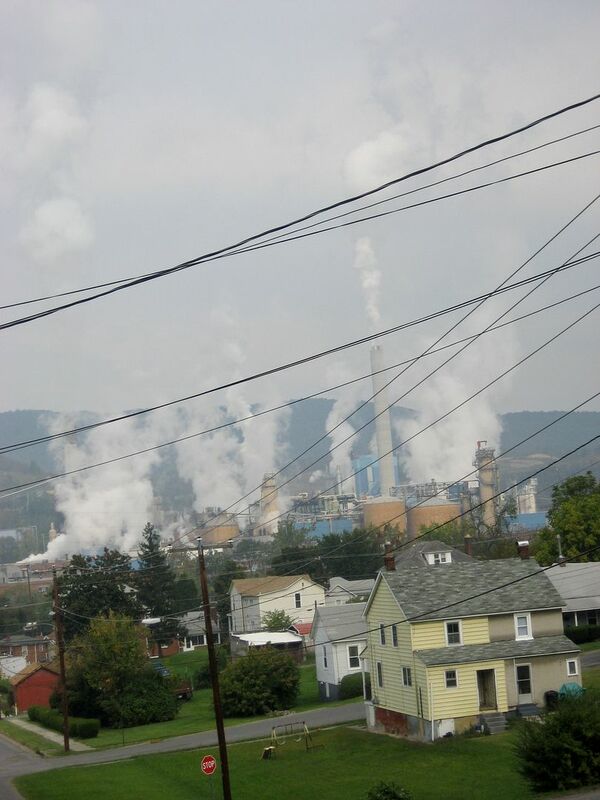 To read about my prior trip to Covington (in 2012), click here. I’ve found an abundance of Sears Homes in Clifton Forge (next door to Covington). Today, we moved the furniture back into the dining room! This project is officially finished! And boy am I glad to have an entire dining room’s worth of furniture OUT of the living room. Below are the final photos. To read about the whole project, click here. 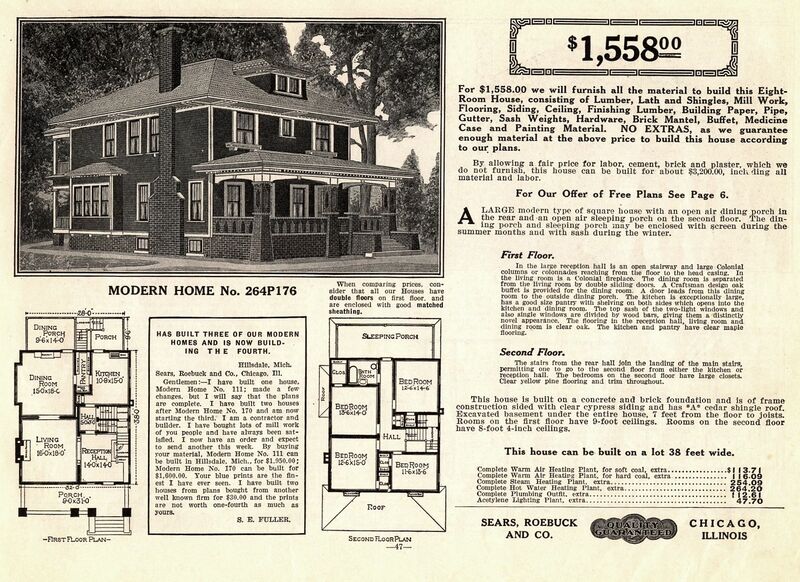 Interested in learning more about Sears Homes? Click here. 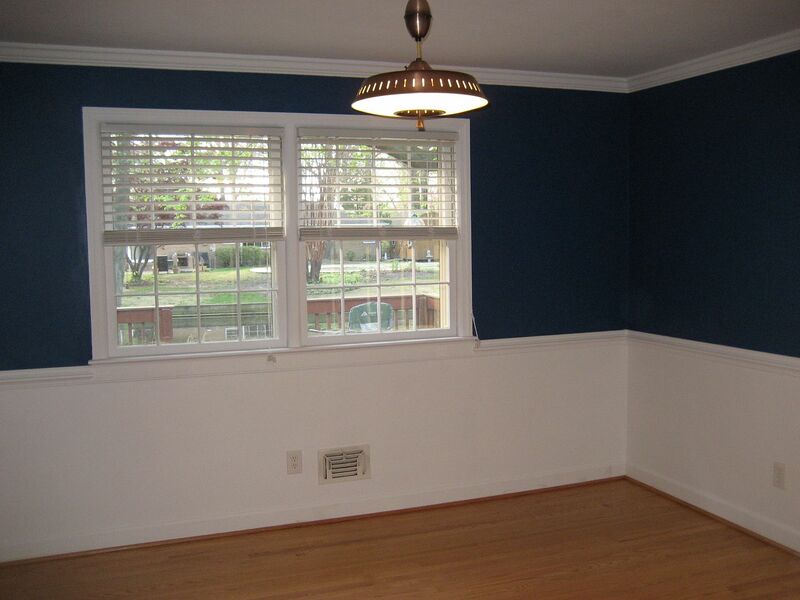 The hardwood floors came out beautifully and really made all the difference. It really adds warmth and a nice color. Mr. Hubby is trying to talk me into removing the wall-to-wall carpet from the living room and hallways, but I'm not keen on that. 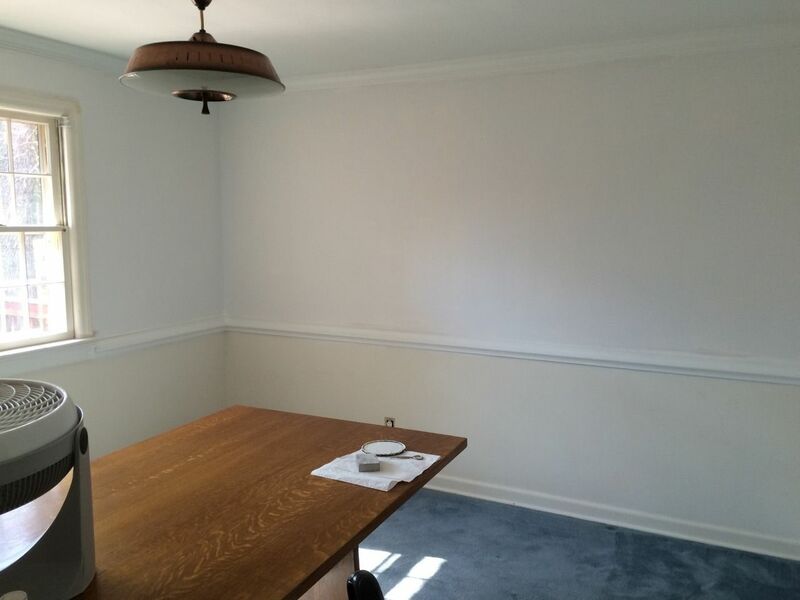 I also re-upholstered the dining room chairs in white, to complement the white walls. The material is called "Pleather" which just cracks me up. Does that mean it comes from plcows? A fun comparison of the before and after shots. Updated! See the latest photos in Part II! 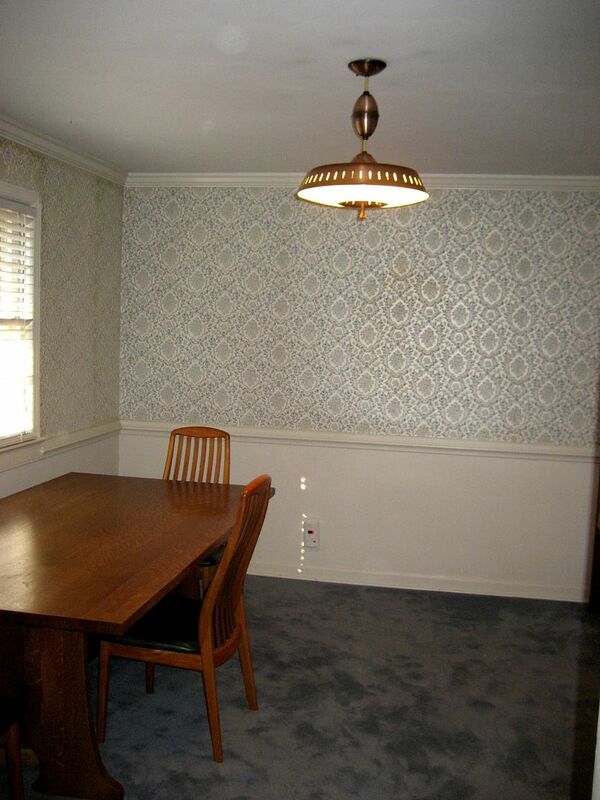 When we first looked at our current home in Norfolk, we really liked the flocked wallpaper. 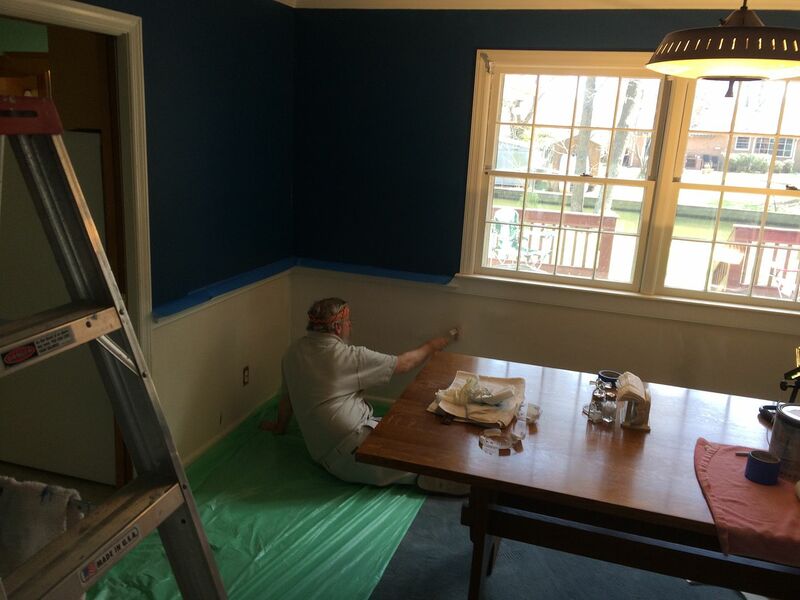 It was very 1970s and we liked the 1970s, but as we started painting the other rooms, we realized the dining room was pretty "tired. 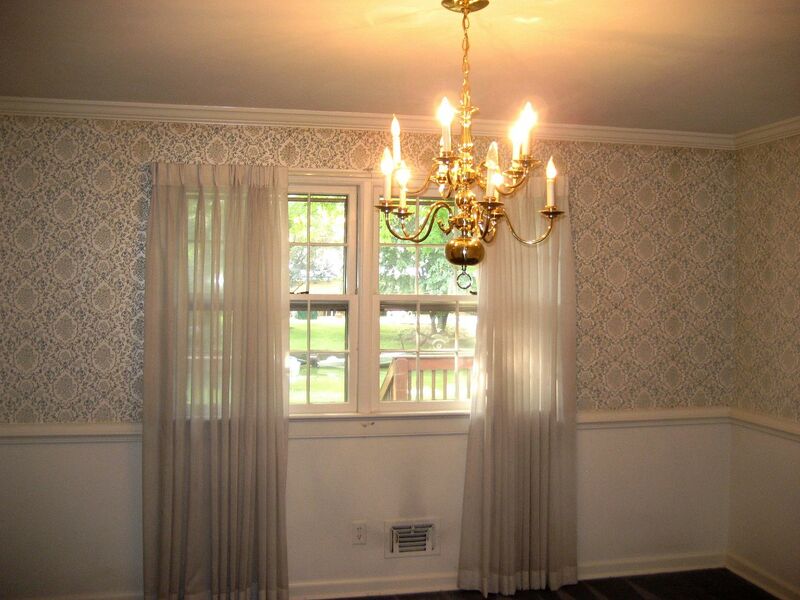 "The wallpaper had turned brown in some places. .
One of the first things we did when moving in (four years ago) was to take down the sheers. 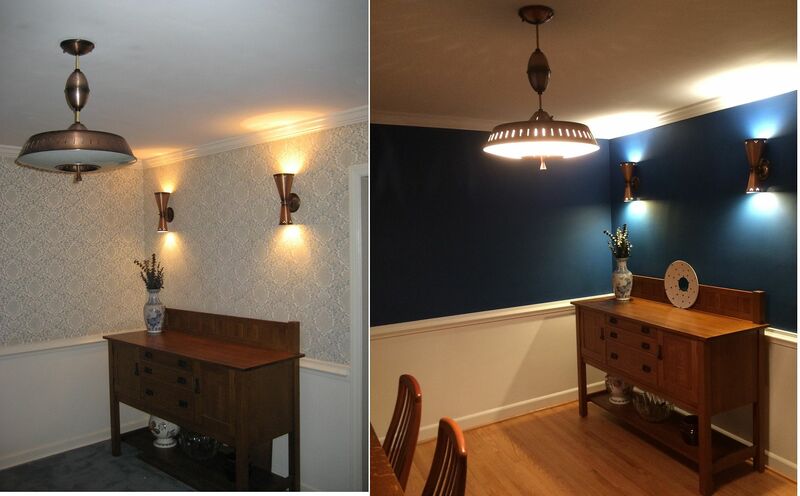 Last year, I was able to replace the chandelier, and that improved the room a lot. 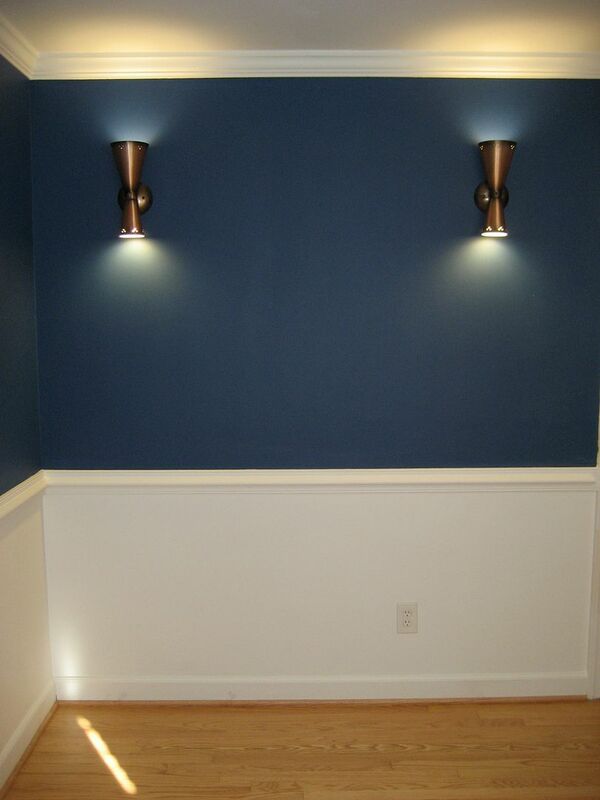 The matching sconces added some flair, too! Best of all, this photo shows the detail on that 1970s wallpaper. 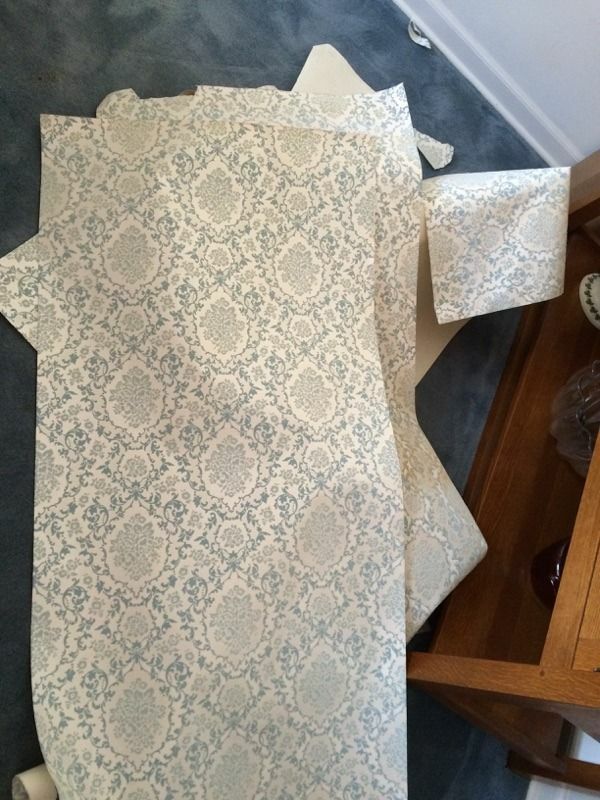 When I started pulling down the old blue wallpaper, it went very quickly. In fact, it came off in whole sheets. Easiest wallpaper removal I've ever done. And boy oh boy, was it dirty. I was surprised by how much fine dust was trapped in all that flocking. 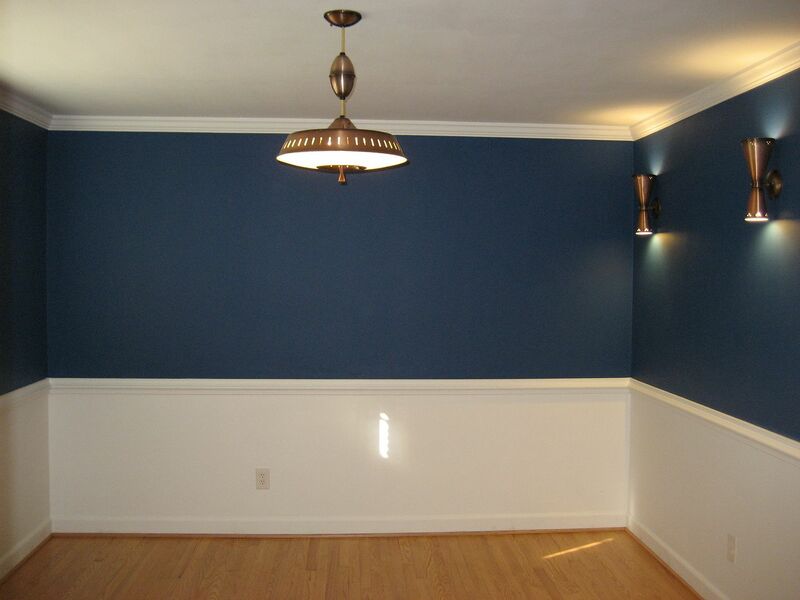 The walls in our 1962 ranch had never been painted (which was a surprise). 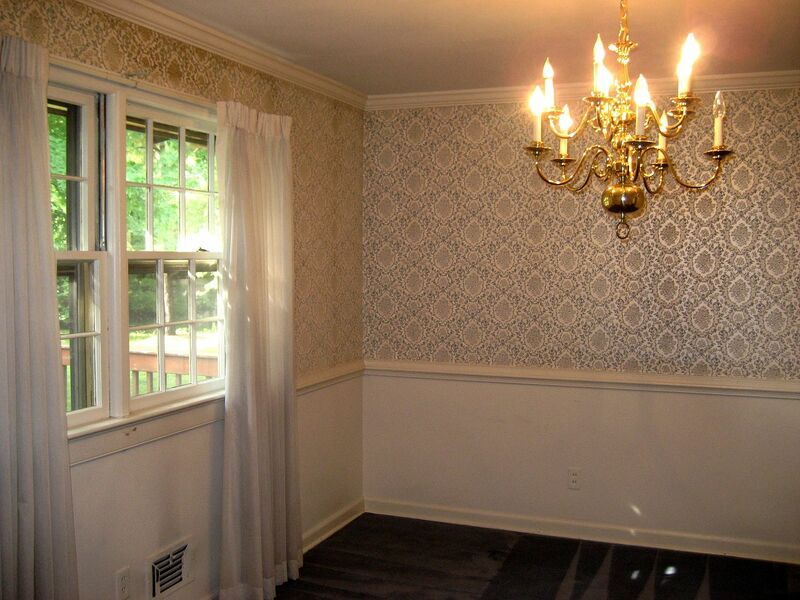 But the bigger surprise was that the walls were covered in wallpaper glue. That had to be removed before we could start painting. And that turned into a horrible mess. I used a combination of hot water and vinegar, but that didn't do much to break down the glue. At one point, I was ready to drop my sponge into the bucket and give up on the whole project. 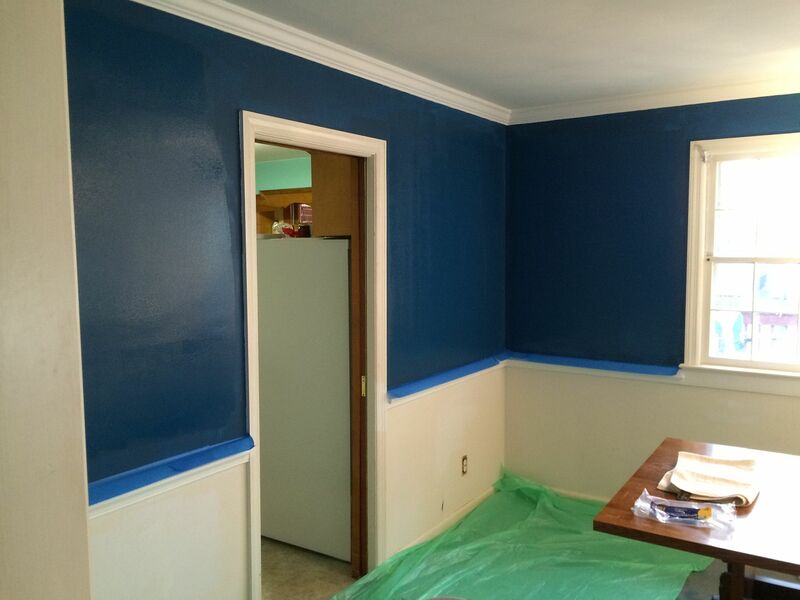 Ultimately, I washed the walls, I scrubbed the walls, and I used a plastic putty knife to scrape all that mess off. 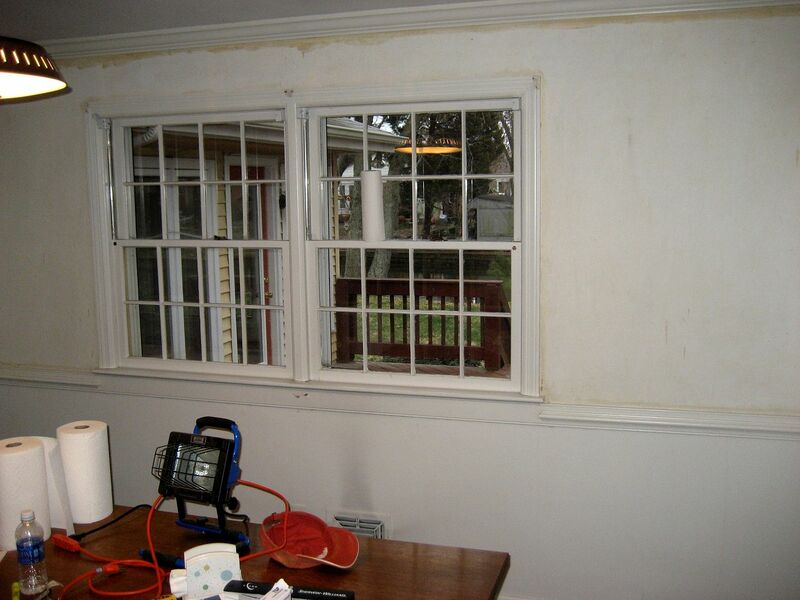 Probably 30% of the time invested in this project went to cleaning that gooey mess off the walls. 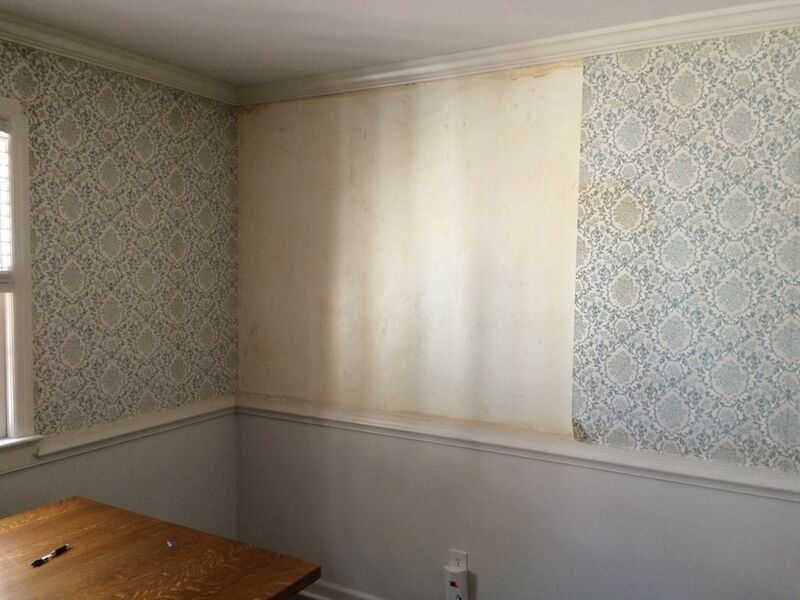 Once the wallpaper glue was gone, the project went much more quickly. 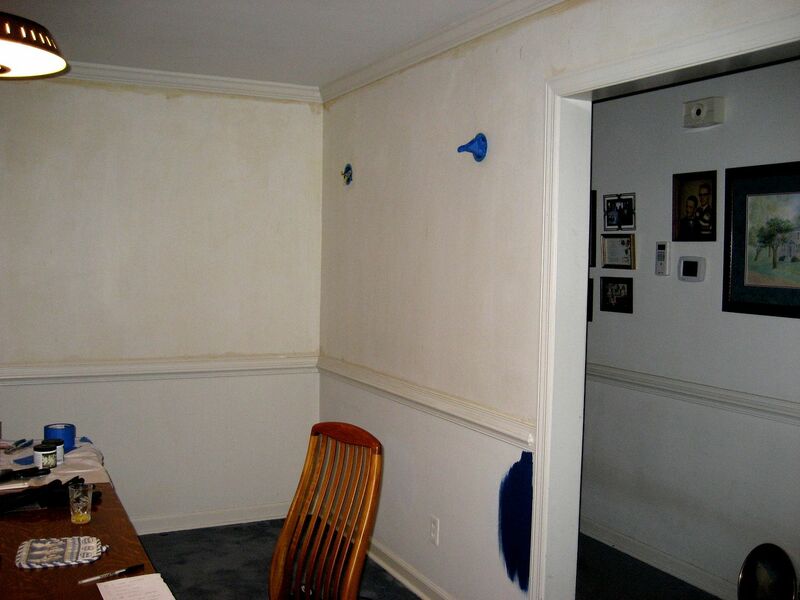 And when the walls were primed, the room looked a whole lot better and brighter. I love this shot because it shows our two ladders in the two rooms. We painted from the ceiling down. I kept hoping we'd spill a gallon of paint on the tired blue carpet but no such luck. The cleaner the room looked, the worse the carpet looked. Wayne painting the area under the chair rail. One year - to the day - that this photo was taken, he put a bullet in his brain. I still have no idea why he did this. None. 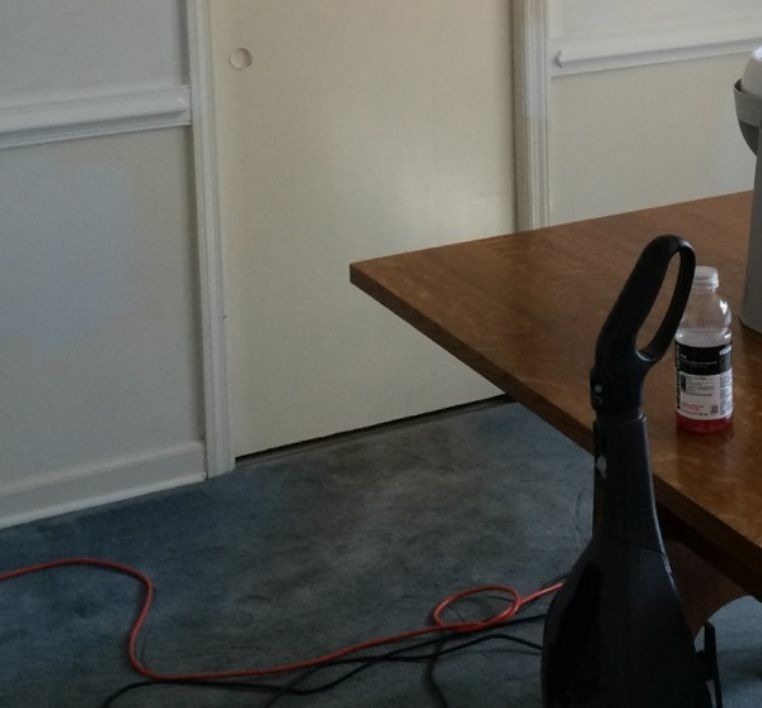 After sending this photo to a friend, I noticed how filthy the carpet was by the kitchen door (closed). It was icky enough that I decided I could no longer stand it. So I sliced it the 36-year-old carpet into bits and tore it up. And this is what I found under the carpet. 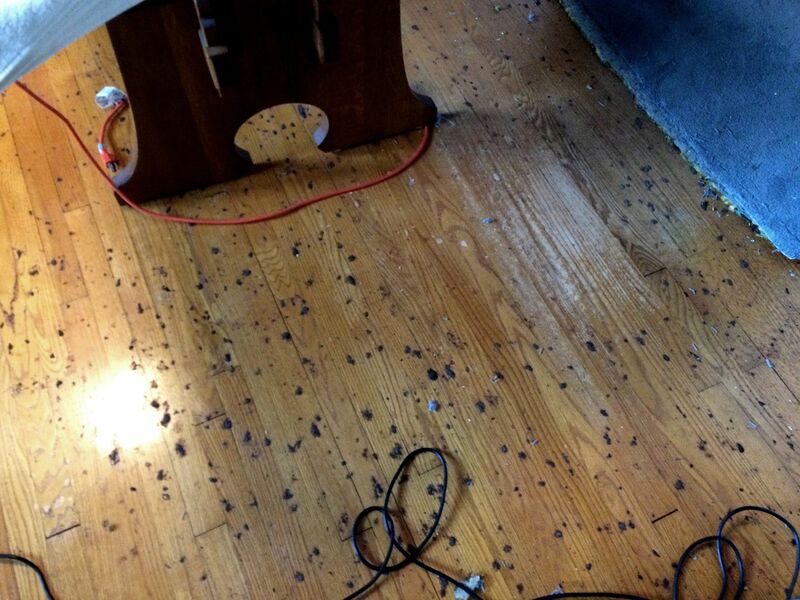 The pad under the carpet had melded with the varnish in the floor, and left behind this awful mess. 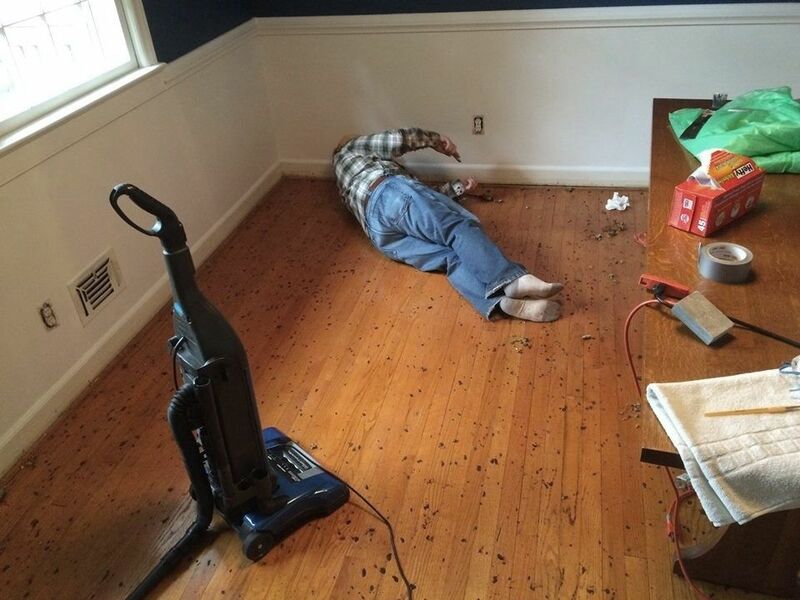 Wayne Ringer went to work, pulling out 3,482 staples in the floor, and then spent another couple hours scraping the black goo off our red oak hardwood floors. It was pretty nasty stuff. At the entrance to the kitchen, it looked really bad. 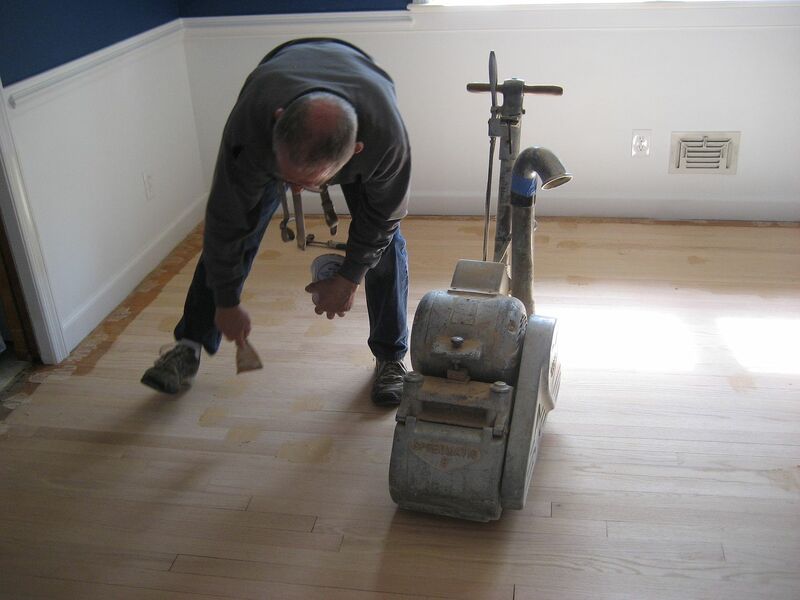 Two fellows from Kittrell Hardwood Floors (Portsmouth) showed up and once the big sander came in the house, things changed dramatically - in a hurry! 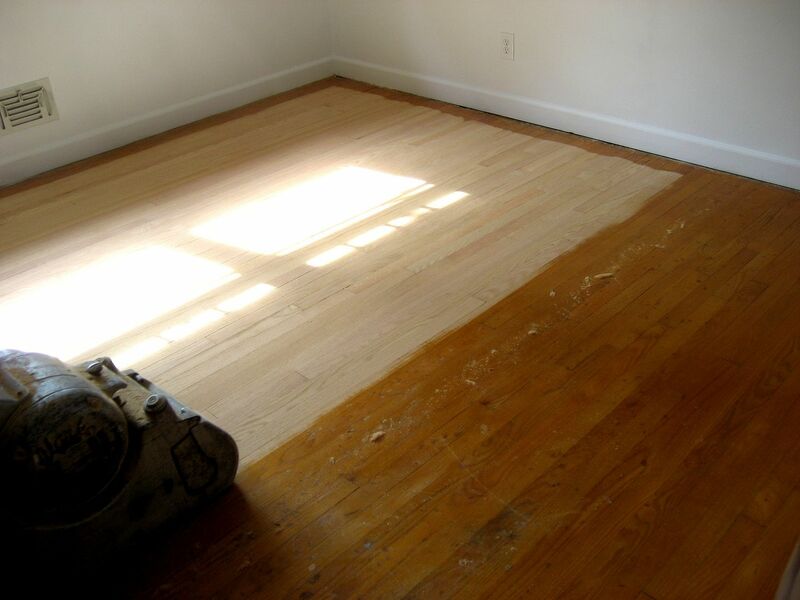 Donnie from Kittrell Hardwood Floors told us that the average oak floor can be re-finished a dozen times. After the first sanding, he patched a few holes. The entrance by the kitchen door cleaned up beautifully with only a few black dots left behind (where several hundred staples once resided). 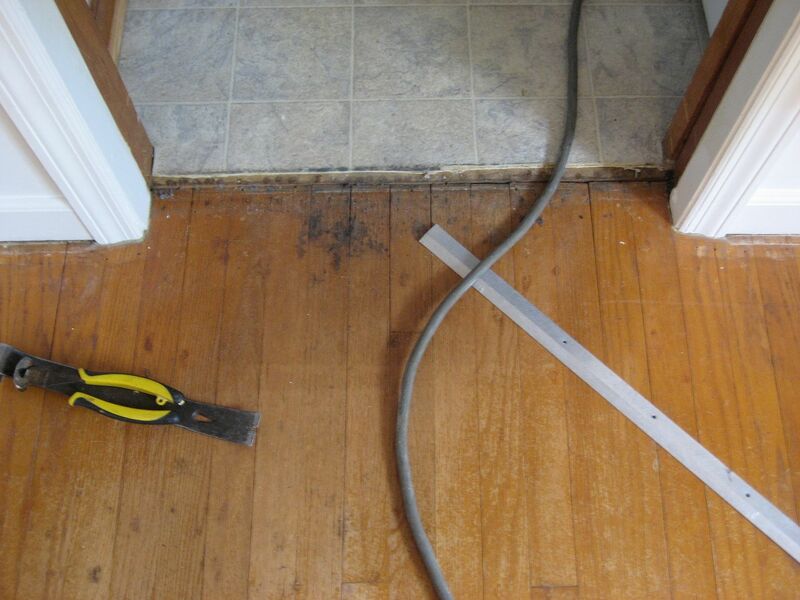 A fun comparison between the spot at the kitchen door (before and after). 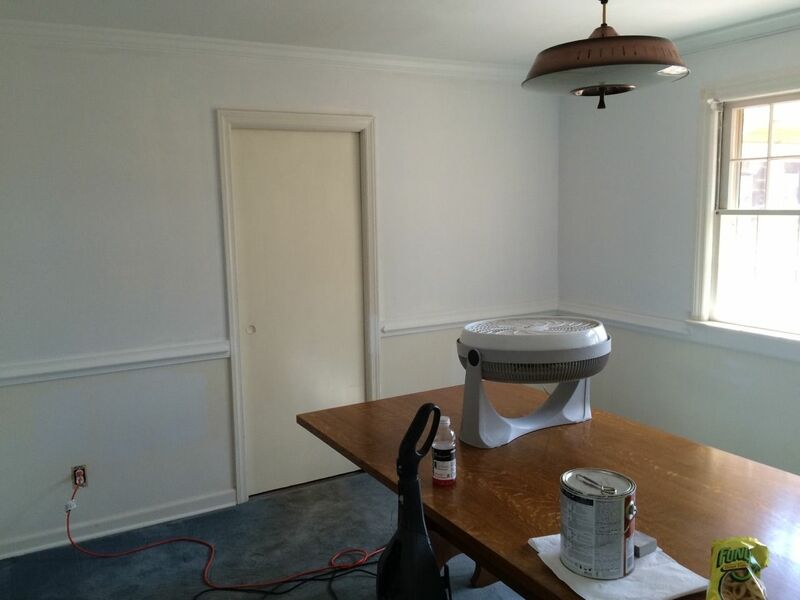 We had Kittrell come back three days later and put down a second coat of polyurethane. 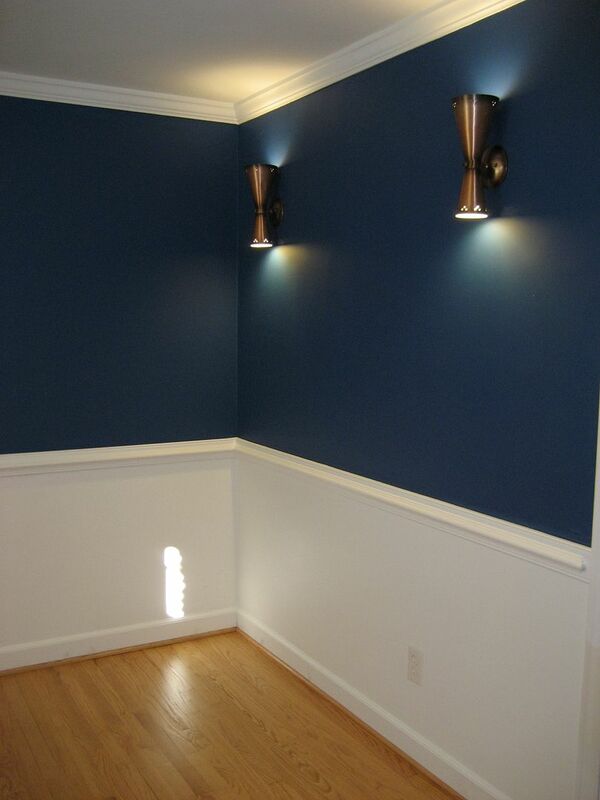 And the sconces look mighty nice with the blue paint! Still have a few spots to touch up here and there, but it's mostly done! Now we just need to put the furniture back. All in all, a rousing success! 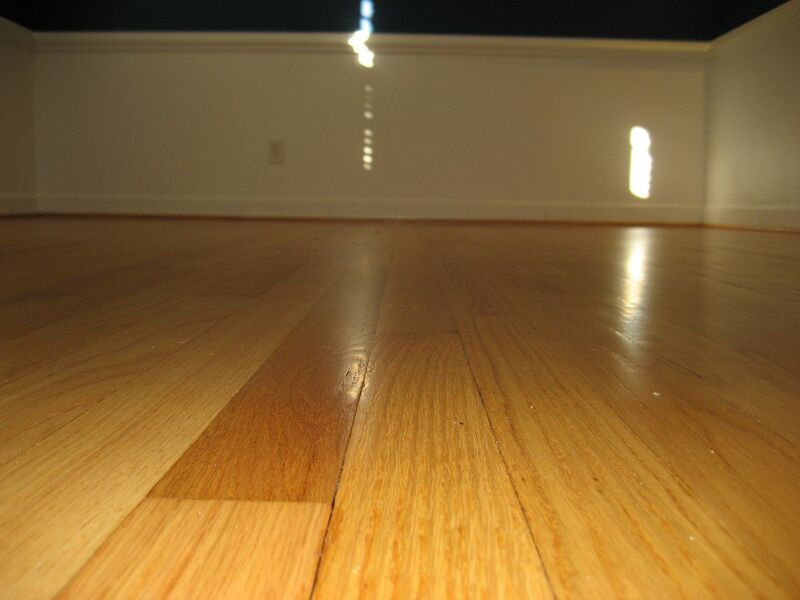 And Kittrell Floor Service (in Portsmouth) did a fine job! 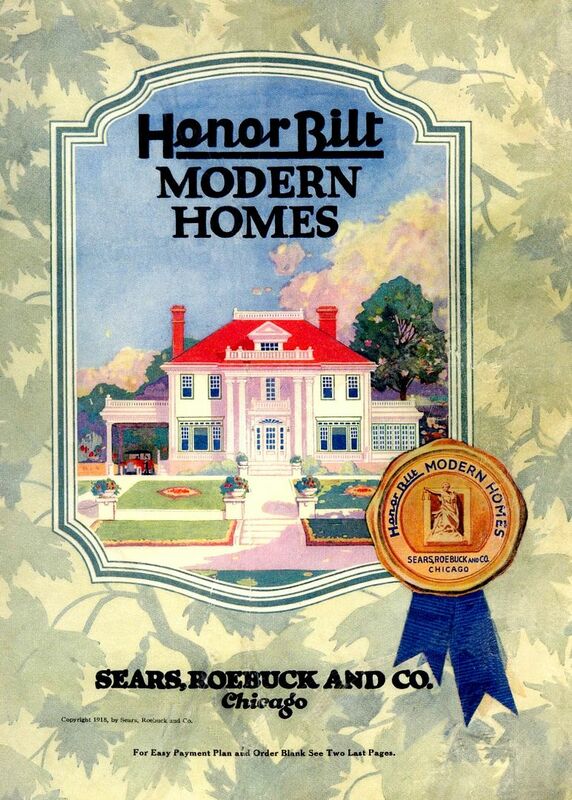 Sears Homes are on Facebook! Click here to join! 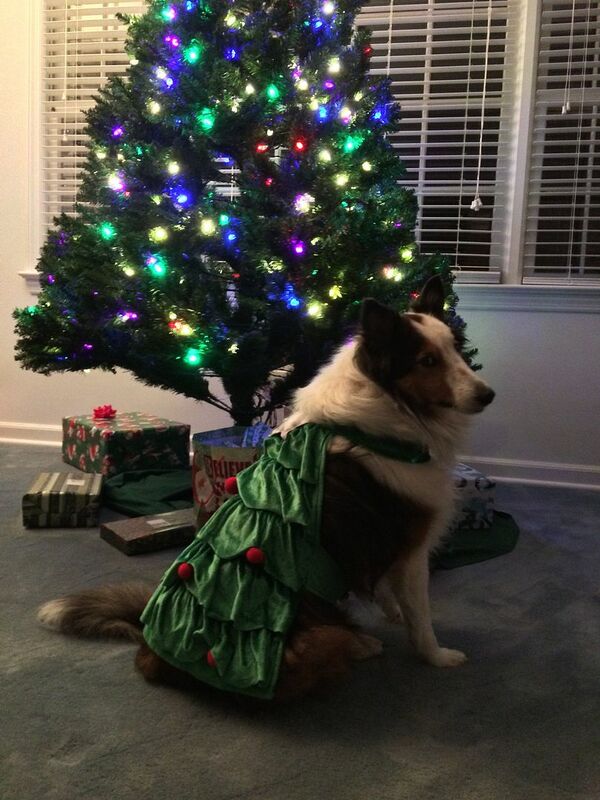 Thanks so much to Rachel Shoemaker for providing me with the PERFECT Christmas Day photo! 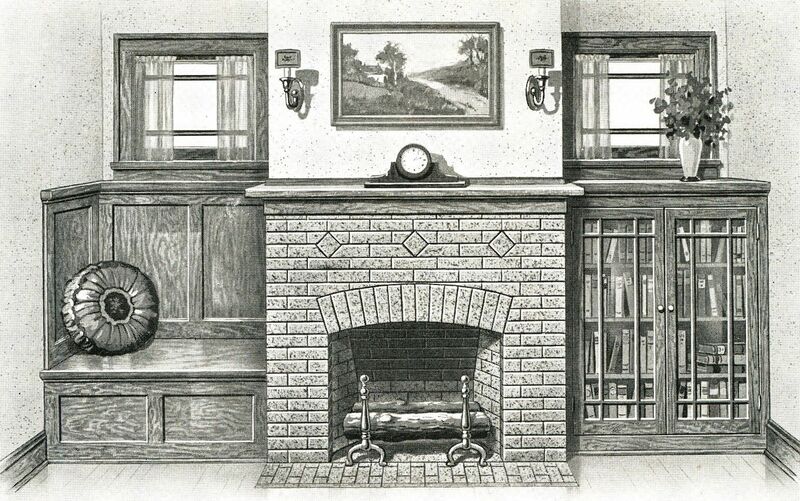 And if you want to read about Sears Homes all year long, join our group of kit-home enthusiasts on Facebook! 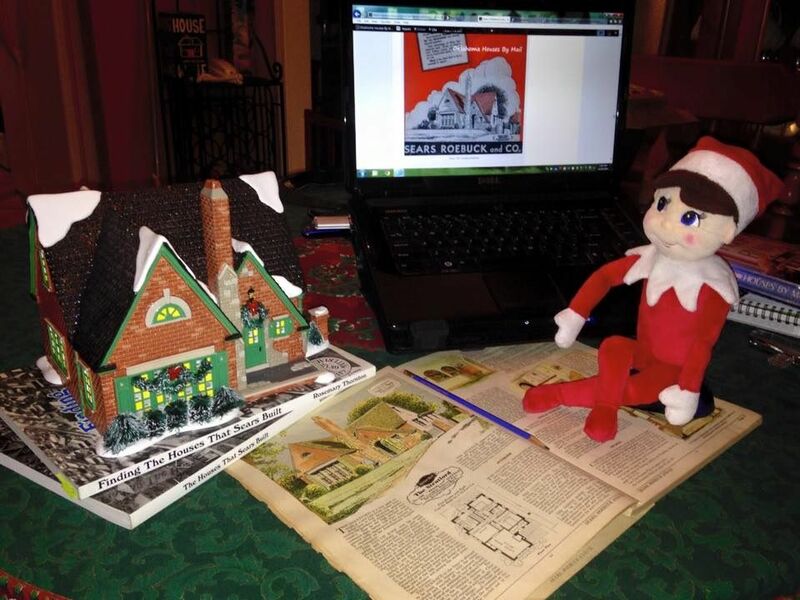 Rachel Shoemaker's favorite elf studies not one, but two catalogs whilst gazing upon a diminutive version of the Sears Mitchell - decorated for Christmas! Photo is copyright 2014 Rachel Shoemaker and may not be used or reproduced without written permission. Teddy will look back on this Christmas with many fond memories. Visit Rachel’s blog by clicking here. Interested in learning about Gordon Van Tine? Click here! 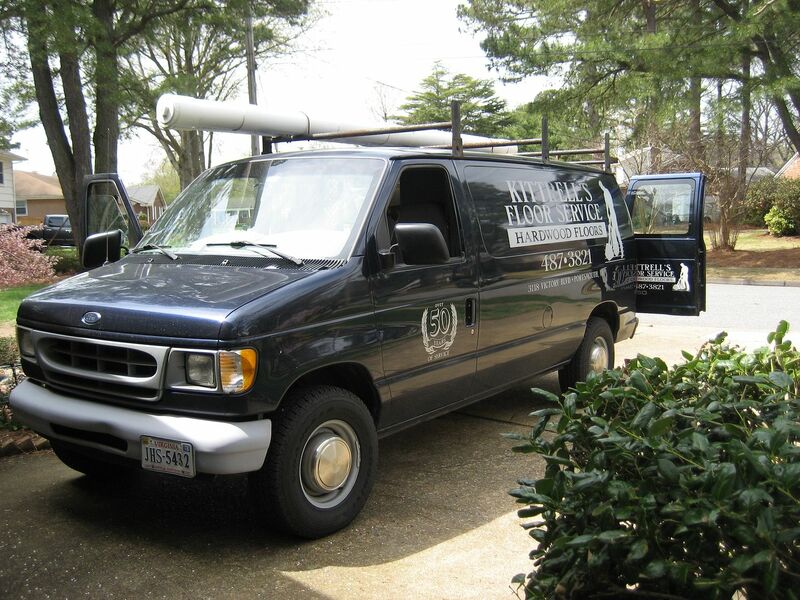 In the early 1980s, my husband and I looked at an Aladdin Shadowlawn for sale in Chesapeake, Virginia. 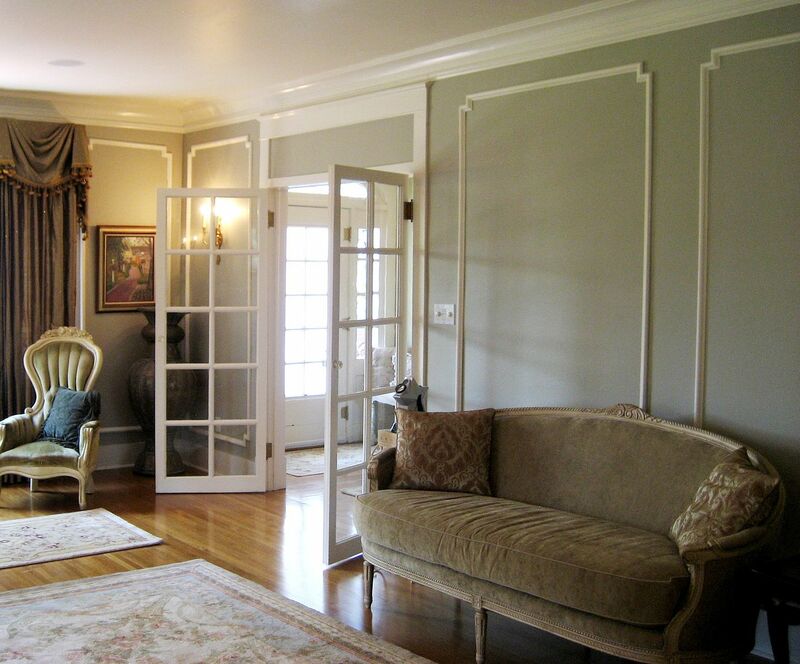 We both fell head-over-heels in love with the solid-oak bookcase colonnades between the living room and dining room. 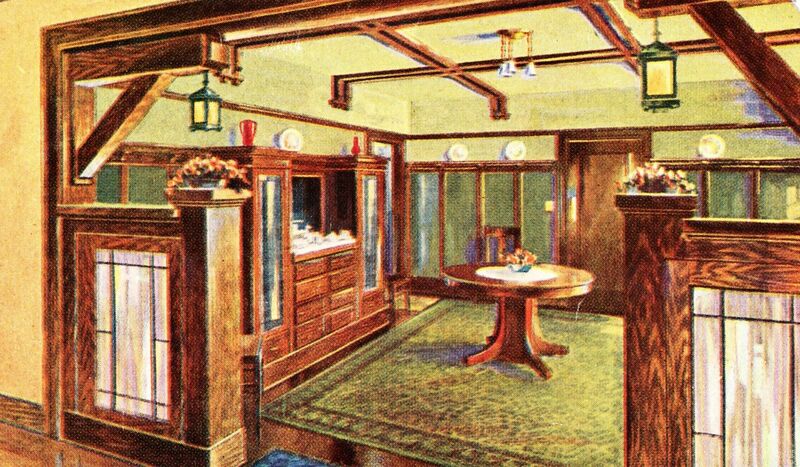 “Permanent furniture” (built-in cabinetry) was a brilliant concept. 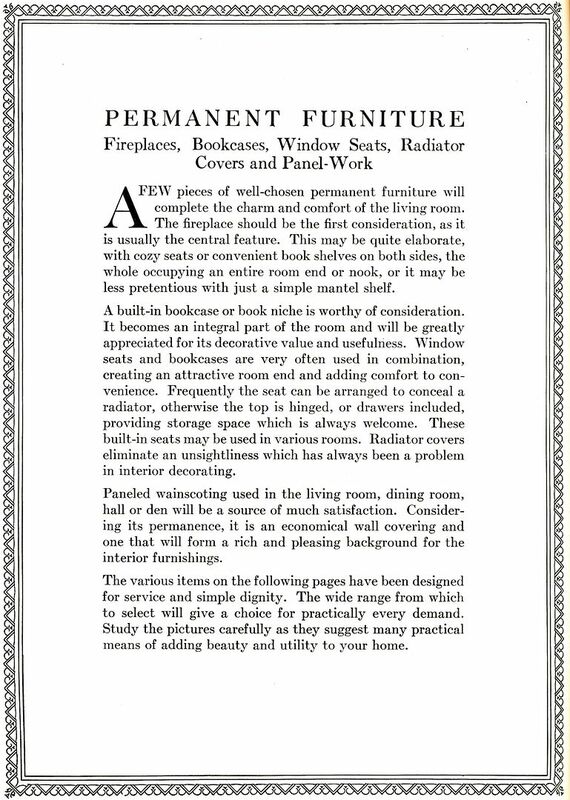 The more “permanent furniture” present in a house, the less “temporary furniture” the new homeowners would need to purchase. 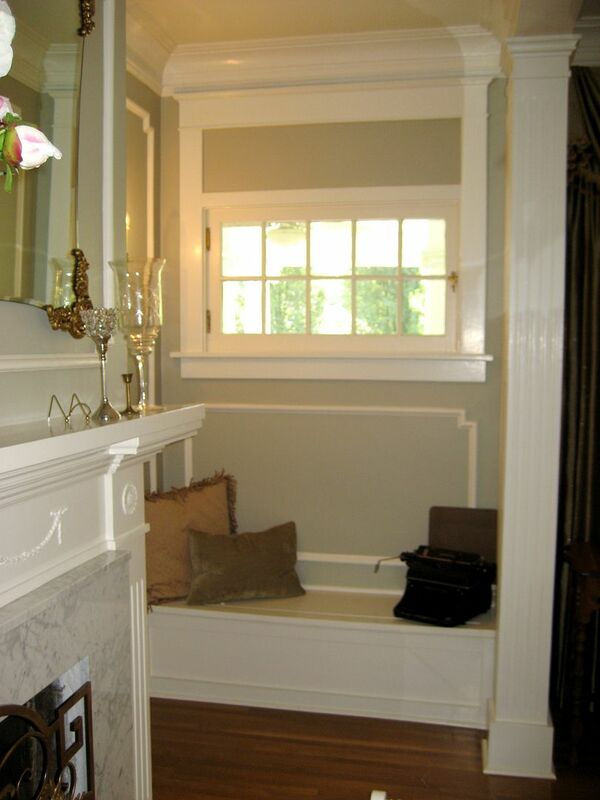 And all these built-ins really did make best-possible use of small spaces. 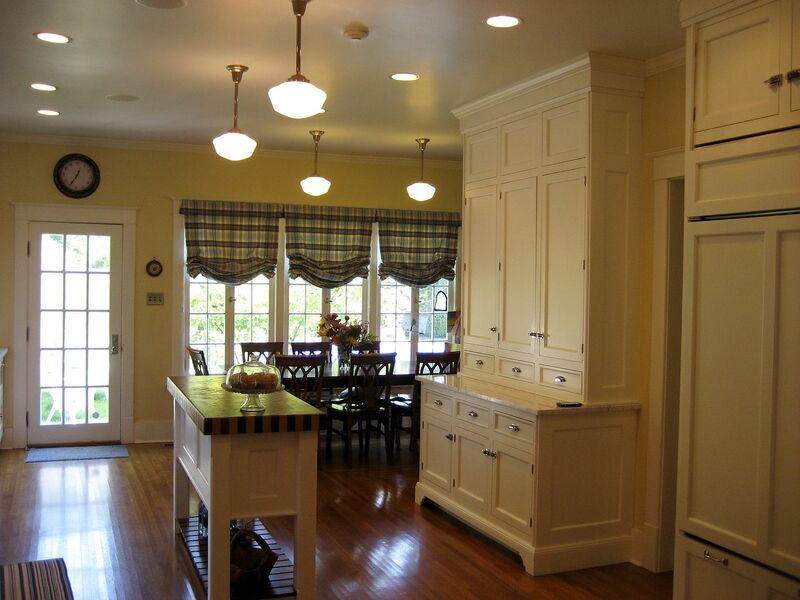 To read more about permanent furniture, click here or here. As always, thanks to Norfolk historian and librarian Bill Inge for sharing his wonderful old architecture books with moi! 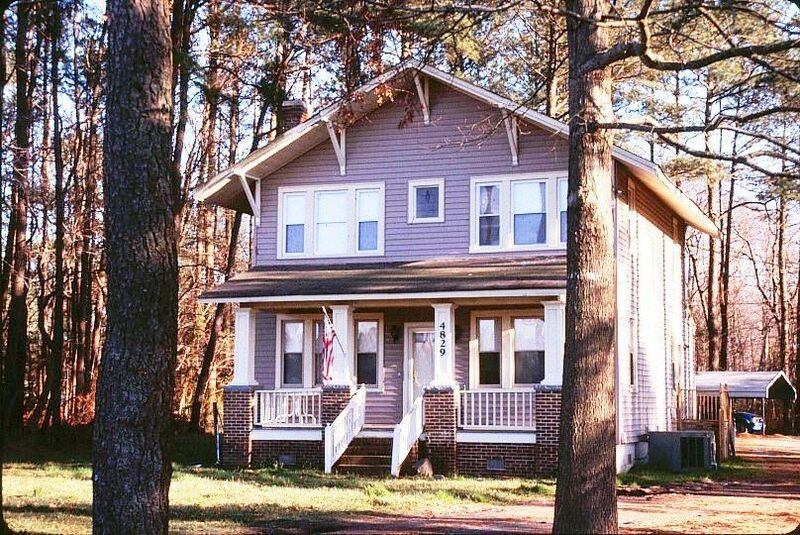 More than 30 years ago, we looked in the windows of this Aladdin Shadowlawn in Chesapeake, Virginia (near Chesapeake Square Mall) and caught a glimpse of the solid oak built-in bookcase colonnades and fell hopelessly in love. 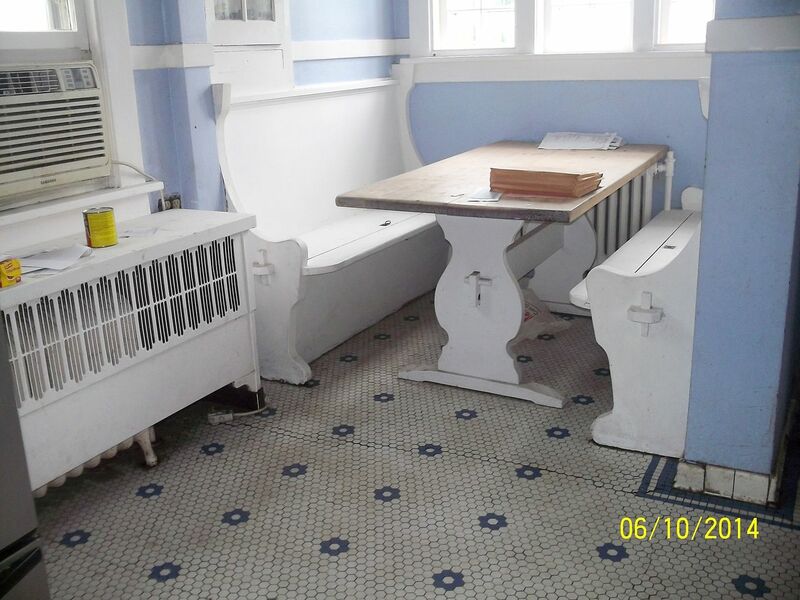 There's something about "permanent furniture" in old houses that still makes me swoon. 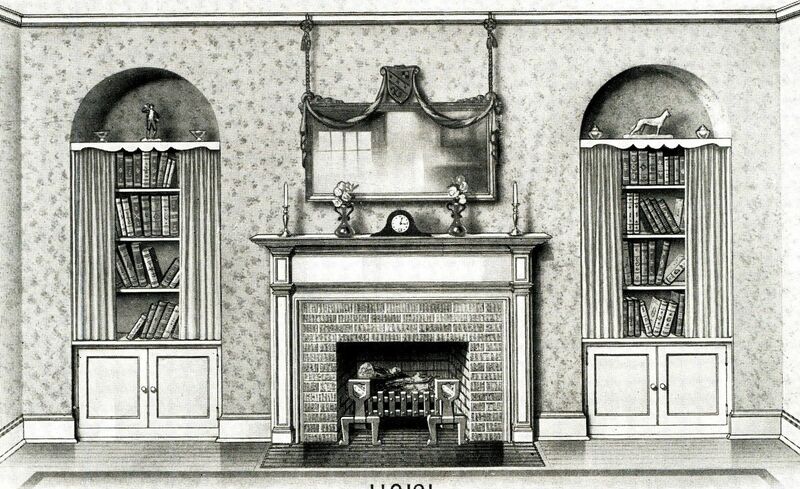 The Aladdin Shadowlawn came with beautiful built-in bookcase colonnades (1919 catalog). 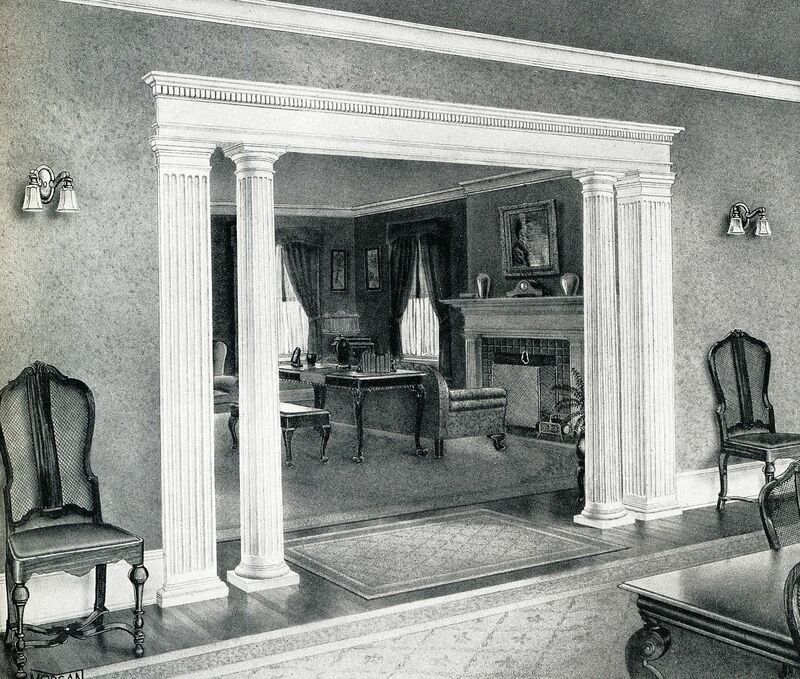 These colonnades appeared in the Sears Roebuck "Building Materials" catalog (1921). Pretty basic and very plain and no shelving or bookcases. And who's Carlton? My guess is that he's someone that wasn't well liked at Sears. Maybe it started out as a practical joke. "Let's name those really boring colonnades after that boring guy, Carlton who never does anything but stand around and look goofy," and before they knew it, the $34 colonnades were listed in the Sears catalog as "Carlton Colonnades." 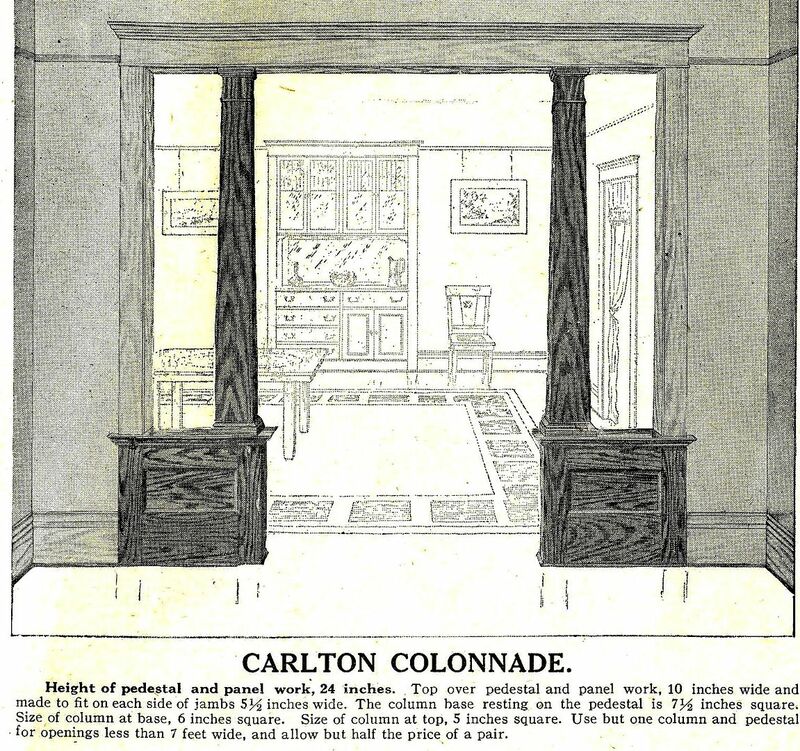 For $82.50, you could buy a colonnade that actually had a practical purpose (unlike Carlton). 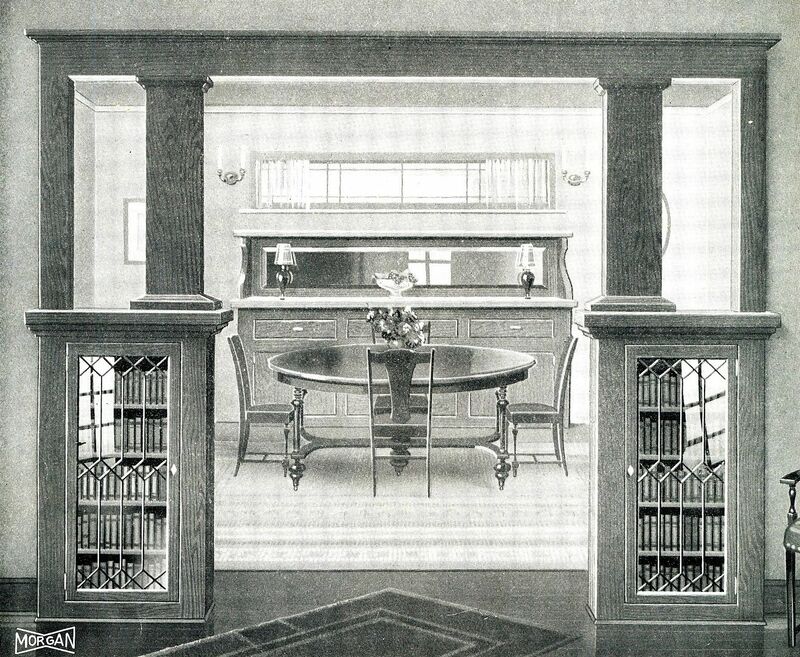 The Sears Osborn featured these bookcase colonnades with either wooden muntins or leaded glass doors (1919). 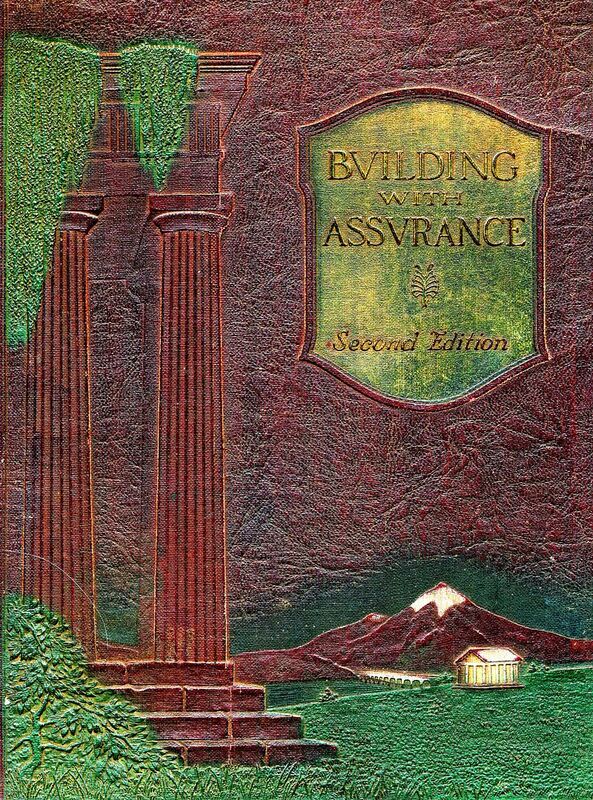 No sooner had I returned Bill Inge's 1927 Builders' Woodworking catalog than he loaned me this little treasure, "Building With Assurance; Morgan Millwork." It was full of - colonnades! It was published in 1923. 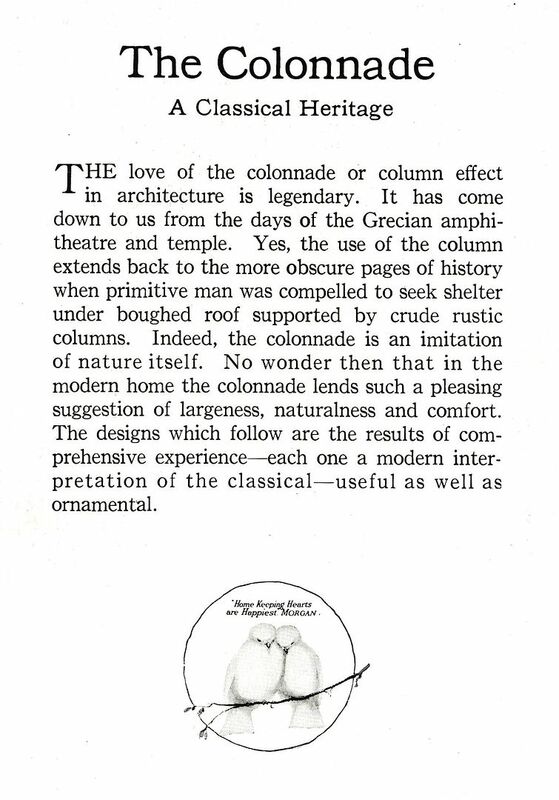 And the first page of the Colonnade Chapter offered some interesting insights as to why we love colonnades: "It's an imitation of nature itself." BTW, check out the lovebird logo. Nice way to dress up a doorway! These colonnades are simple, but quite attractive. That rug looks like a trip hazard, though. 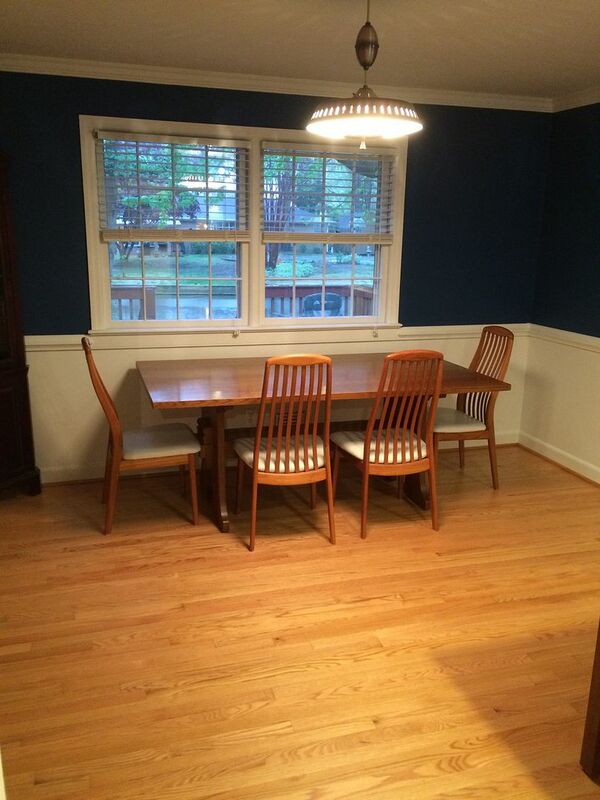 The dining room furniture looks like it came out of a dollhouse. The proportions are skewed. Apparently Morgan had their own line of Carlton Colonnades. Much more ornate, and bigger bookcases, too. 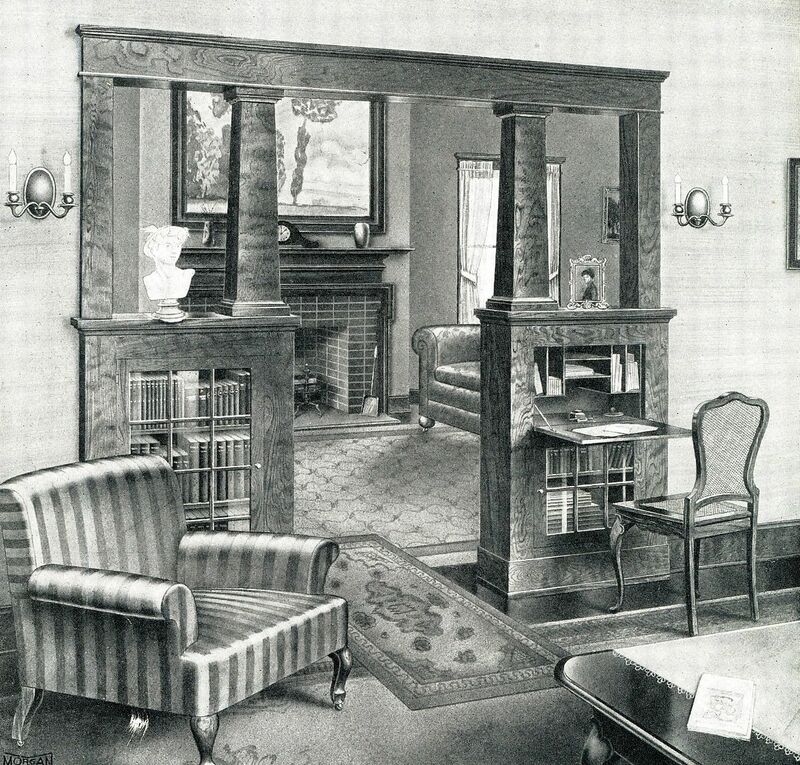 The original caption reads, "This Morgan standardized design offers a fine opportunity for tasty decoration with jardinieres, statuary, bric-a-brac, etc." I had to look up "jardinieres," because I've read a lot of books in my life but I have never seen that word. Turns out, "jardinieres" is a female gardener, allegedly. 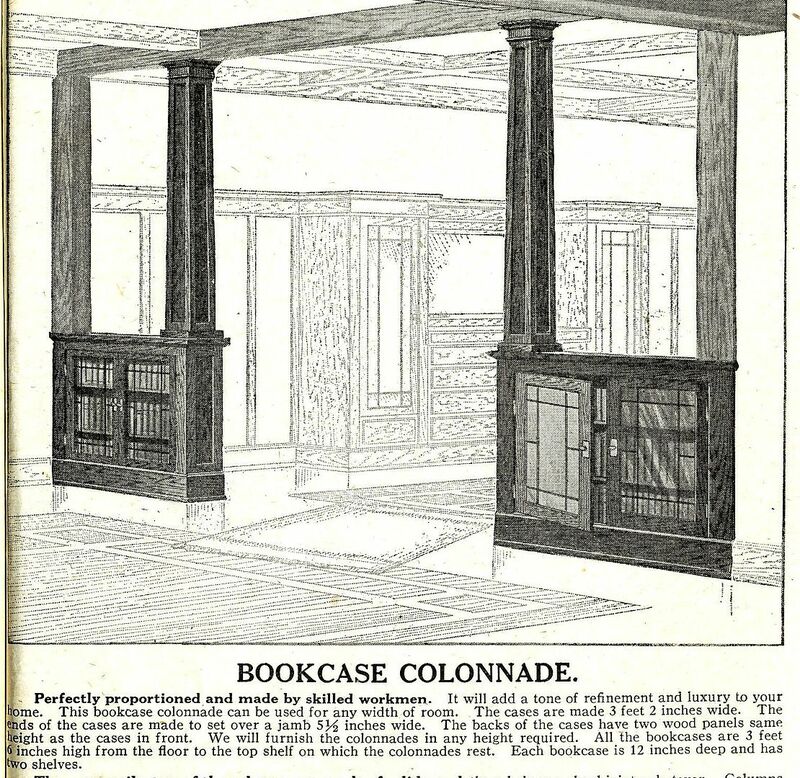 I'm not sure that even the most progressive 1920s housewife would be too keen on the idea of using built-in bookcases to store female gardeners. 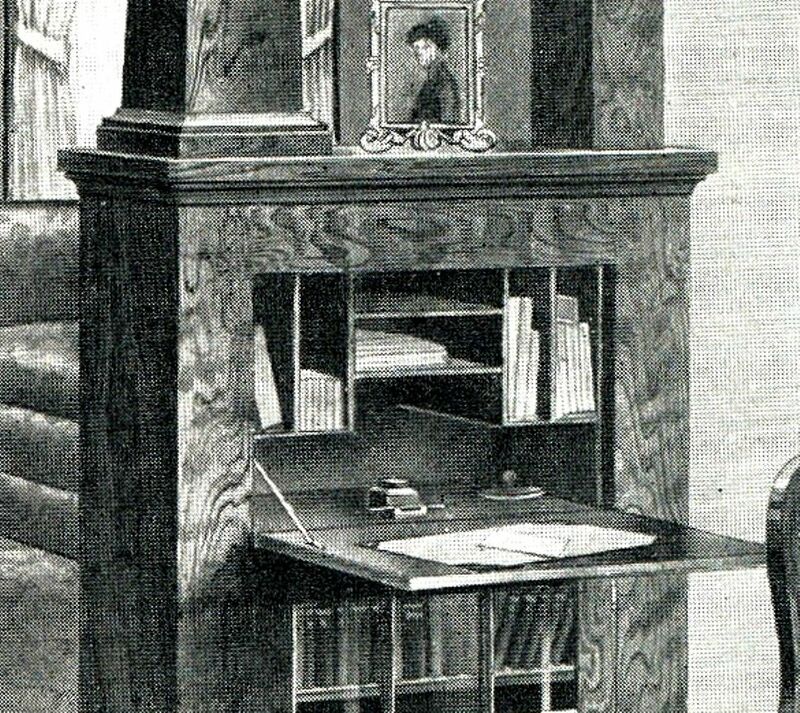 This one's my favorite: Rugged, sturdy, spacious and a built-in desk, too. That desk is pretty cool, even if he does have a lot of bills hidden inside of it. Another beautiful colonnade, but in use as a china hutch! To read about the Sears Magnolia we found in West Virginia, click here. 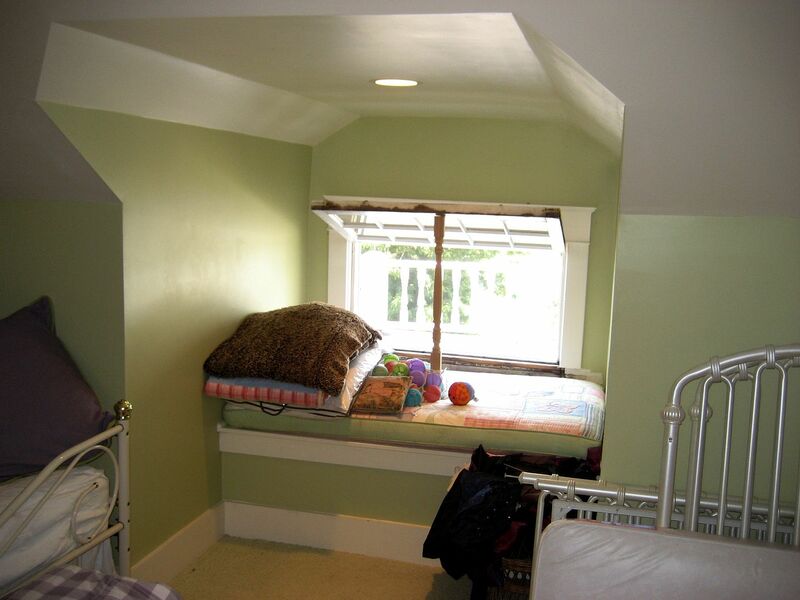 To read more about built-ins, click here. 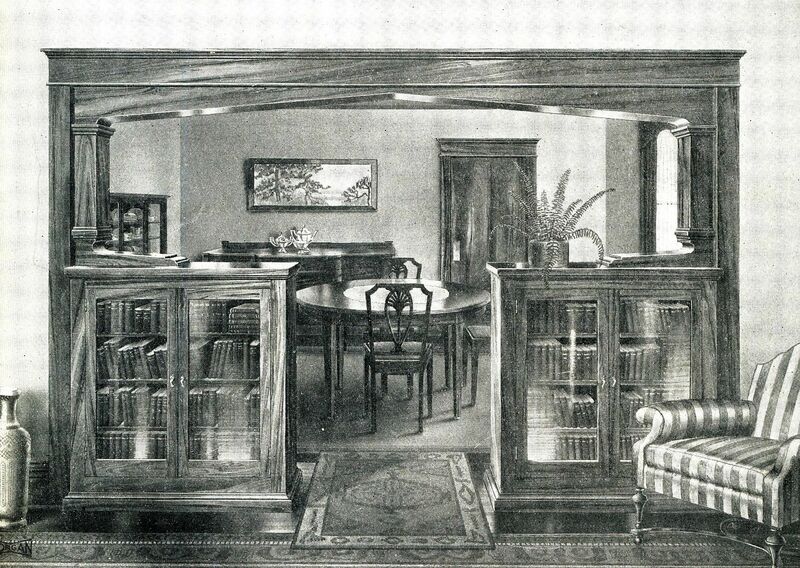 While browsing through Bill’s “Builders’ Woodwork” catalog (1927), I was intrigued by this phrase, and found that it was a reference to built-in bookcases, nooks, and fireplace seats. And my oh my, they are beautiful! “Permanent Furniture” is also a jarring reminder that, despite our so-called progressive views on recycling, our not-so-distant ancestors did far better in preserving and respecting our country’s resources. I suspect they’d be scandalized if they saw a modern HGTV program, which seems to advocate disposing of anything in a house that’s more than 20 years old. I shudder to think how much early 20th Century “Permanent Furniture” is sitting in a landfill somewhere, having been tossed into the waste stream for no other reason than the fact that it looked “dated,” or “old-fashioned.” And the modern home improvement shows fuel the fire, encouraging folks to rip out and replace anything that isn’t “up-to-date.” It takes “keeping up with the Joneses’” to a whole new level of insanity (and debt). But don’t get me stated on HGTV. If I were queen of the world (and it shouldn’t be long now), I’d have that show and its ilk banned from the airwaves. Bill loaned me this book on one condition. "Don't drool on the pages," he said with a degree of gravitas, "because trust me, you're going to love these 1920s images." "The various items...have been designed for service and simple dignity." I not only loved the photos, I loved the accompanying descriptions, too. Beautifully said. Looks like a "Hospitality Seat" made it into the living room. I'm not sure how practical this one is, but it sure is lovely to look at. 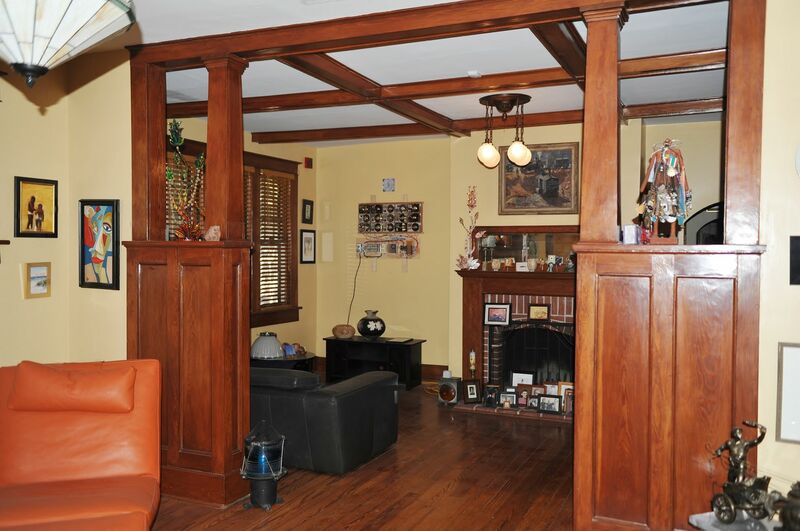 The woodwork is stunning. Simple, but dignified, as promised. 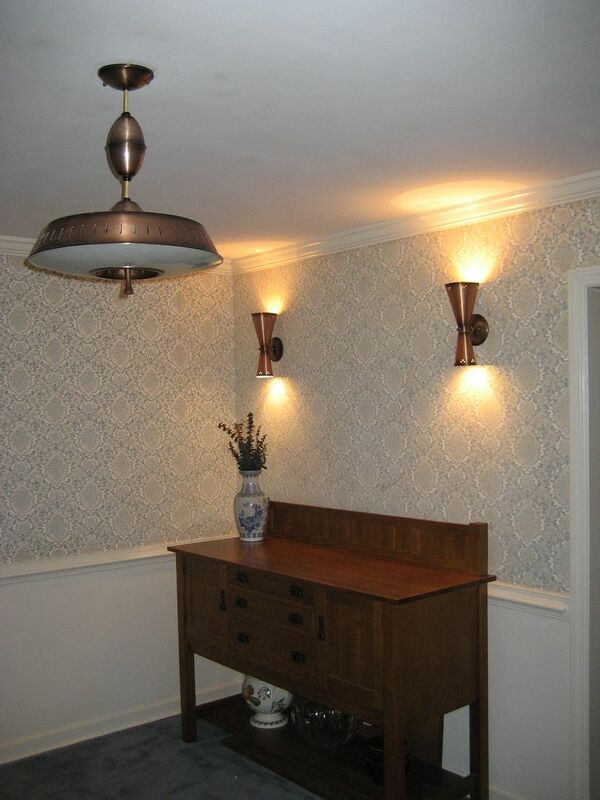 This set-up was very common in so many early 20th Century houses and it creates such an inviting look. What could possibly be better than streaming sunlight, a warm fire and a good book? Apparently, Spanish homeowners prefer their guests to stand. Maybe it inspires them to leave faster. Room for lots and lots of books! I do love the look of this. 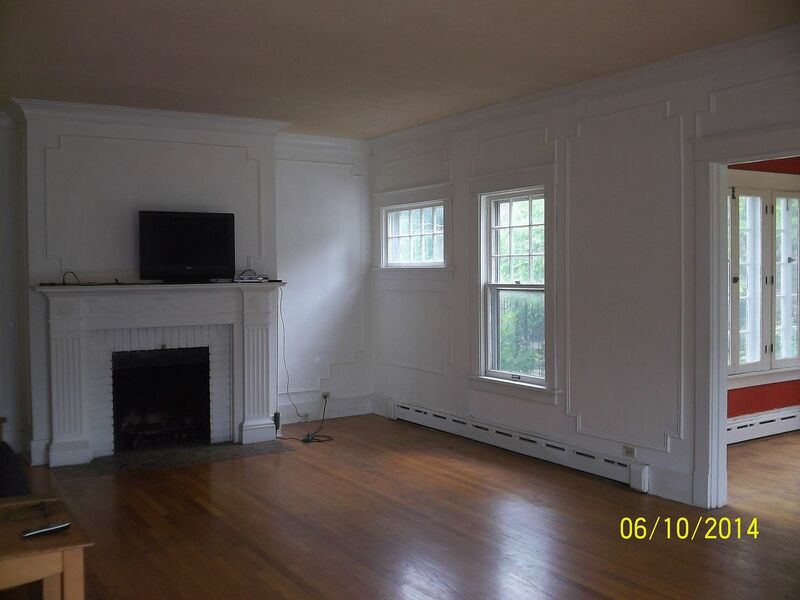 The oak wainscoting would be dark, but dignified. 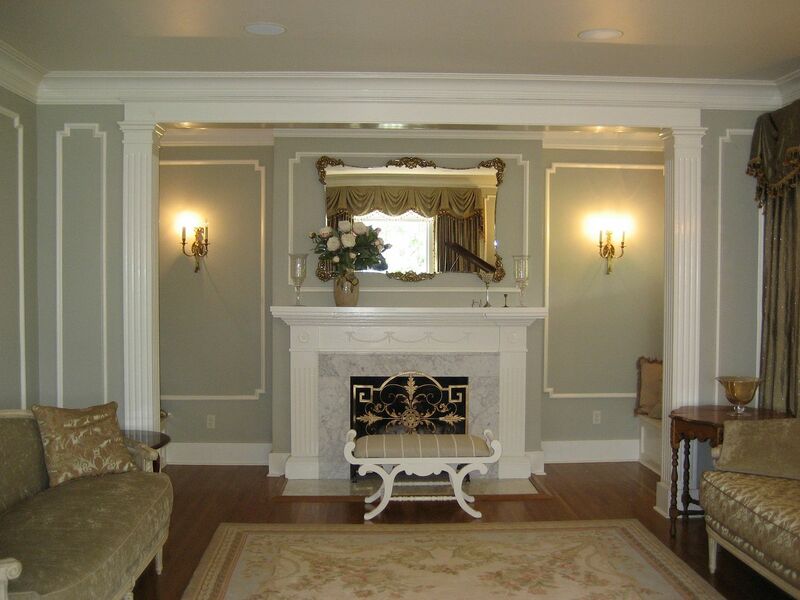 Most of these fireplaces have the lights over the mantel, whereas this has sconces on the side walls. 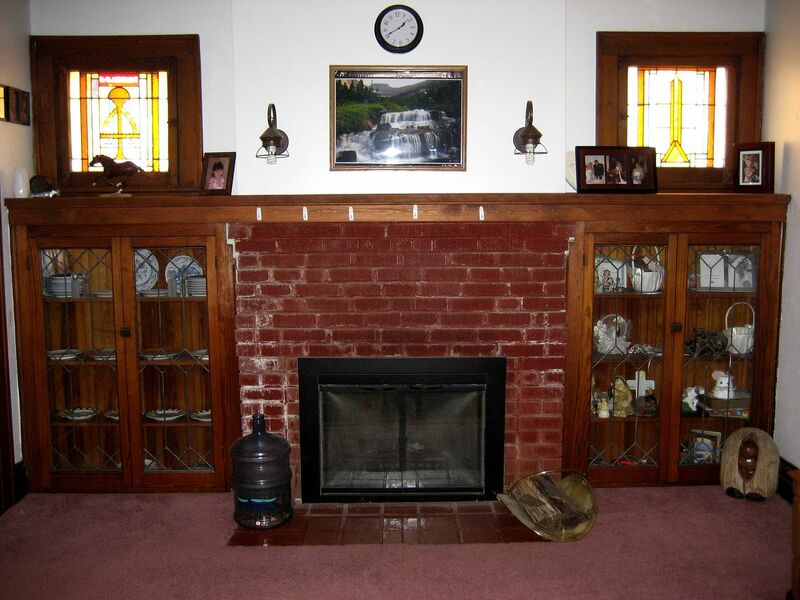 The original caption says that this fireplace "is very artistic with its Tudor Gothic arch." Despite the fact that this arrangement may be a little too toasty, I think it's my favorite. 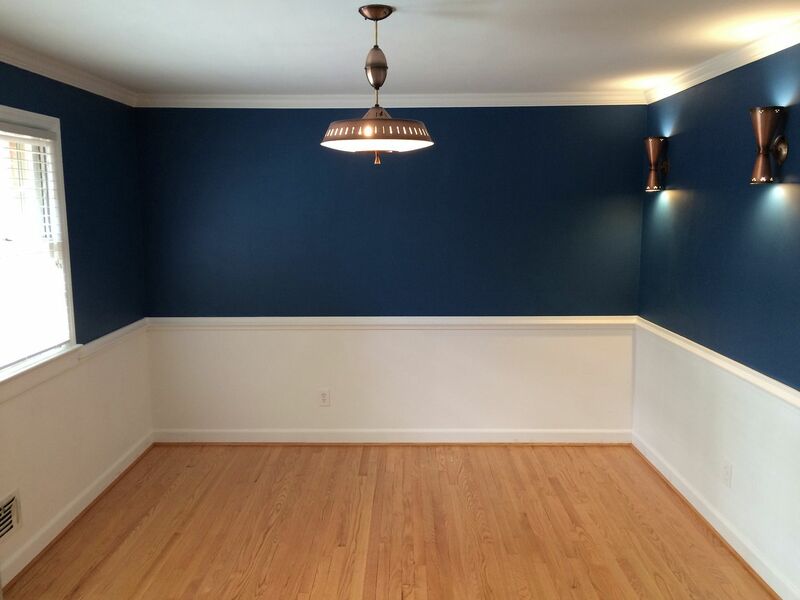 I love how the wainscoting blends right in with the seat backs. Looks like there's storage within those benches. 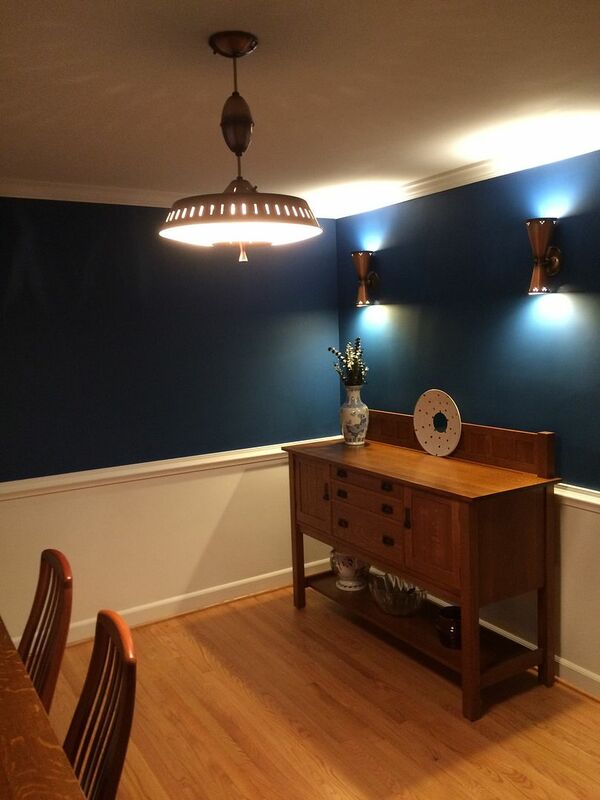 A classic look for early 20th Century Colonial Revivals. 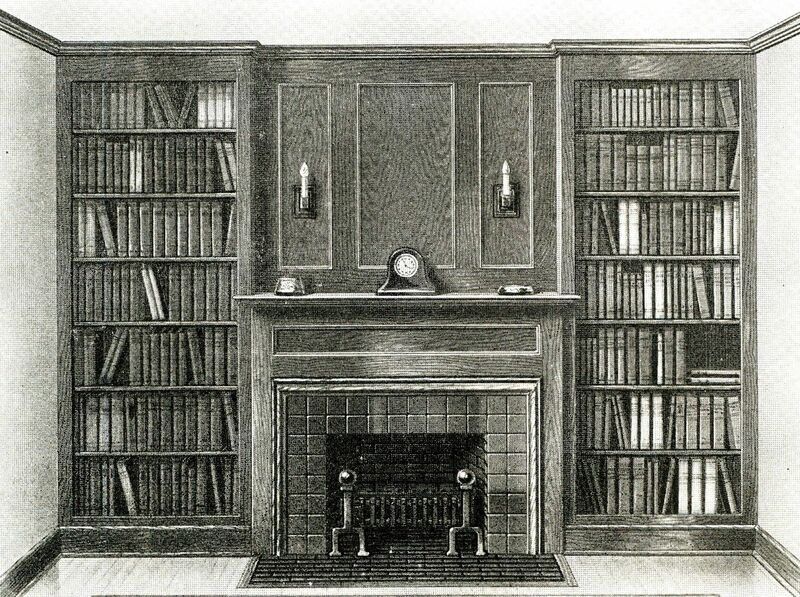 Another Colonial-esque mantel with flanking bookcases. 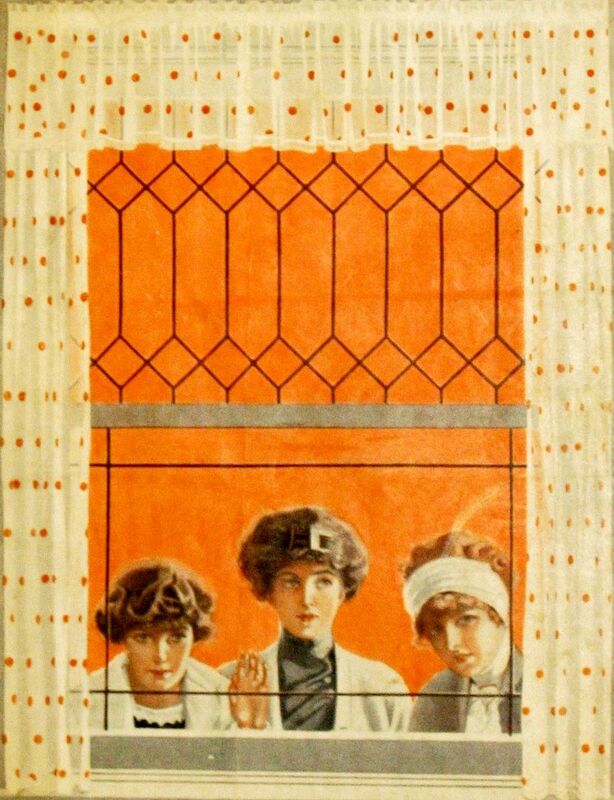 The original caption says that the “sliding curtain is very practical.” I guess it’s a good idea for when your illiterate friends visit and you don’t want them to know you’re a bibliophile. The mirror looks like it’s draped with black crepe, but I don’t think that’s what it really is. 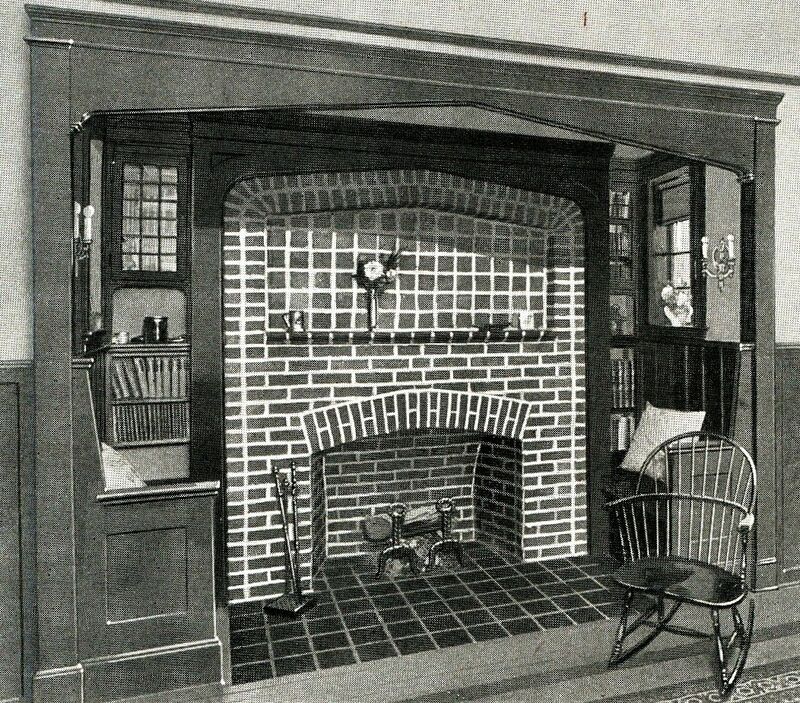 This image is from the 1921 Sears Modern Homes catalog. 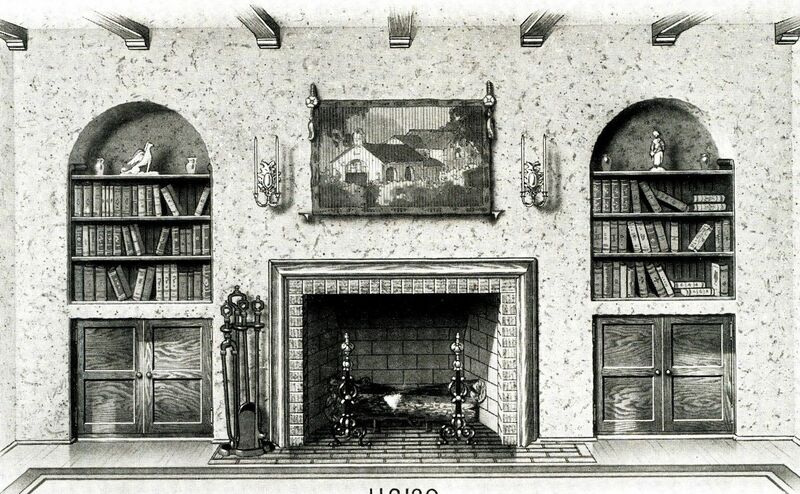 It's the fireplace nook for the Sears Ashmore. Pretty fancy for a "simple little kit house." Last but not least, here's some "permanent furniture" in a Sears Osborne in Illinois. To read about built-in phone niches, click here. To contact Rose, please leave a comment below! Today, I’d like to show off the interior of this wonderful old house. First, a little history. 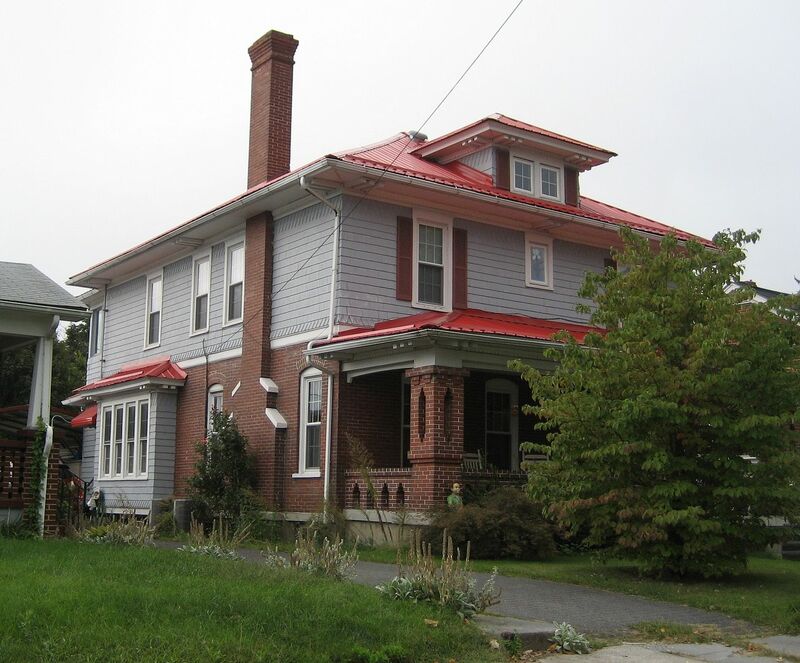 The home’s owner believes - based on his research - that the house was built in late 1924 or early 1925. A reminiscence from a former neighbor puts the build date in the same time period. This jibes with the county tax record as well (which shows 1925), but tax records are notoriously unreliable on construction dates. 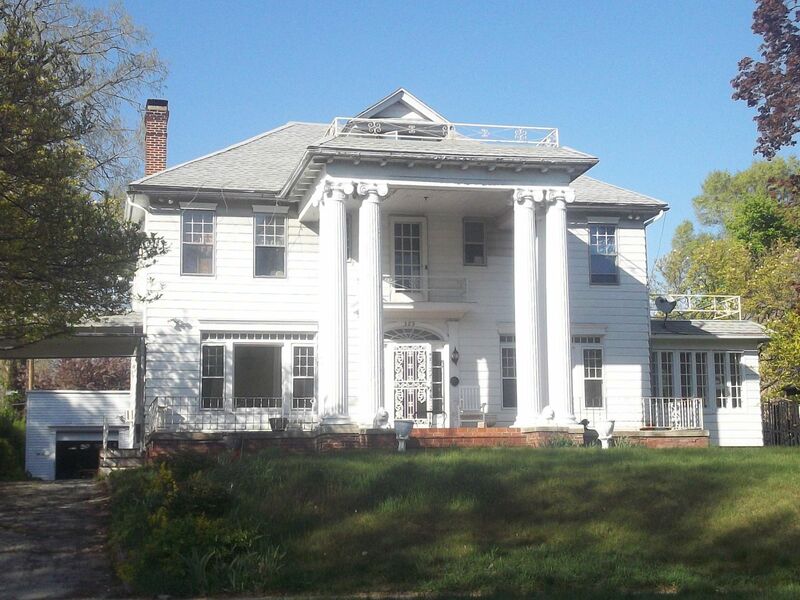 To be honest, when I first heard that this house was built in 1924, I was a little incredulous. 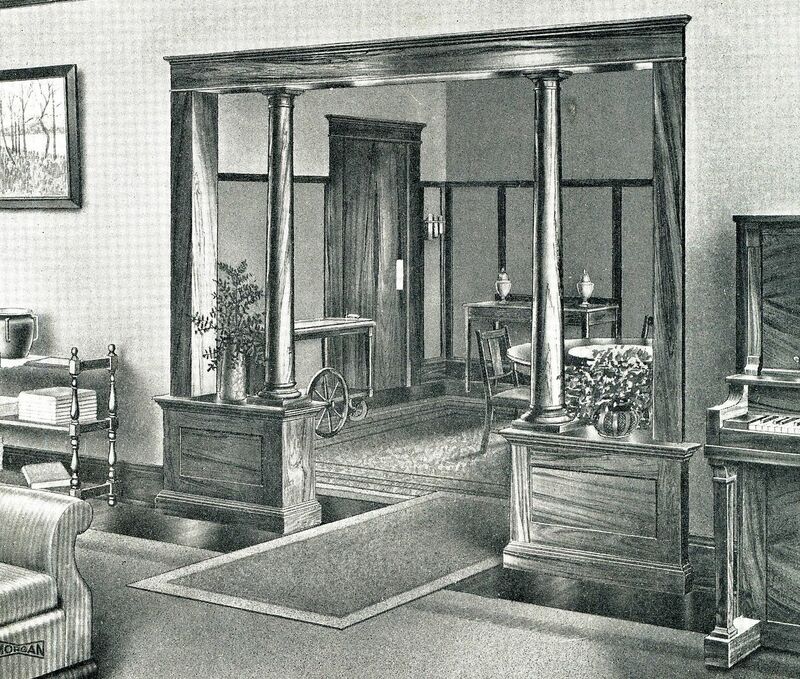 The Sears Magnolia was first offered in the 1918 Sears Modern Home catalog, and its last appearance was in the 1922 catalog. Was it really possible that this Magnolia was purchased in 1924 or later? In the basement of this glorious Eighth Magnolia, the owner showed me an old pedestal sink in the family bathroom (second floor). On its underside was a casting date of November 6, 1923. 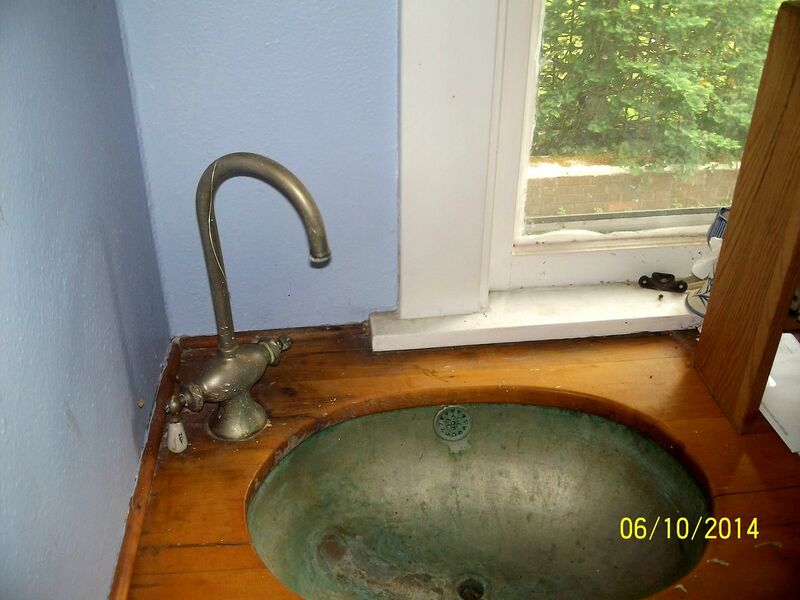 If this is the original sink (and based on what I saw, it probably is), then this kit house was shipped to West Virginia sometime after January 1924. These “Modern Homes” catalogs that Sears distributed far and wide did not automatically self-destruct when the year ended. 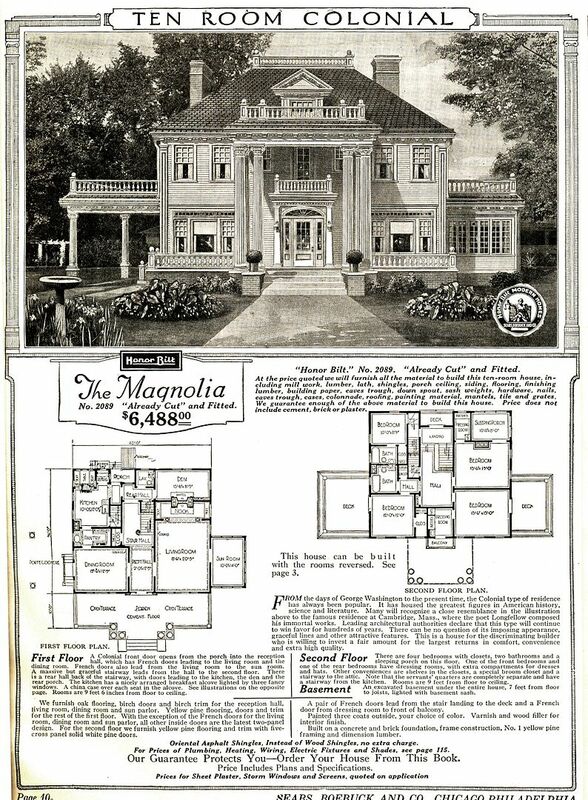 It’s altogether possible that the Magnolia’s original owner had been studying a 1918-1922 catalog for some time, and took a fancy to the Magnolia. He may not have realized that this model wasn’t offered after 1922. Other than some post-war hyperinflation, the prices for building materials in the first three decades of 20th Century were relatively stable. According to the neighbor’s reminiscence, the Magnolia cost $7,000 to purchase and another $7,000 to build. And if Sears Roebuck had a few old Magnolias hanging around the warehouse, I’m sure they would have been thrilled to unload them in 1924 or even beyond. And if they had most of one Magnolia ready to go, but it was missing a few parts, they could have easily milled those pieces to complete the kit. 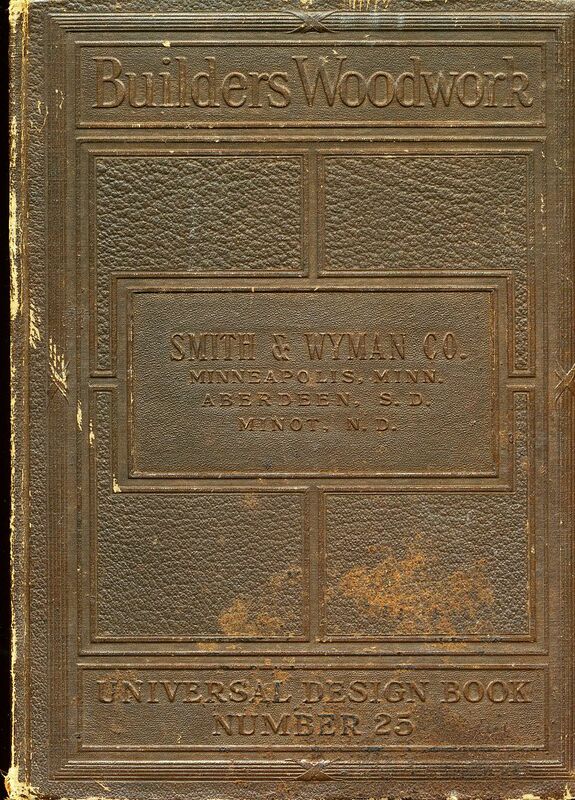 In fact, if they did not do any milling or cutting until after an order was placed, it would also been fairly simple for Sears to fulfill an order from a two-year-old catalog. In conclusion, is it possible this Magnolia wasn’t ordered until 1924 or 1925? Enjoy the photos below! And if you know of a Sears Magnolia, send me a note! 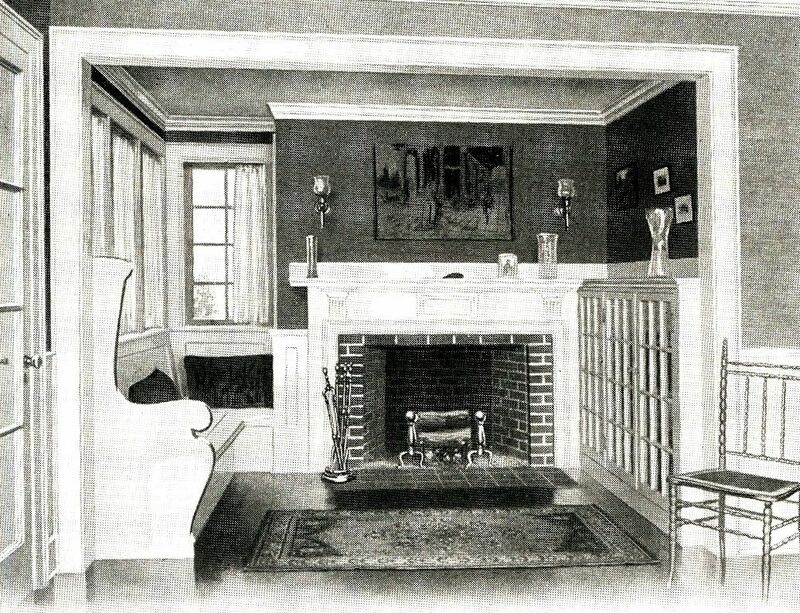 The Magnolia appeared on the cover of the 1918 Sears Modern Homes catalog. These specialty catalogs were expensive to create, publish and ship. Sears did not send out new catalogs each year to last years' customers. (There was a lot less waste in the world a scant 80 years ago.) These catalogs were shipped out upon request. And they were not automatically discarded when the year passed. In fact, 90+ years later, many of these catalogs are still kicking around (as is evidenced by activity at eBay). Lisa Tabor (owner of the Magnolia in Syracuse, NY) graciously shared this image with me. 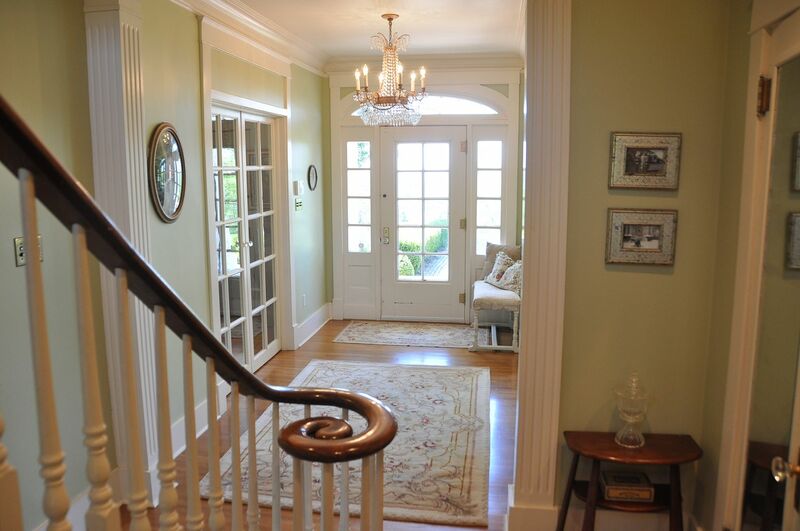 She has the original blueprints for her Magnolia, framed and hanging in the entry foyer. 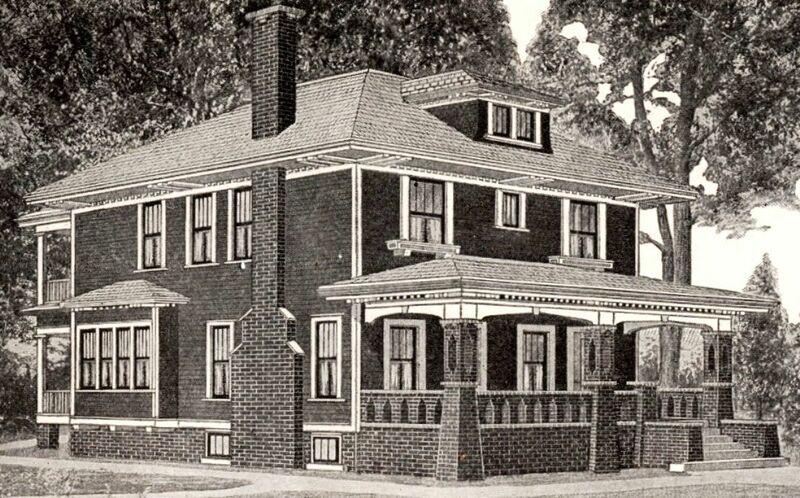 This picture shows that her blueprints were drawn on March 25, 1921 for the home's buyer, Mr. Edward Knapp. 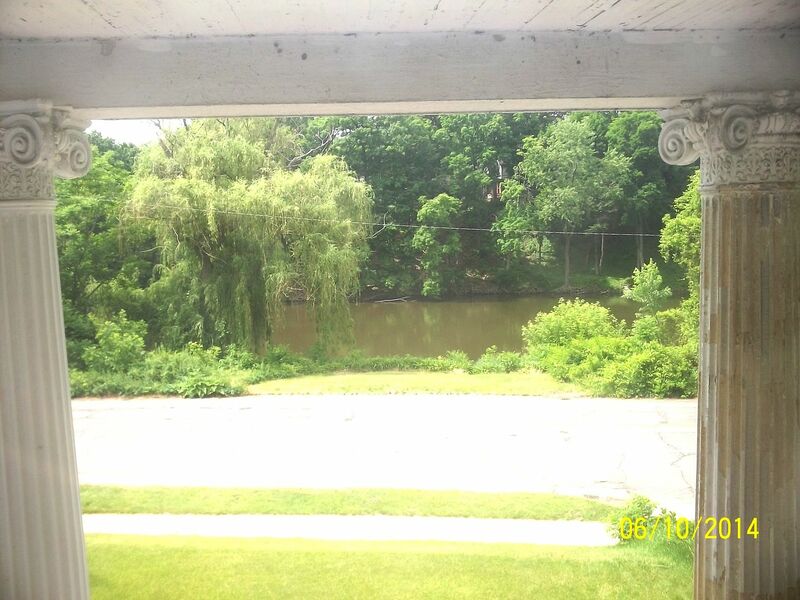 This is for a house that was first offered in the Spring of 1918. If the blueprints were individually drafted for every Magnolia, it would be very easy for Sears to offer the Magnolia in later years. Photo is is copyright 2013 Lisa Tabor and may not be used or reproduced without written permission. 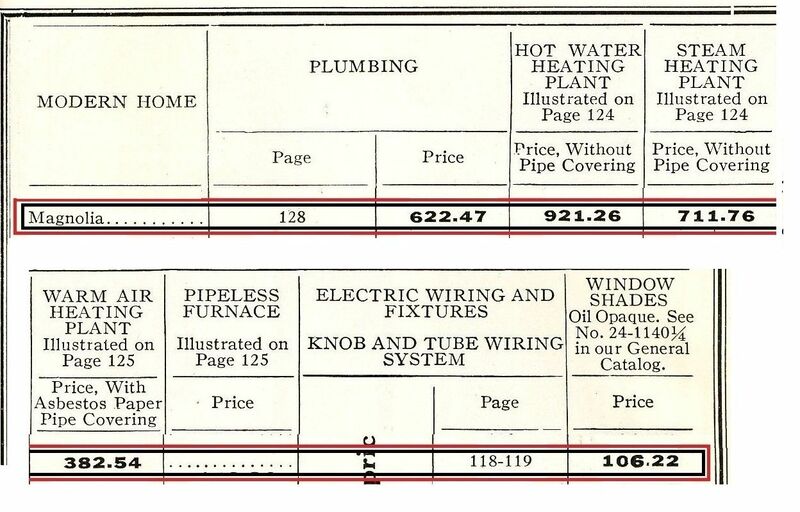 I've taken this price sheet (1921 catalog) and sliced the horizontal info into two segments so the print won't be so tiny. The hot water heating plant alone would add $921 to the price. Add in some plumbing ($622) and oil shades ($106) and that's another $738. In 1922, the Magnolia was offered for $5,849. That, plus the heat, plumbing and shades takes you to $7,498. As mentioned, everything in this house is picture-perfect. 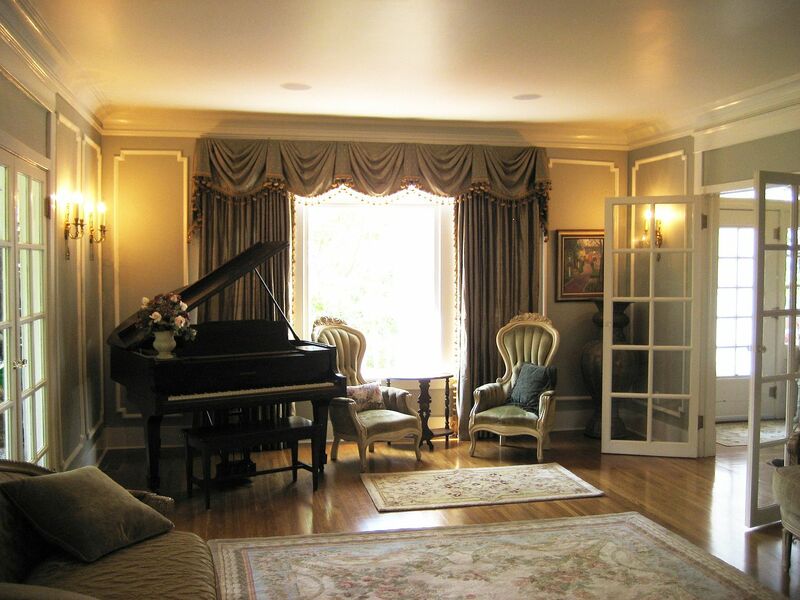 Every room is gorgeous and well-appointed and beautifully decorated. 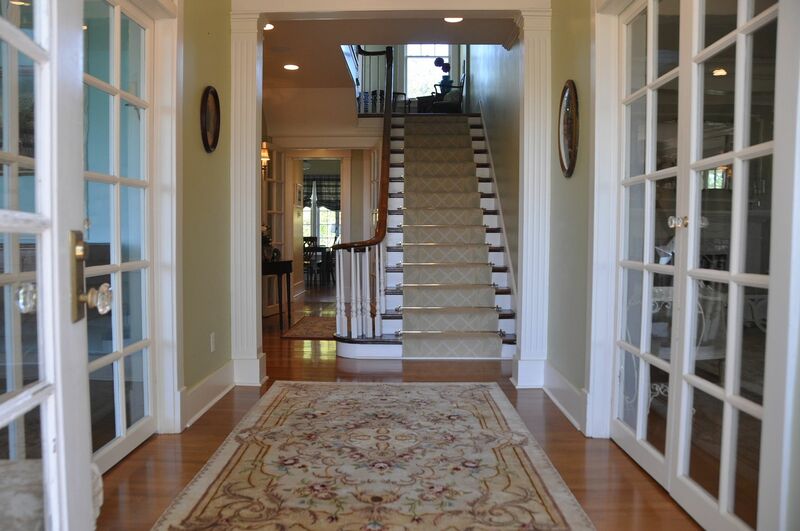 The entry hall is flanked by french doors leading to the living room (right) and dining room (left). 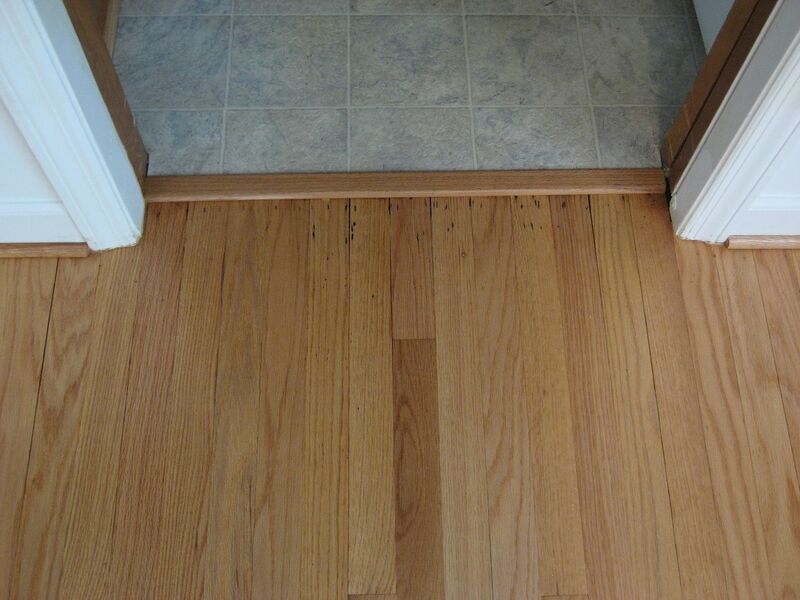 The oak floors were replaced several years prior. 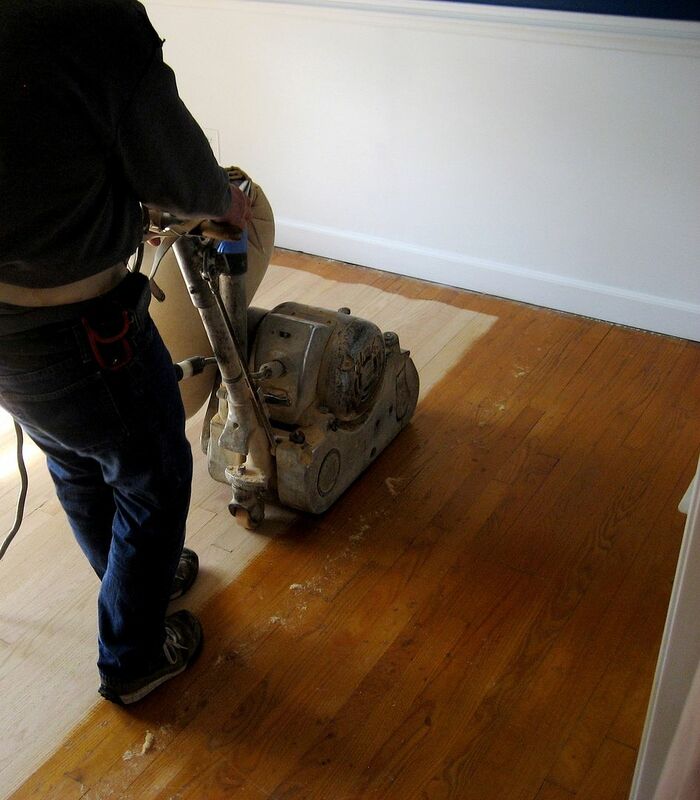 Pulling off a floor vent, I found four layers: The original diagonal planking (subfloor), original tongue and groove oak floors, a layer of 3/8" plywood and it was topped with tongue and groove white oak floors. That's more than 2" of solid flooring. This house could double as a bomb shelter. The fan lite over the front door has lead muntins, not wooden, but they're probably original. The catalog image for the Magnolia shows wooden muntins (all four years), and yet the Magnolias in Canton, Ohio and Lincoln, Nebraska have the lead muntins. Was this an optional upgrade? Or a clue to when it was built? I'd love to know! 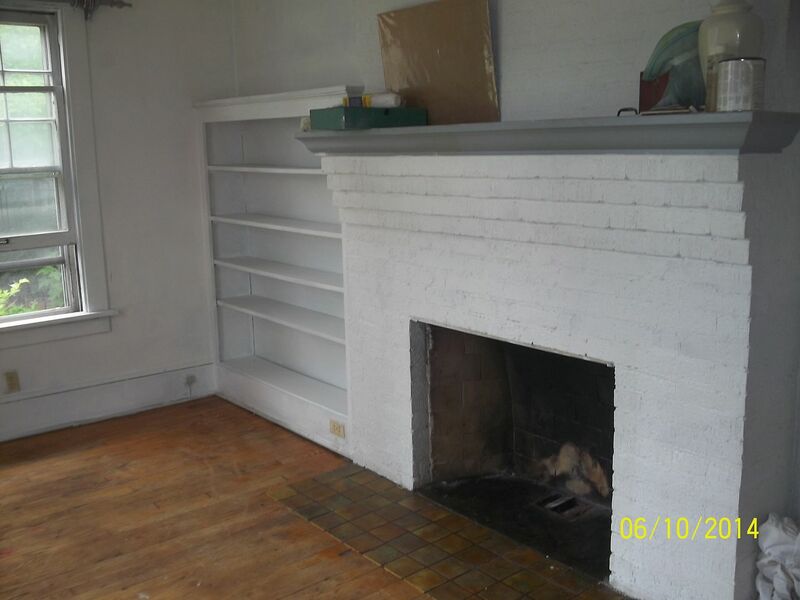 The living room fireplace doesn't match the fireplace mantel shown in the catalog, and yet it's a perfect match to the mantel shown in the pictures of the Magnolia in Lincoln, Nebraska. 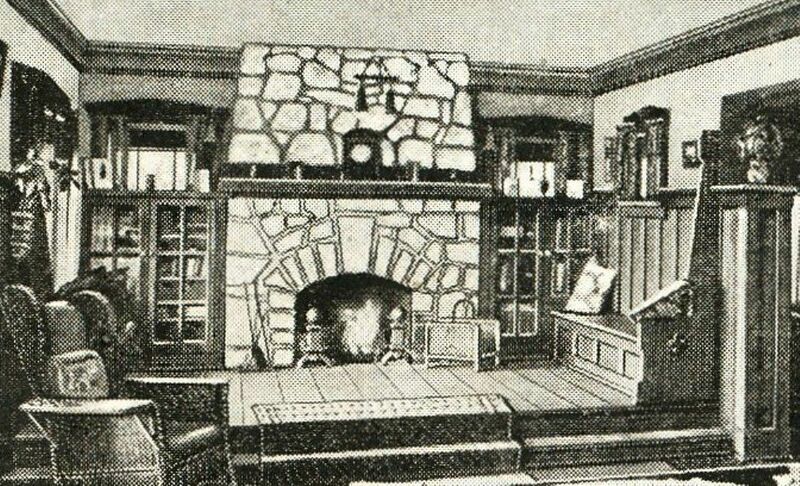 Close-up on the fireplace. The marble (surrounding the opening) was added. 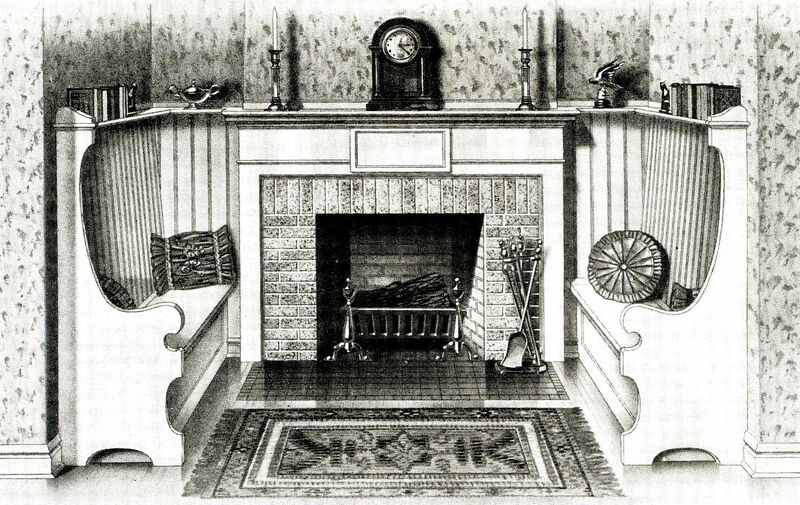 The hearth is also marble and not original. When built, it had a brick hearth and brick flanking the opening. 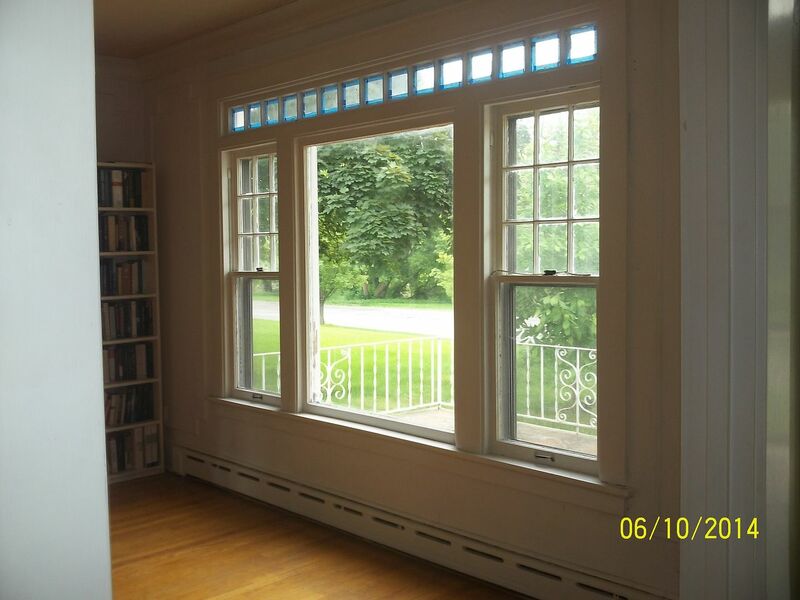 These french doors lead to a spacious sunporch. 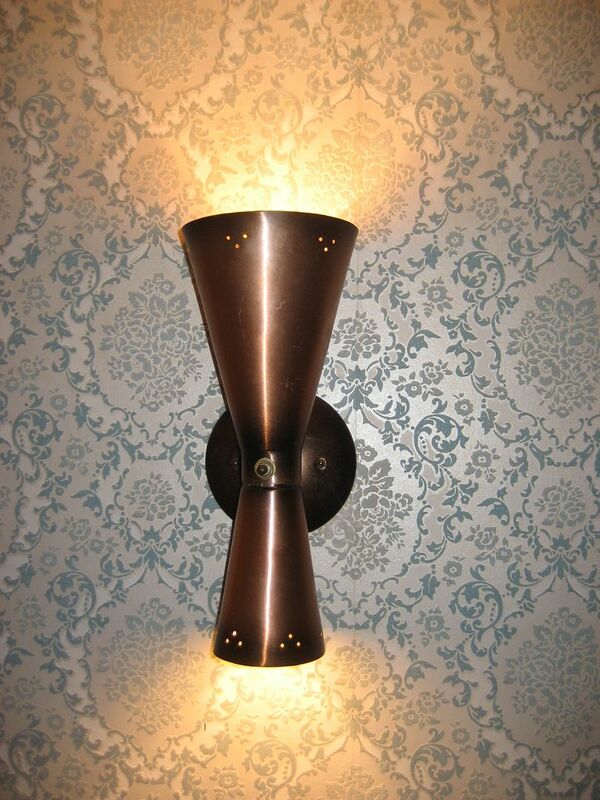 Note the many sconces. 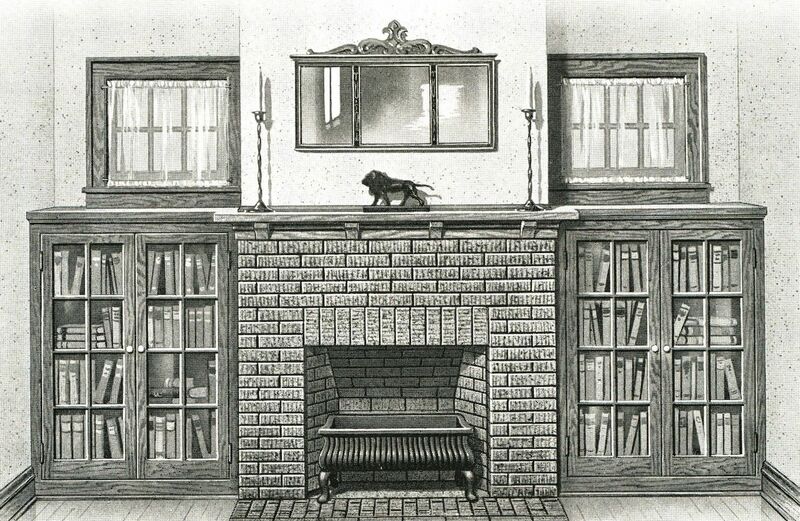 Detail of the "ingleneuk" (or "inglenook") as we Americans are wont to say). Cozy, practical AND historic! As mentioned earlier, every corner of this house looks like something out of glossy magazine. 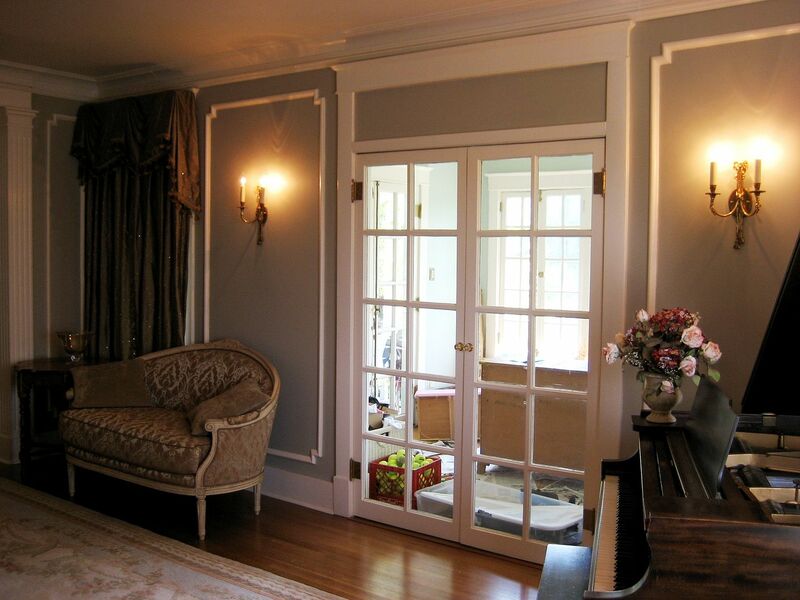 The french doors and hardware are either original or an accurate reproduction. 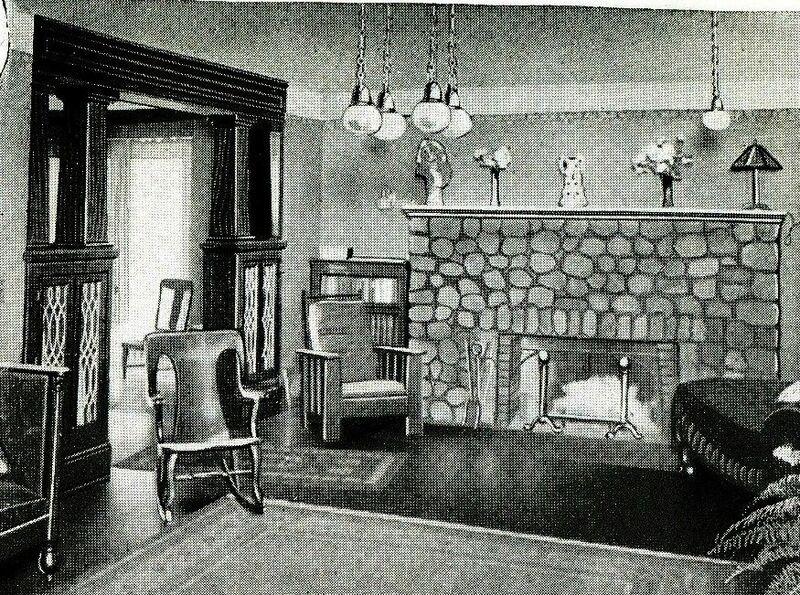 Another view of the Magnolia's living room. 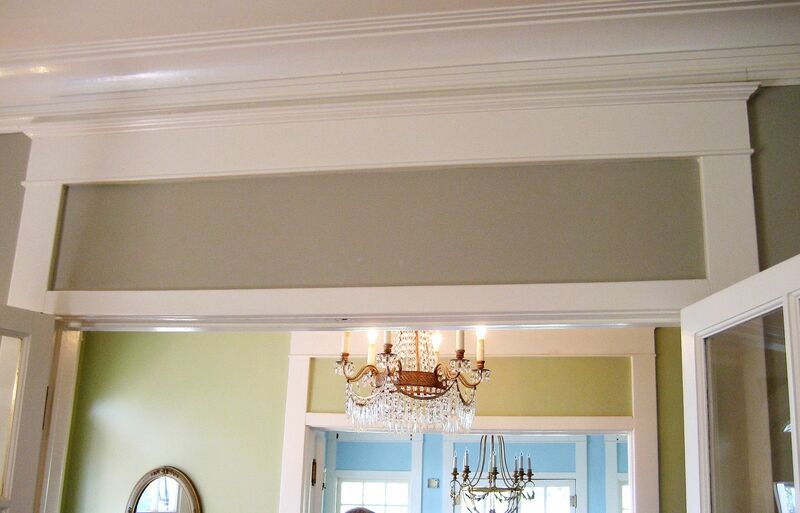 A common feature found throughout the Magnolia is what I call, "the fake transom." I've never seen anything like this in any other Sears House. 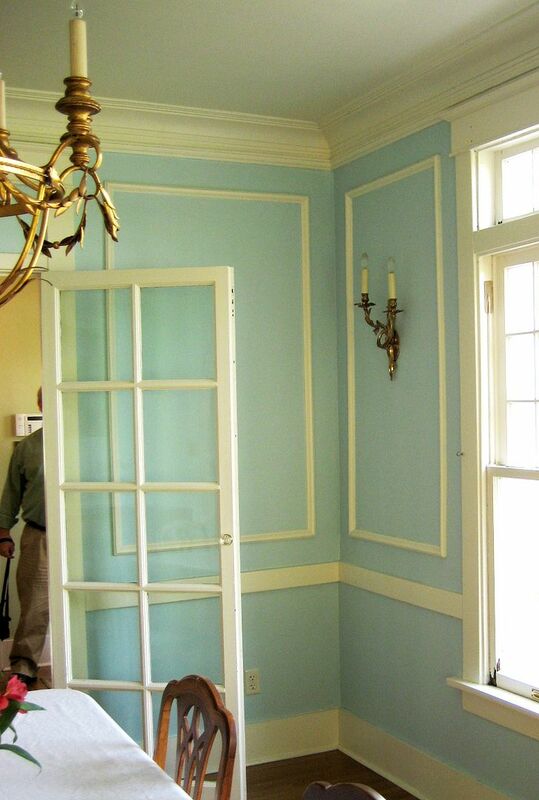 At first blush, you'd think this was a transom that had been filled in, but in fact, the house was built this way by design. 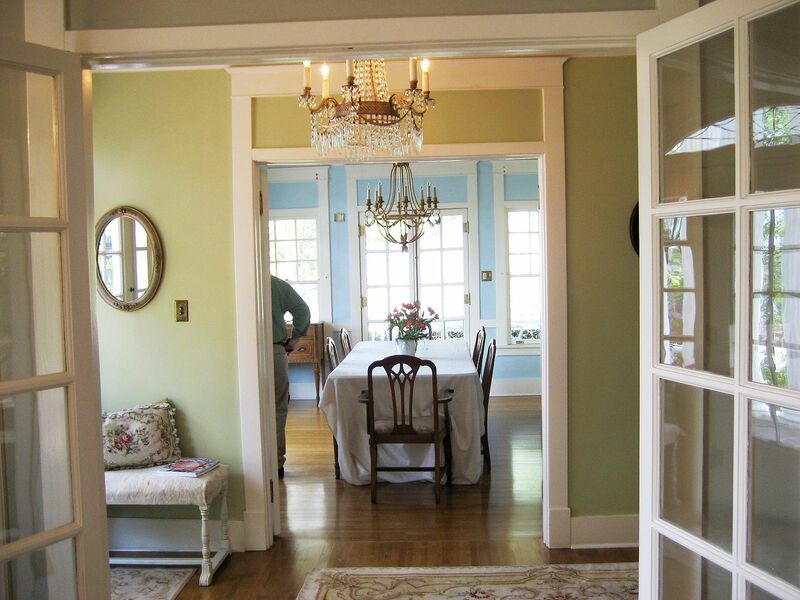 A view from the living room into the foyer and dining room. 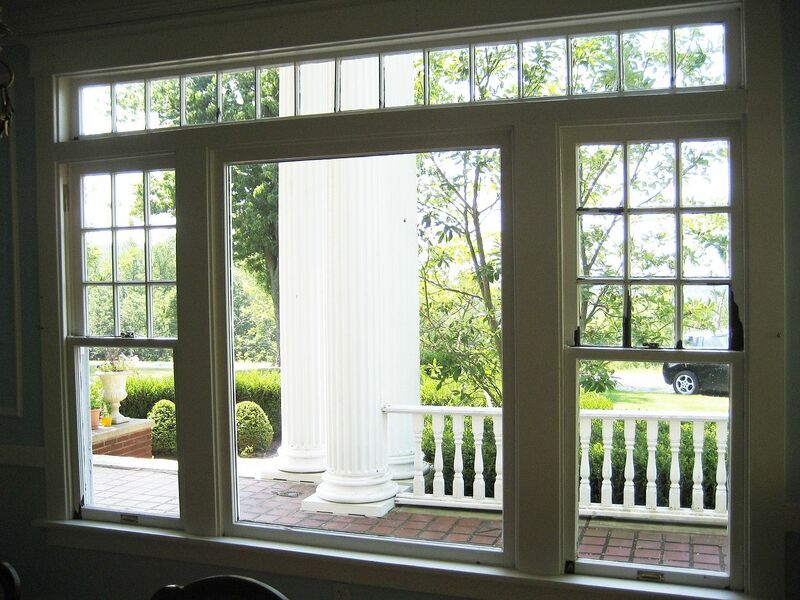 There are a lot of windows in this dining room. In fact, I had a time getting the lighting right. 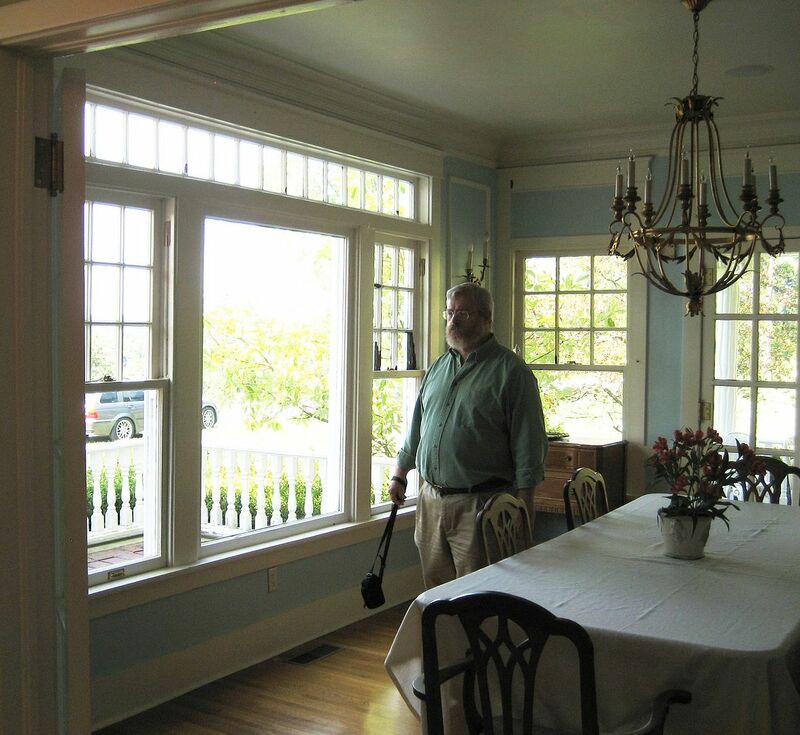 Hubby admires the beautiful windows in the dining room. 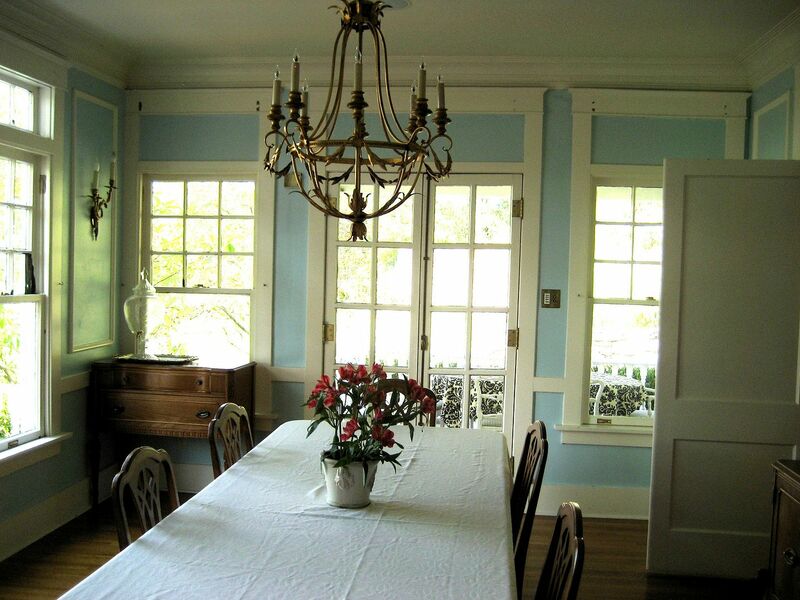 God bless the folks who restored this house several years ago - they saved the original wooden windows! Close-up of the intricate moldings and millwork. A view from the dining room. A view from the landing. 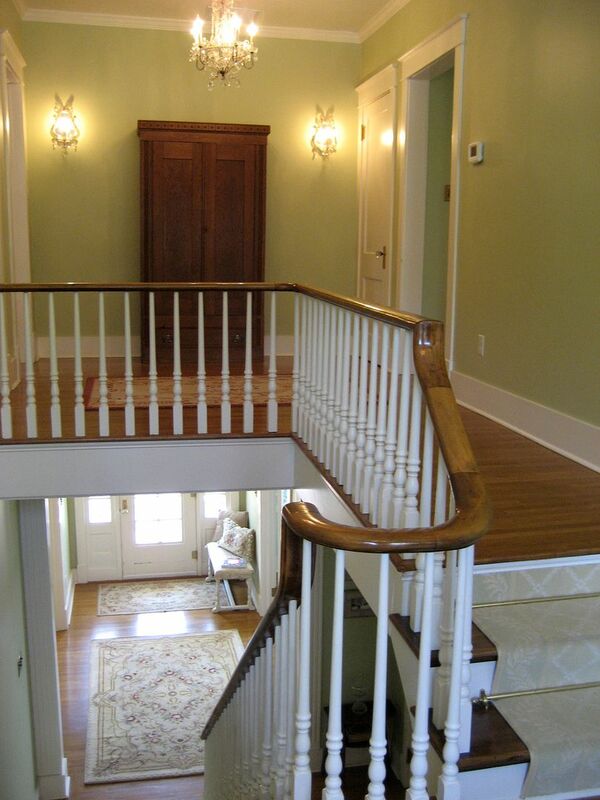 When built, those spindles were stained with varnish to match the banister. 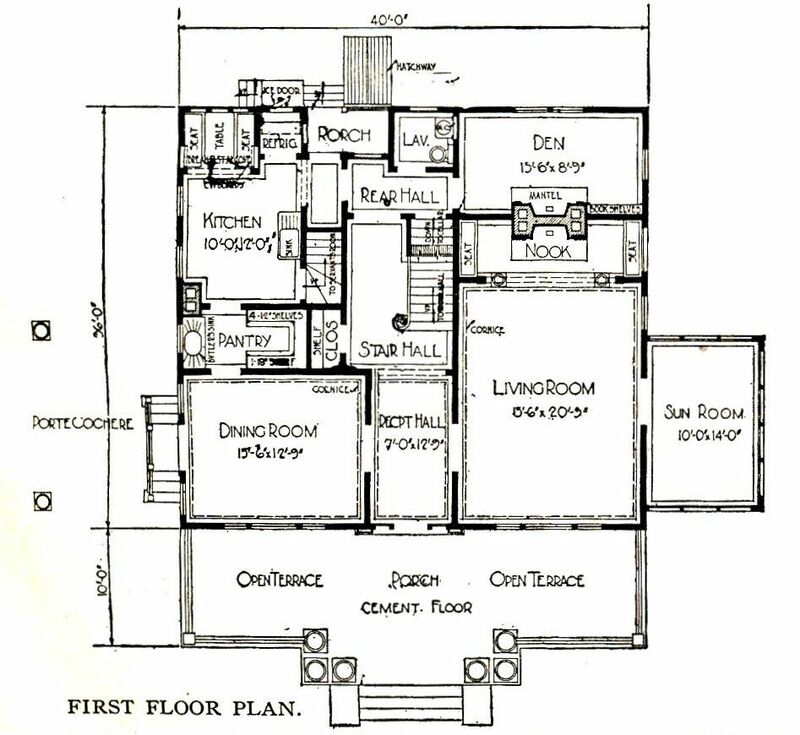 In the floorplan, a pair of french doors lead out to a small balcony on the home's rear. 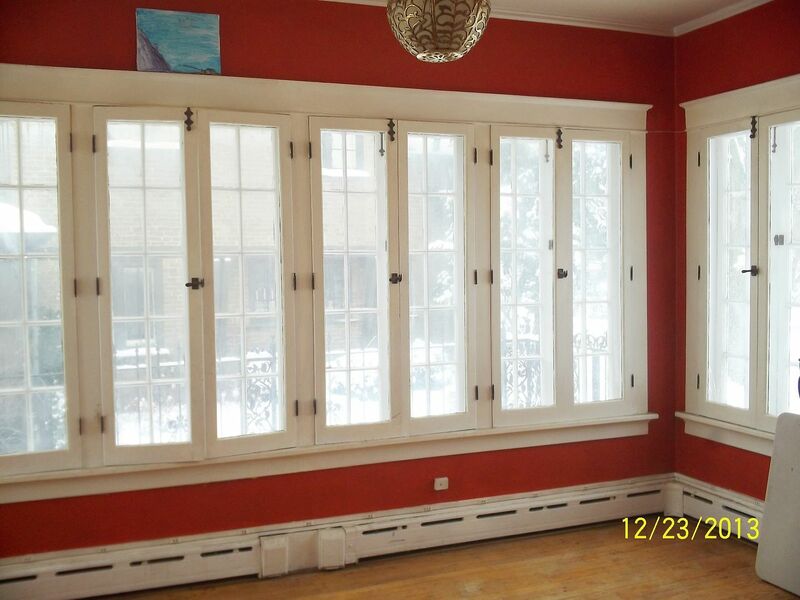 It seems likely this house was built with the windows in place of the french doors. 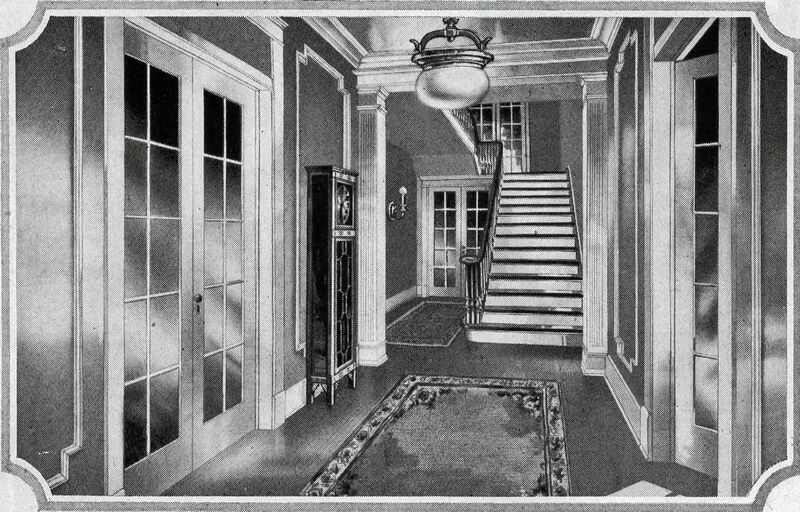 The original door to the third floor (attic) was in the home's main hallway, but was moved around the corner to the small hallway that leads to the family bathroom. 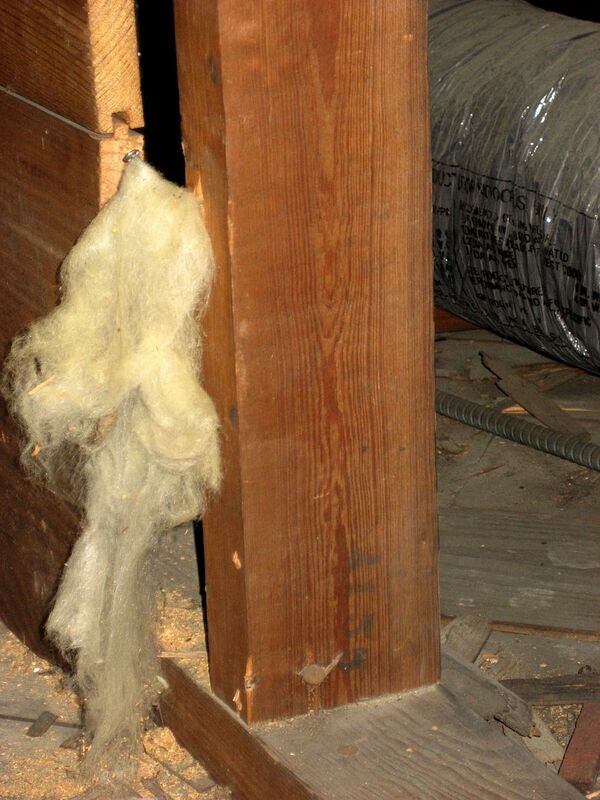 This was another very smart move, as it took out a landing and a tight 90-degree turn on that narrow attic staircase. 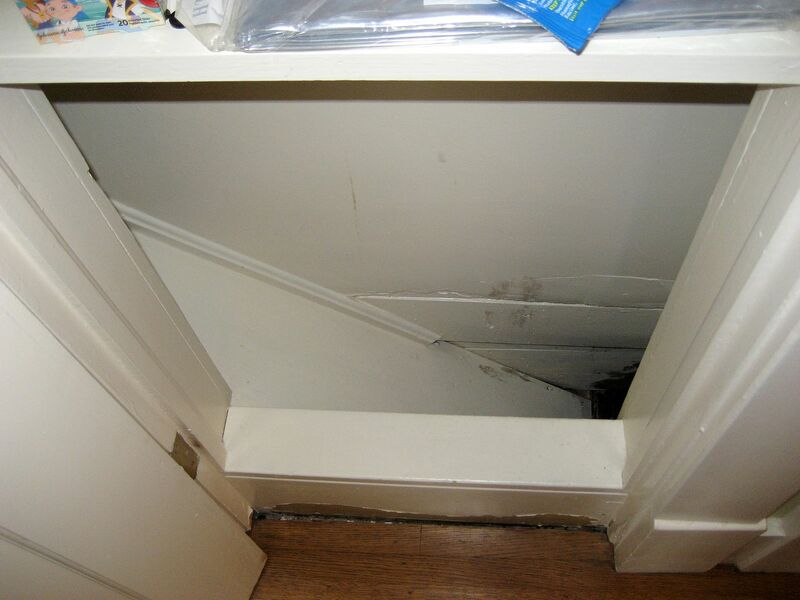 Shown above is the doorway to the linen closet (next to the family bathroom). 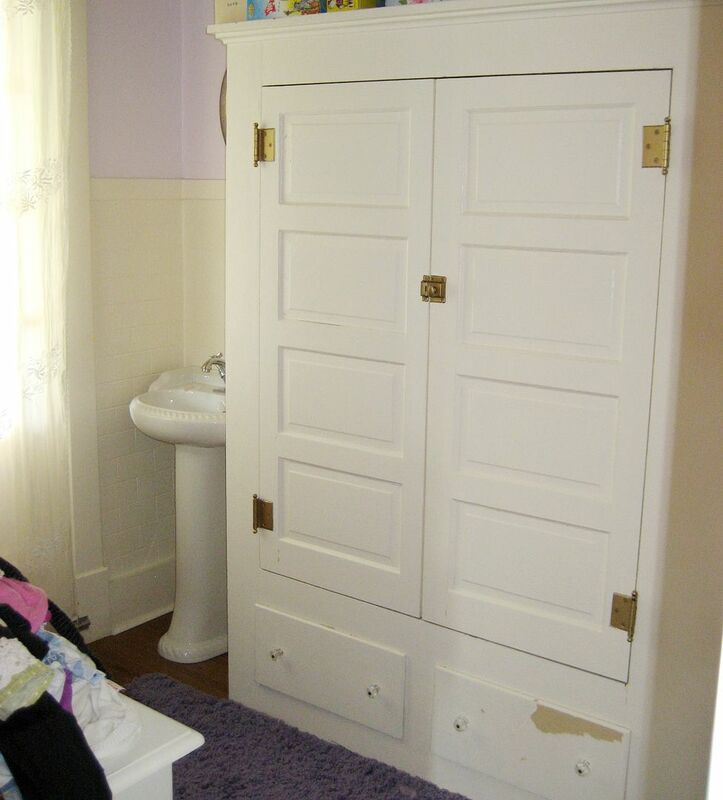 In the 1950s, a small shower stall was added to the bathroom, and that took out 90% of the depth in this linen closet, leaving only the small space you see above. This was turned into a laundry chute , which is also a thoughtful design. 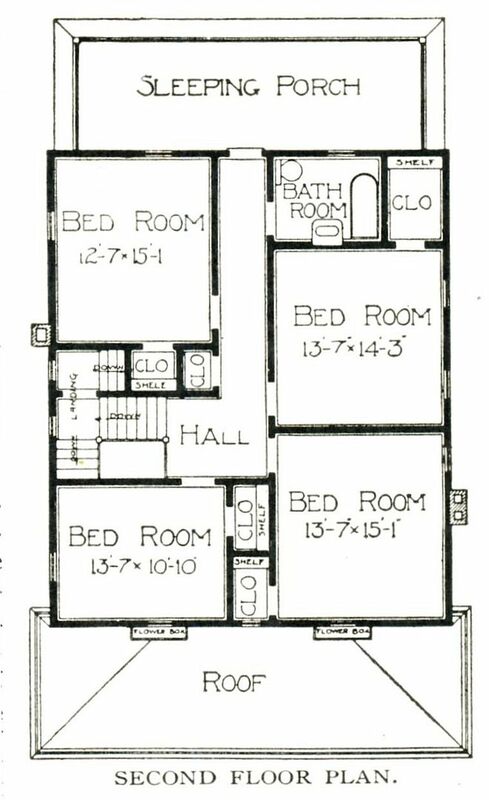 If you study the floorplan (shown further down), this all becomes clear. 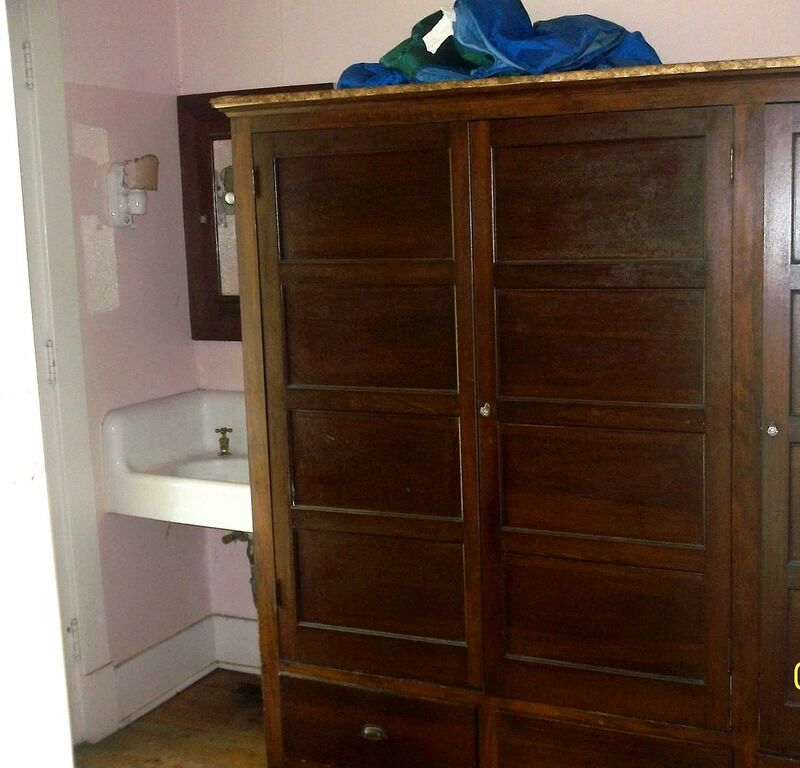 The floorplan shows these built-in cabinets in the master bedroom dressing room. 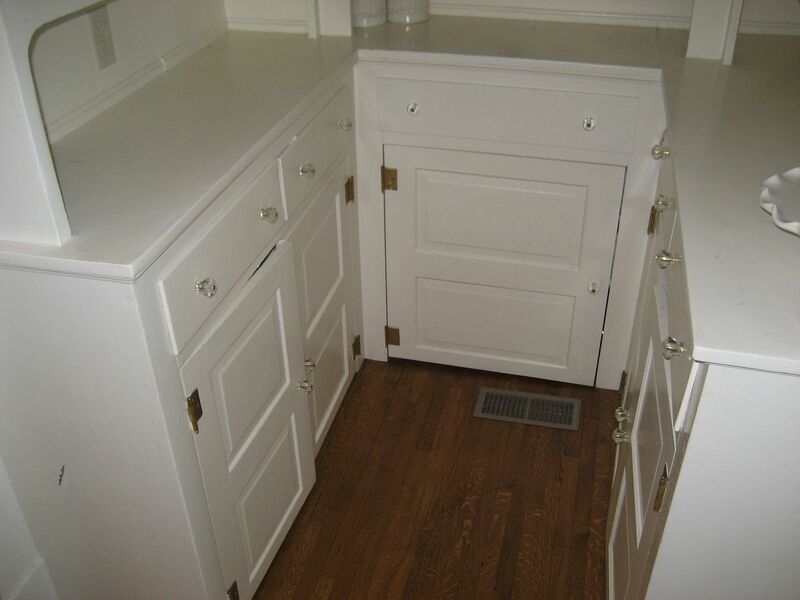 Inside these cabinets are a "special shelf" for hats. 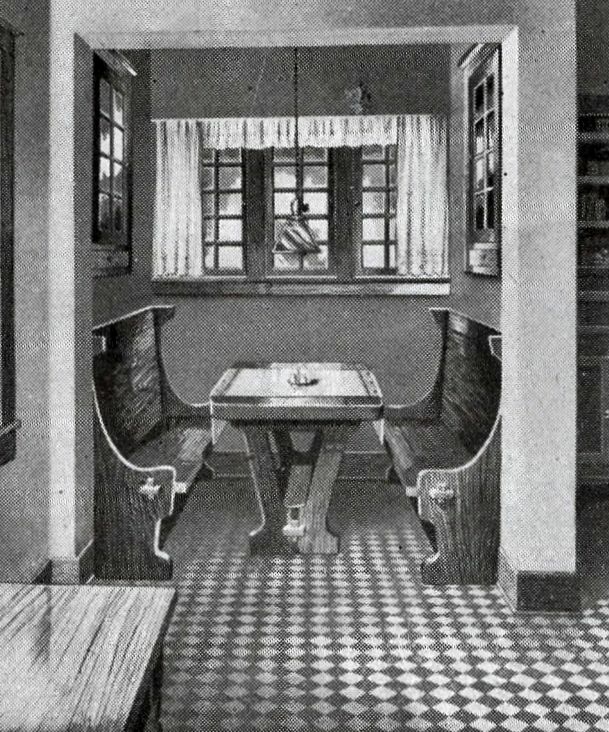 In 1924 (or 25), there was a small cast-iron pedestal sink in the corner. 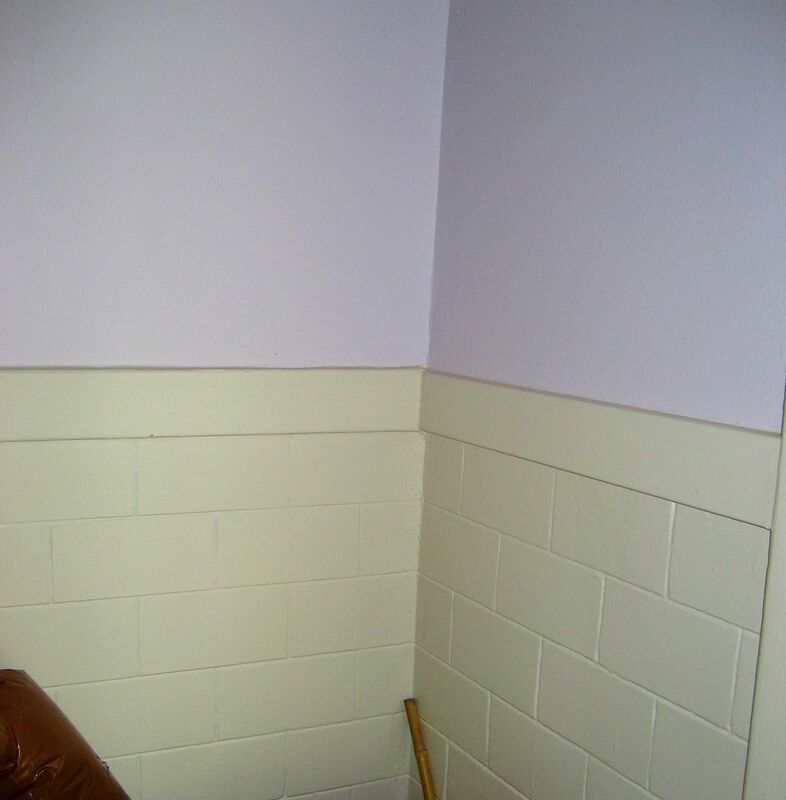 The walls on the dressing room have this faux subway tile. 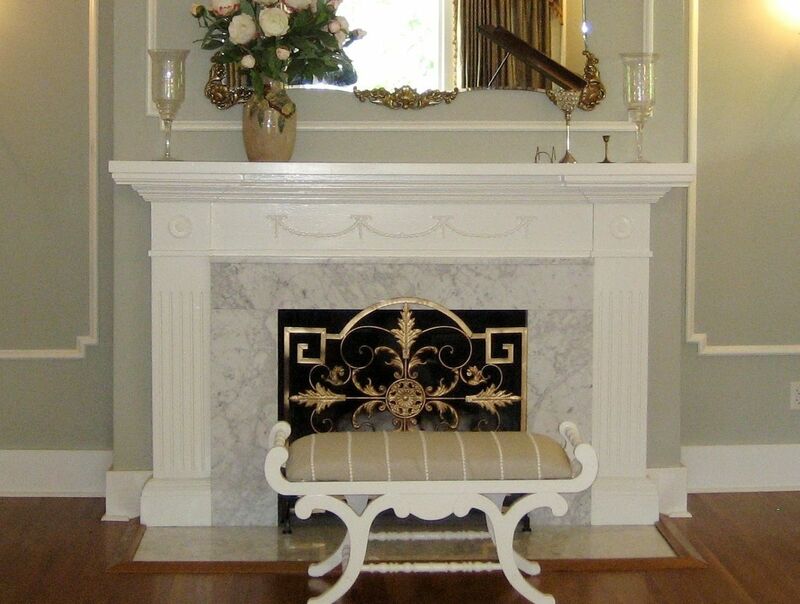 In fact, it's plaster that's been etched with lines and topped with a piece of trim. 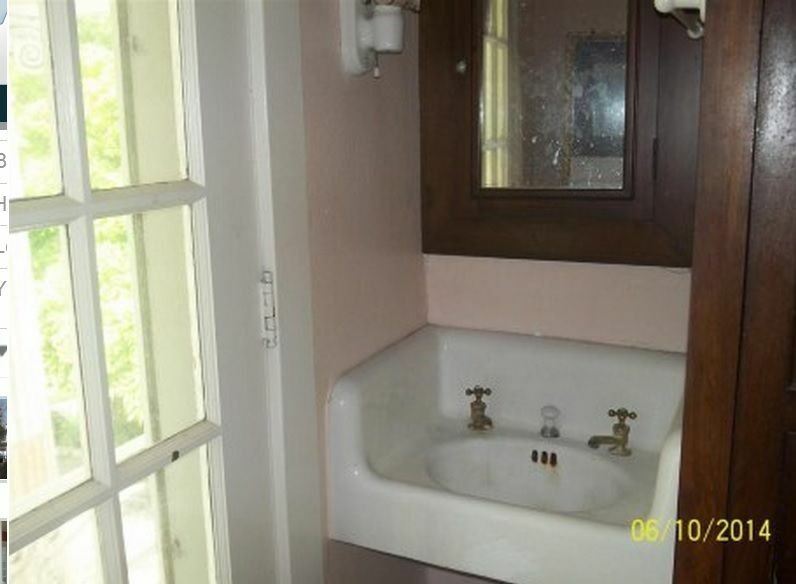 This was commonly used in bathrooms of the late 1910s and early 20s. I'm not sure why they used it in the dressing area. 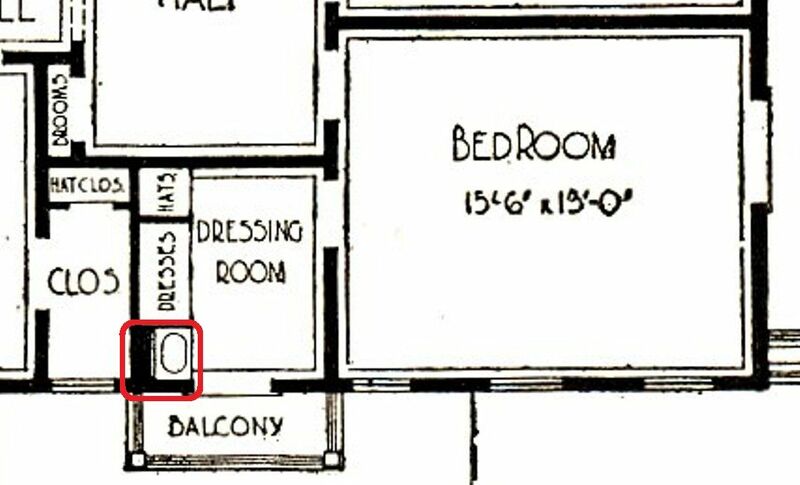 If you look at the floorplan, you'll see that this corner of the dressing room shows a small sink. Seems like an odd spot for a sink! To the left of the picture, you'll see door trim, which is the right edge of the door that leads out to the second-floor balcony (on the front). Curious placement! If you had x-ray vision, you could look through this wall (shown above) and see the exact same sink on the other side of the wall. With all the plumbing (supply lines and drain) just inside the wall, adding another sink on the other side was pretty easy. 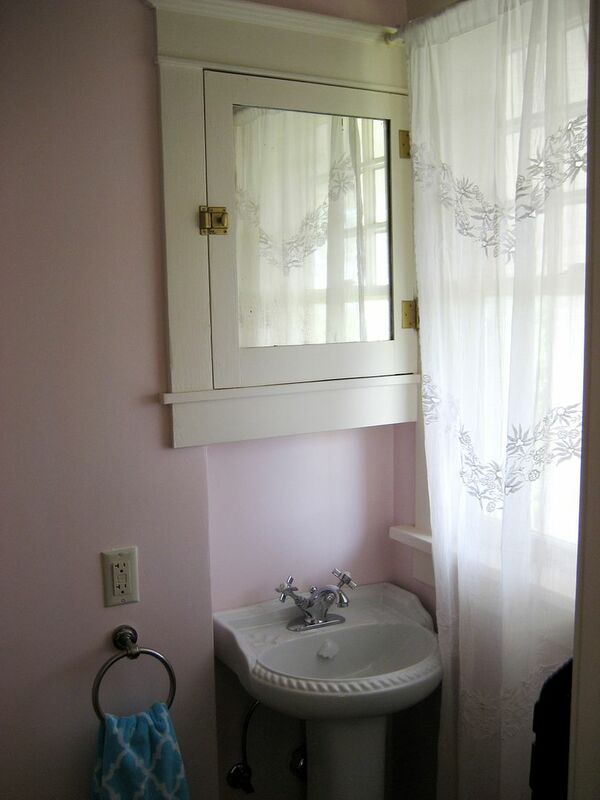 This sink (shown above) is underneath one of the little windows that flanks the second-floor balcony on the home's front. 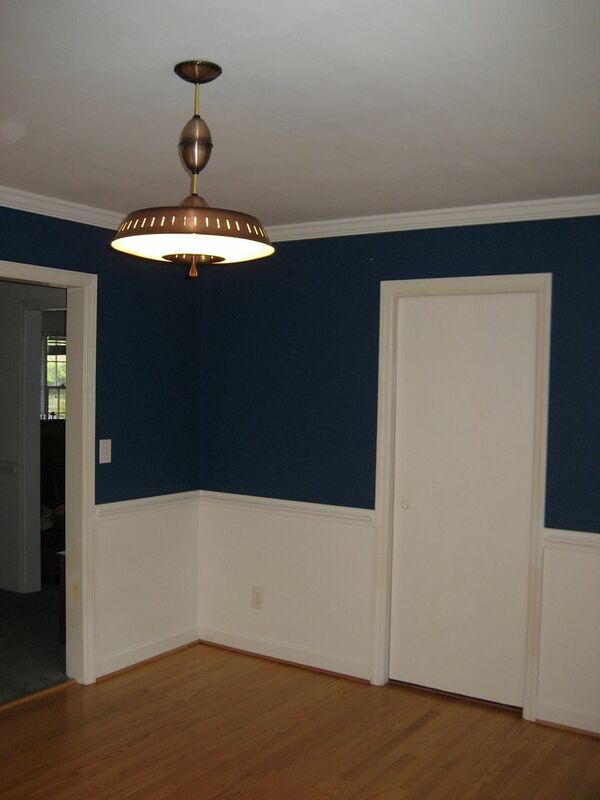 It sits inside a spacious walk-in closet in the other front bedroom. 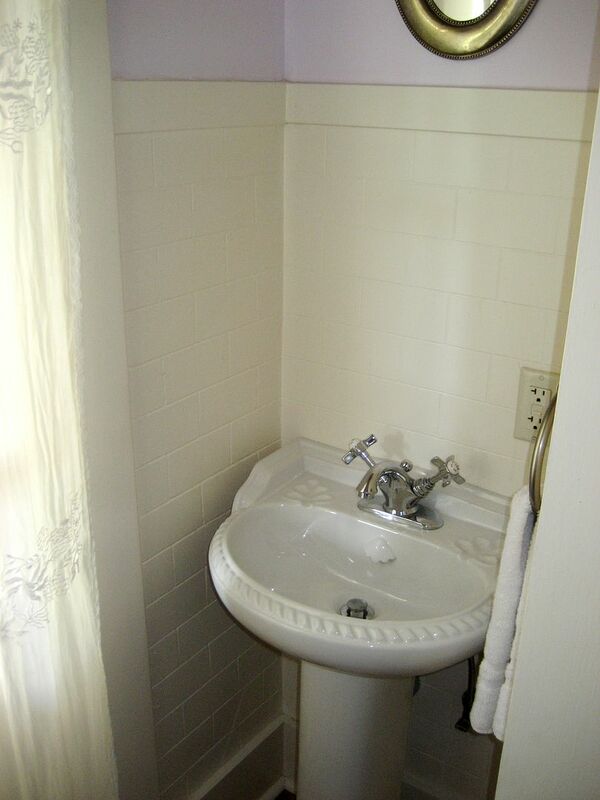 This sink has been added, and the medicine chest shown here was originally on the OTHER side of the wall. It was moved here for reasons I can't begin to understand. 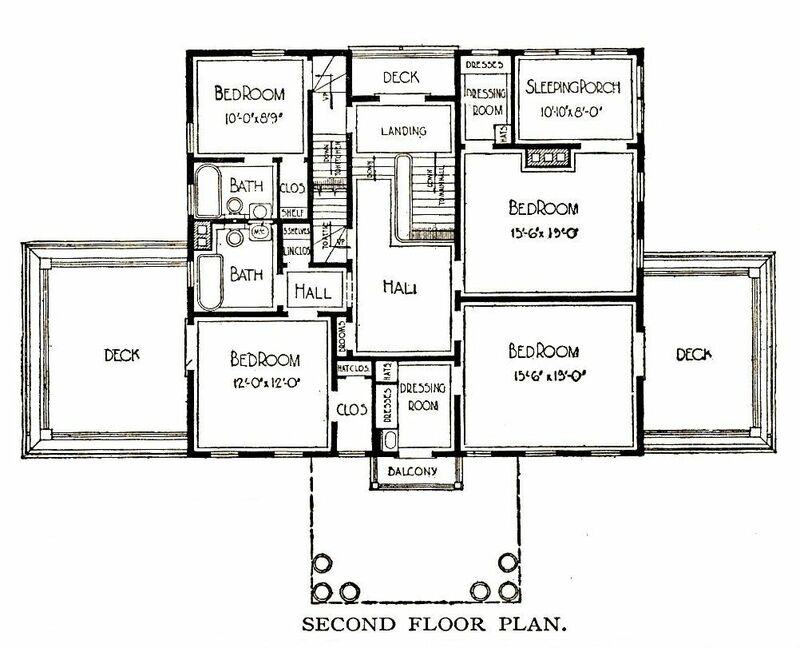 As per the original floor plan, there is a permanent staircase to the attic, behind a door off the second-floor hallway. 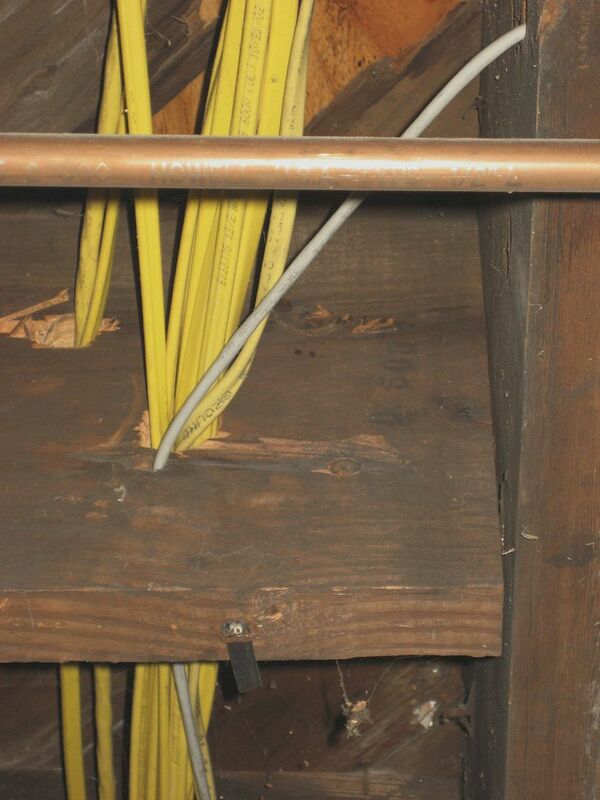 This attic was finished off and (like the rest of the house) is in beautiful condition. This dormer window is on the front of the house, and you can see a piece of the porch balcony (on the roof) through the small window. 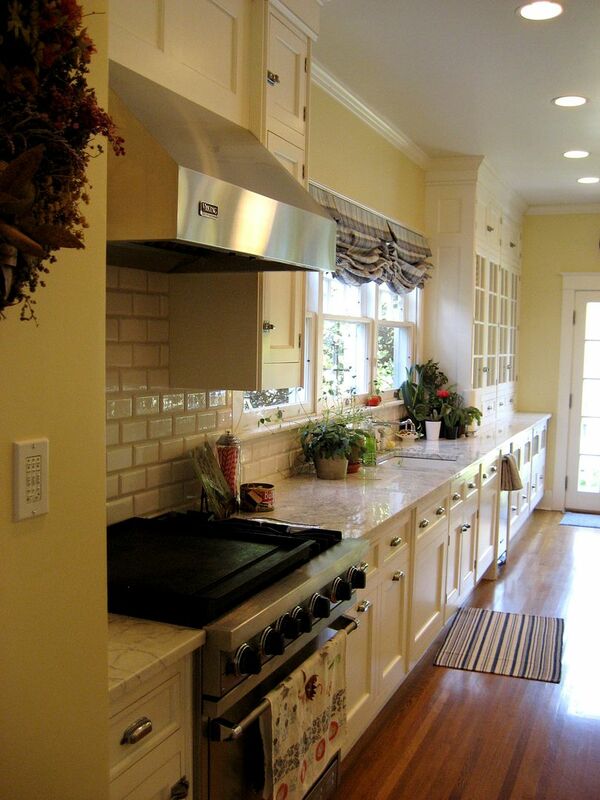 The original kitchen stopped at the end of that tall cabinet in the right of the picture. The entire 40-foot expanse of the back of the Magnolia was enlarged by about 10-feet, which dramatically increased the floor space of the kitchen. In addition. 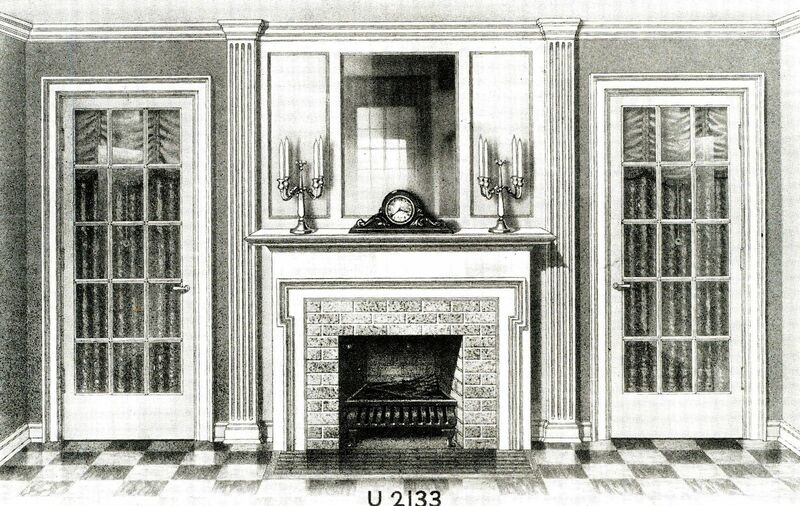 the interior staircase (which lead from the kitchen to the servant's quarters) was also removed which added about four feet of width to the Magnolia's kitchen. 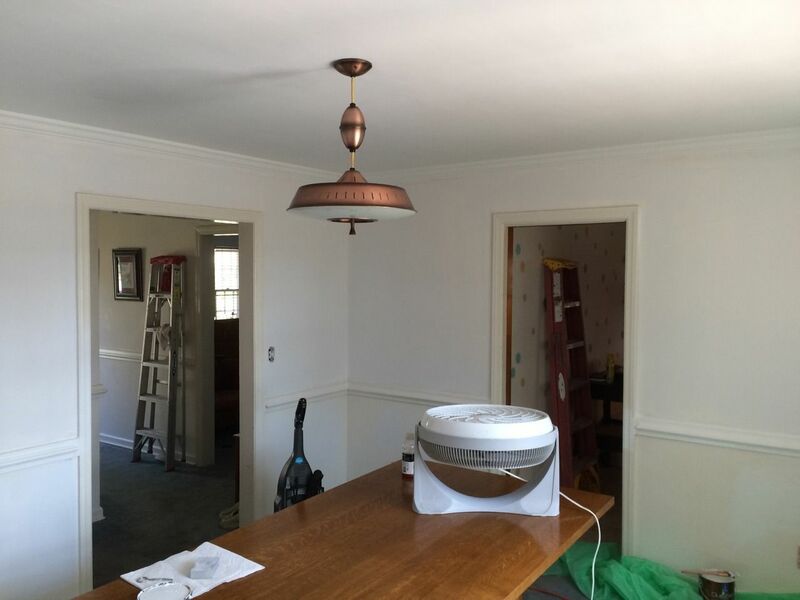 The kitchen, as seen from the Butler's pantry. The den in the Magnolia was a mere eight feet deep. Pretty miserable. The 40-foot wide addition across the back of the Magnolia opened up the den quite a bit, too. 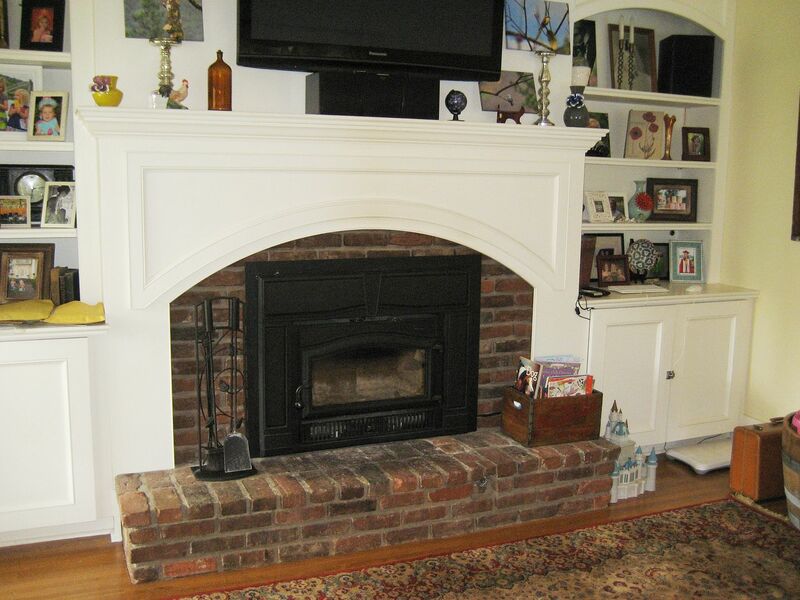 The original fireplace was replaced with a new masonry fireplace which was added on to the existing firebox. 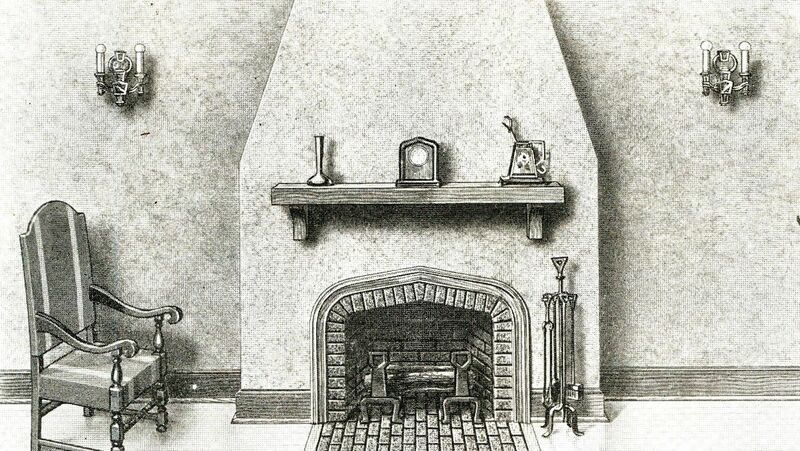 Notice the depth of the wall beside the fireplace. Incredibly, the butler's pantry is mostly original. 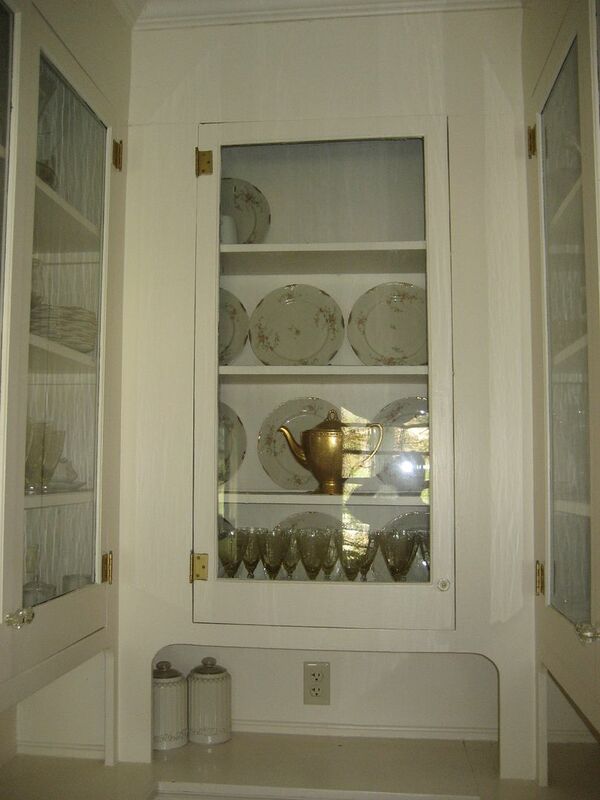 Base cabinets in the butler's pantry. 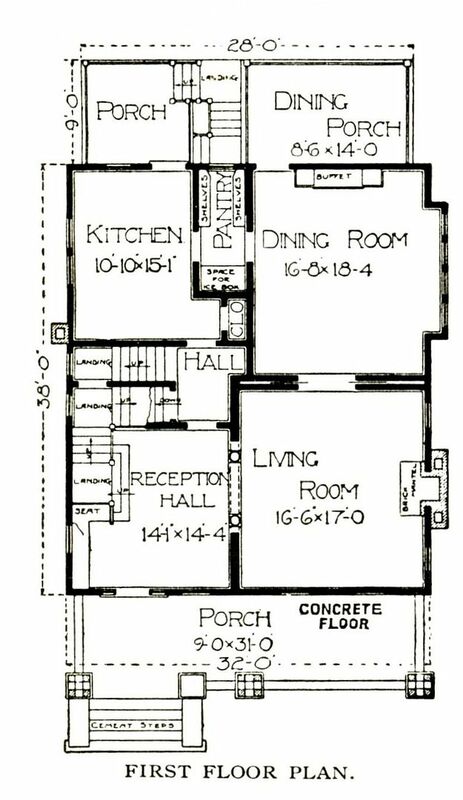 Study this floorplan for a bit and you'll soon figure out all the changes that were made to the West Virginia Magnolia. The second floor is pretty darn busy. Check out the sink in the dressing room and you'll see how easy it'd be add another sink to the closet in the other front bedroom. Finding marked lumber in the basement proved a bit difficult. Most of the basement was finished, and there were only a few places were framing members were accessible, such as this space above the old coal bin. Secondly, the basement has a ceiling height of nine feet, so we were looking way over our heads! Looking at this piece, I thought I saw a number, but the wood was so dark it was tough to be sure. Do you see the number? The homeowner had two great ideas. One, he fetched us a small step ladder so we could get a little closer to the lumber. He also suggested we take a rag and wipe off the coal dust. Voilà! Now we're trying to figure out if that's a "C" or a "G"! We know that the Magnolia was also offered as a "plan," so finding these marked beams was a nice affirmation that this was "the whole kit and caboodle". 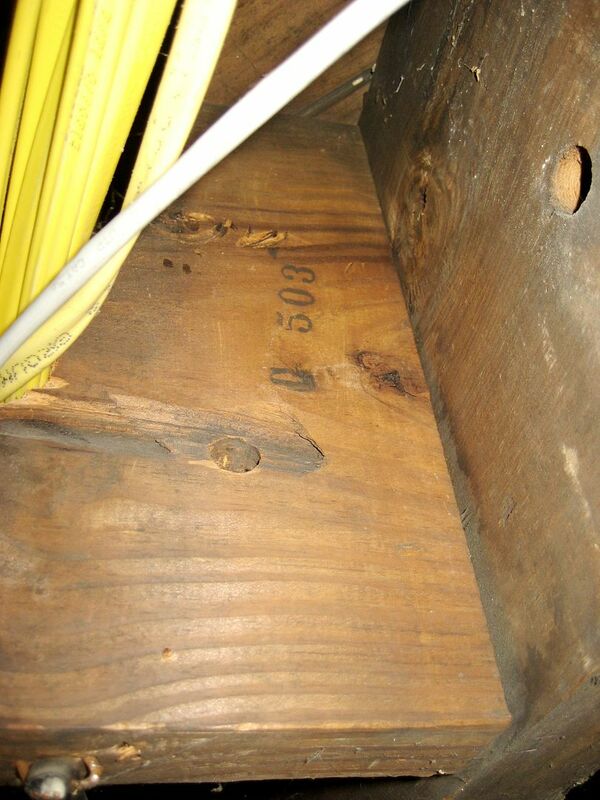 In the knee walls of the attic, I also spotted a mark! 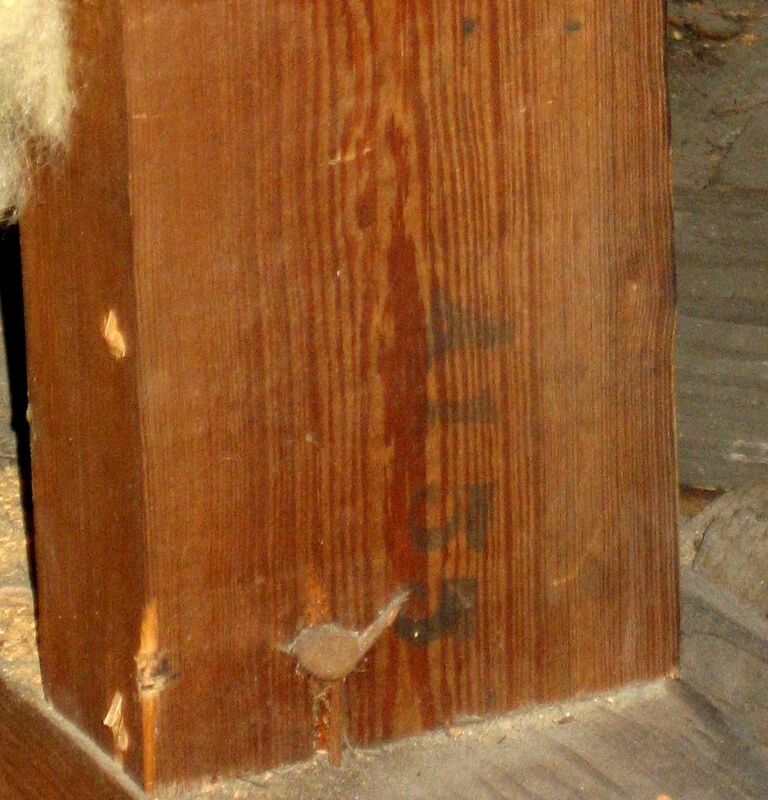 It appears to say "A 155." 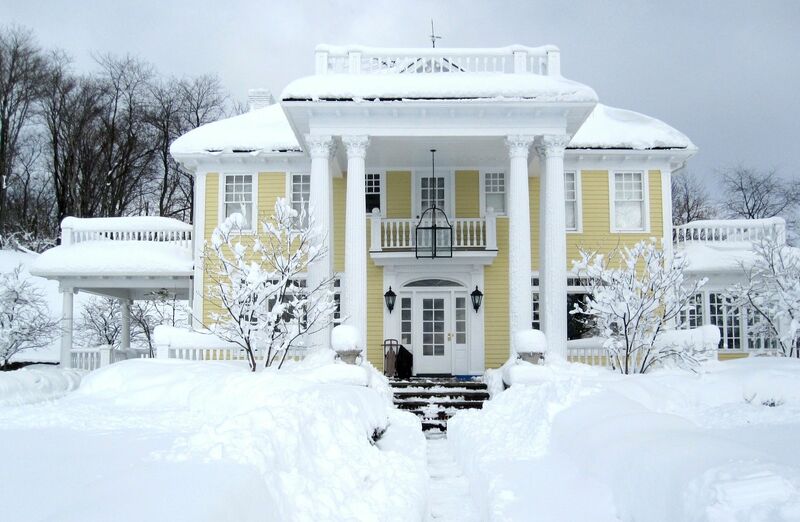 The Magnolia's owner sent me a photo of his beautiful house, taken last year during a West Virginia snow storm. It's almost too perfect to be real. For my next birthday, I think I'd like a cake done up to look just like this. 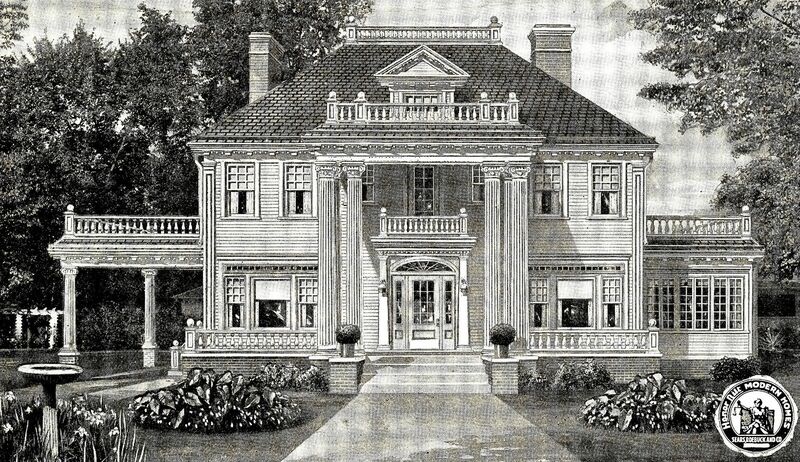 The Magnolia as it appeared in the 1922 catalog. Many thanks to the homeowner for allowing me to spend two glorious hours at his beautiful home, examining it from top to bottom. If a mother was allowed to have favorites, this would be one of my favorite homes. Of the eight known Magnolias in the country, three of them were discovered via comments left at this blog. That’s 37% of the Maggies being discovered thanks wholly to the readers (”bird dogs”) reporting on their finds. So the most important question of the day is, where’s the ninth Magnolia? Wayne - my husband - my favorite West Virginian, died by his own hand two years after we saw this house. To read a fascinating story about a 94-year-old man that recalled building a Magnolia in Canton, click here. Some rumors just never die. 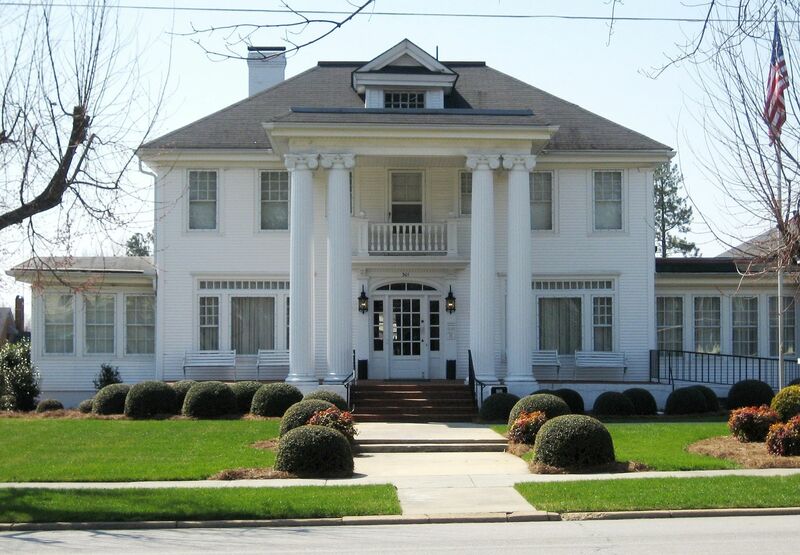 There’s a persistent (and false) rumor making the rounds that beautiful Neo-Classical Revival home featured in “The Notebook,” is a Sears Magnolia. Let’s go right to the photos. 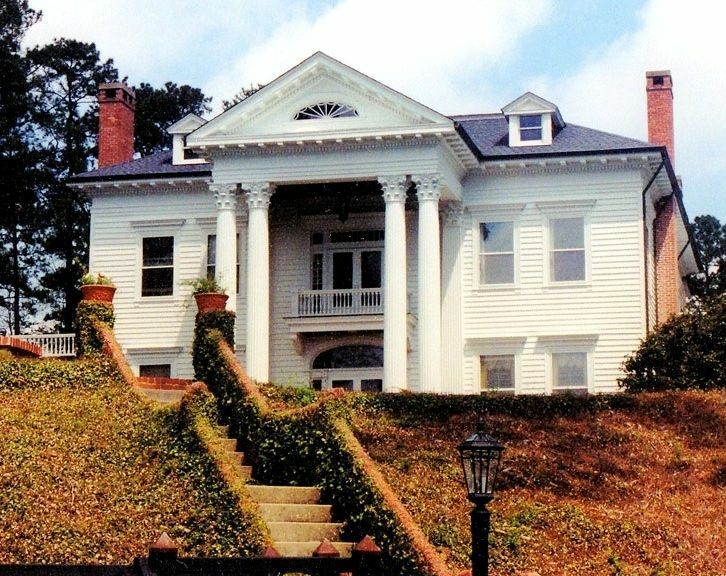 The house featured in "The Notebook" is the Black River Plantation House in Georgetown County (South Carolina). It is a beauty, but it's not a Sears House. And yes, I'm 100% certain. 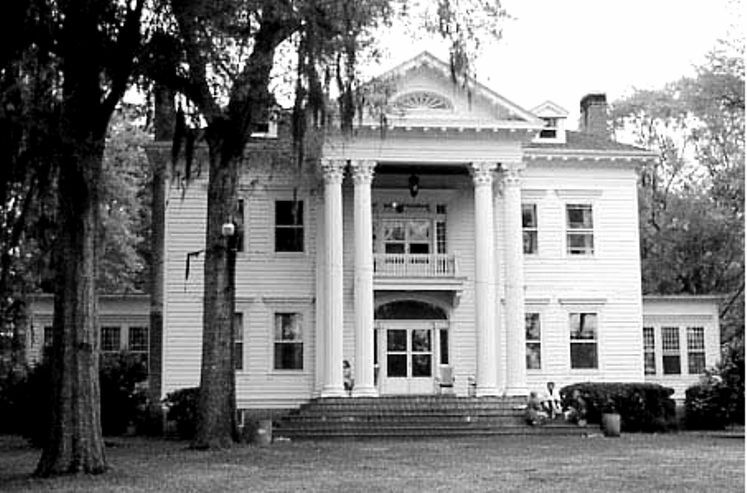 The photo above is from the South Carolina Department of Archives and History (Black River Plantation House, front elevation). Here's the real deal: A Sears Magnolia in Benson, NC. Now let's compare them side-by-side. 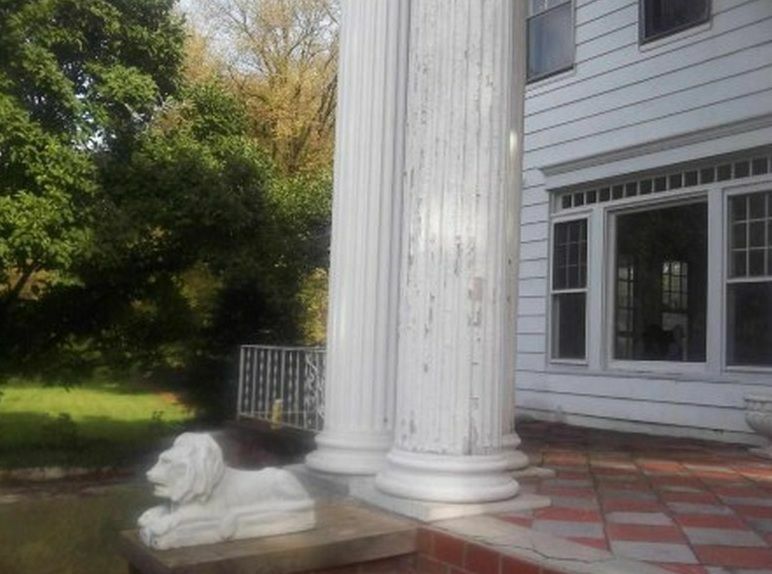 At first glance, both homes have four walls, a roof, two-story columns and some windows. But that's where it stops. The Black River Plantation (on the left) has that massive front-gable atop that porch. The window arrangement on the non-Magnolia house is also quite different. And Black River Plantation is much larger than the Sears Magnolia. And look at how tall the Black River Plantation is! Notice how much space exists between those second-floor windows and the roofline. Those are important details. If you still think these houses are identical, drop me a note and I'll send some biscuits for your seeing-eye dog. The photo on the left is from the South Carolina Department of Archives and History (Black River Plantation House, front elevation). 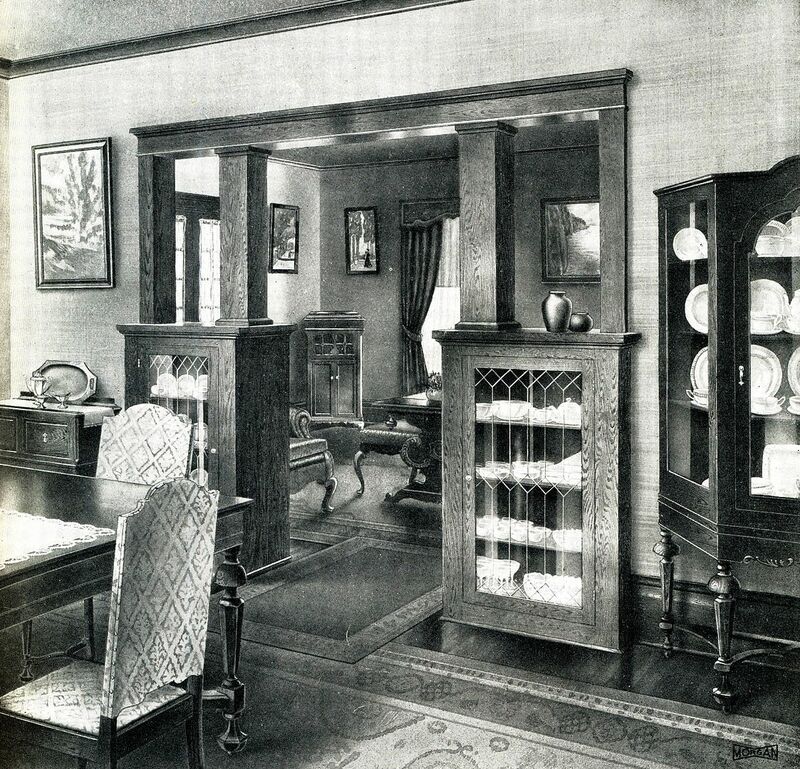 Here's a catalog picture of the Sears Magnolia (1920). Here's the authenticated Magnolia in Benson, NC. Oh my! The Black River Plantation doesn't look like this, does it? Where did this nutty rumor get started? Apparently, here (see below). In 1994, the Black River Plantation was placed on the National Register of Historic Places. Note the highlighted text below. 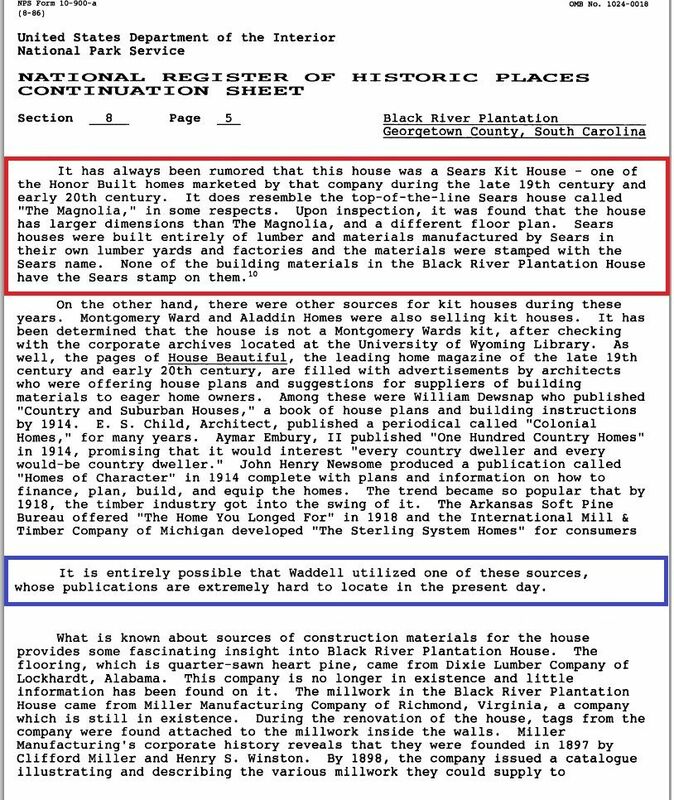 The author wrote that it's possible that Waddell "utilized one of these sources" (kit homes or plan book home). 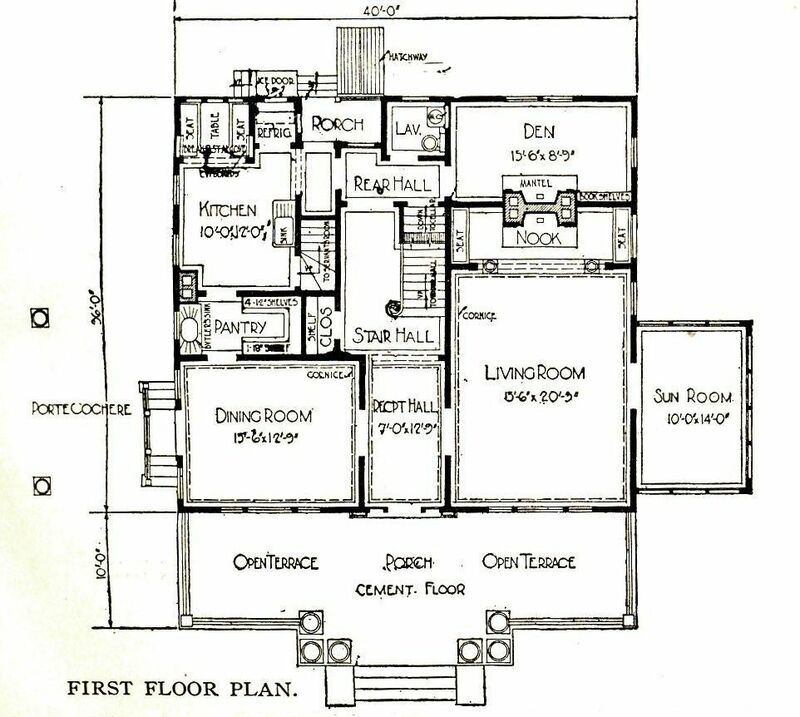 Well, I can't rule out plan books, but I can rule out "kit house." The Black River Plantation is most assuredly not a kit house. Of that, I am sure. At least they admitted that it was definitely NOT a kit home from Montgomery Ward. In all fairness, not as much was known then (in 1994) as is known now about Sears kit homes. However, this pernicious rumor - that the house featured in The Notebook is a Sears Magnolia - seems to have taken on a life of its own. On a happier note, look at some pictures of real Magnolias here. And if you know of any REAL Magnolias, please leave a comment.